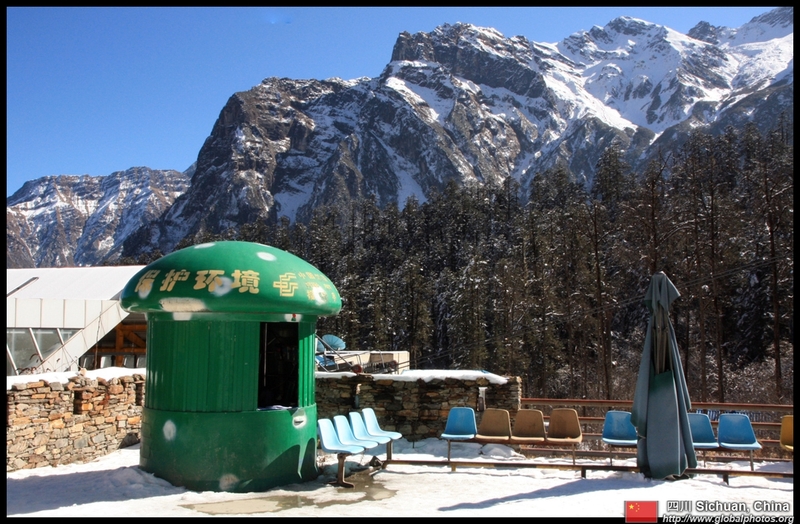 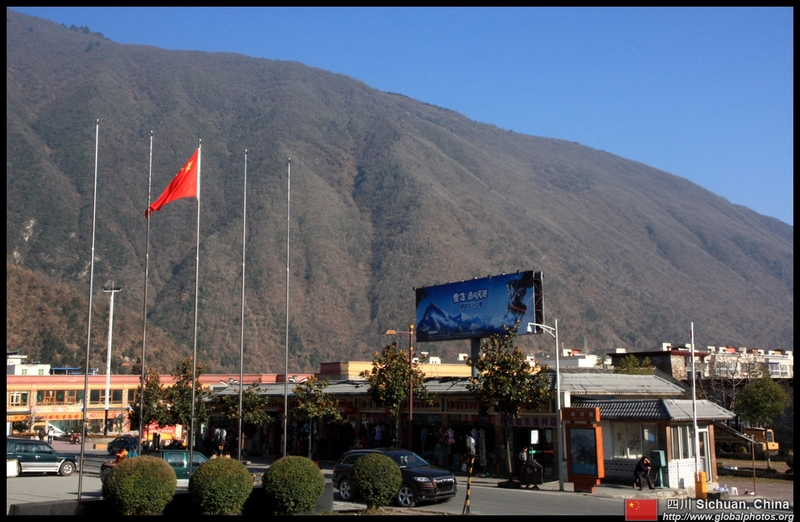 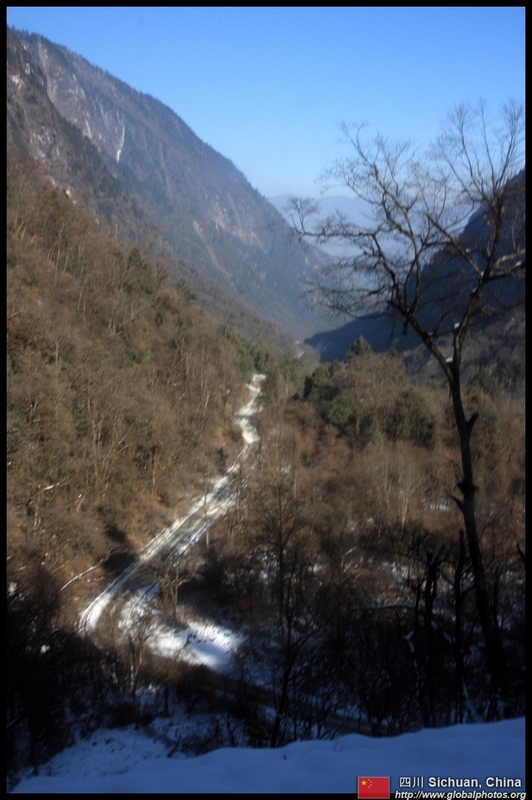 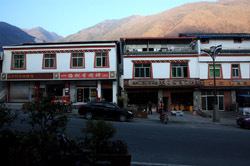 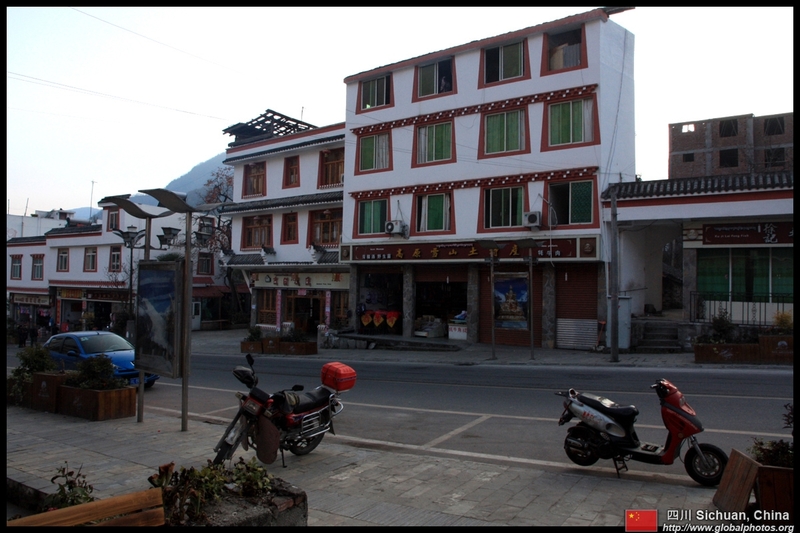 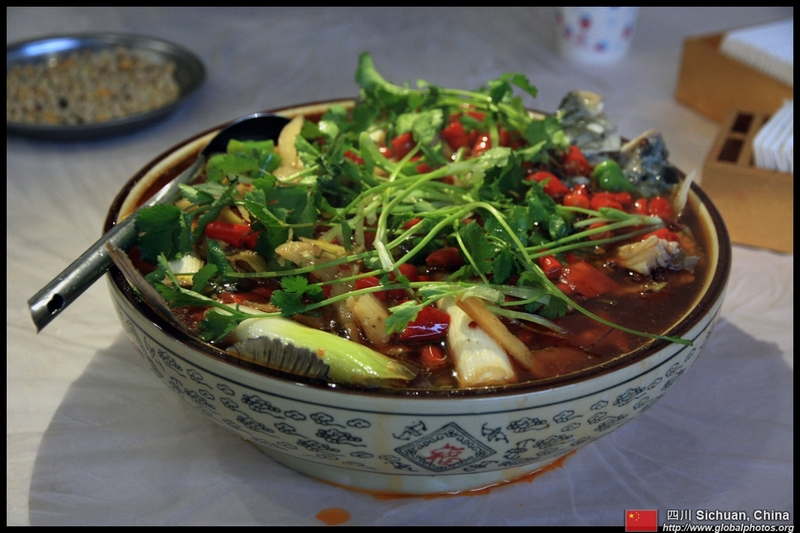 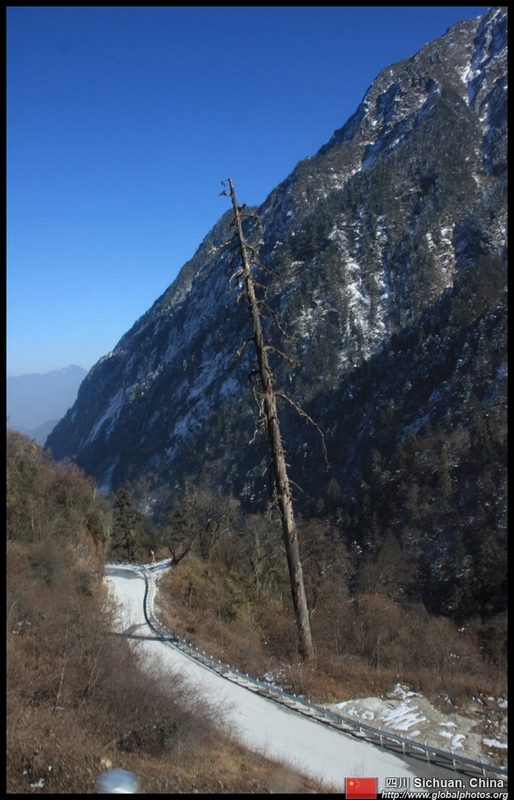 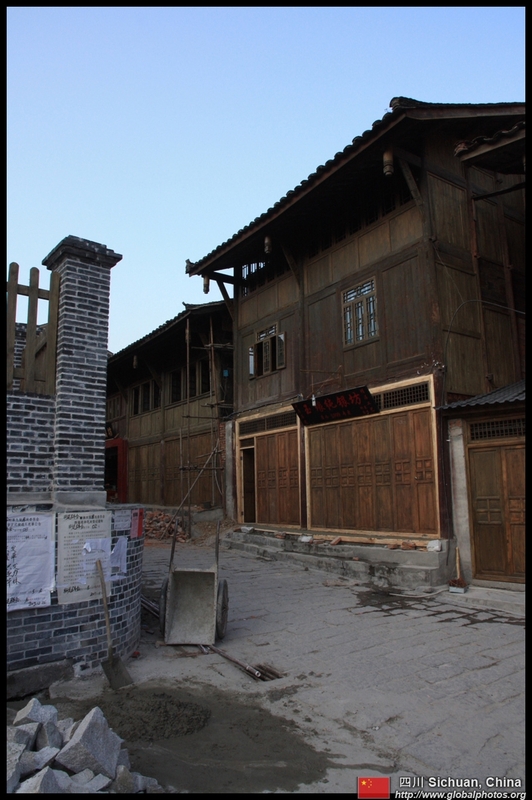 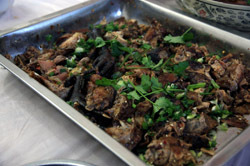 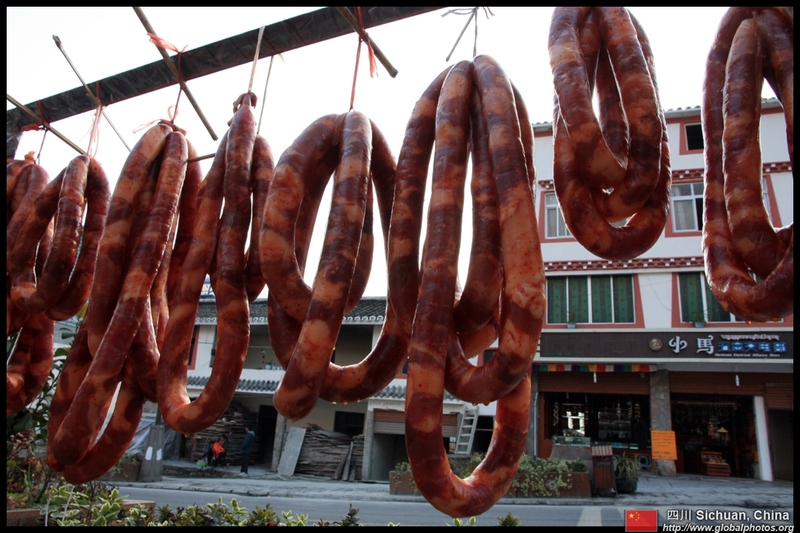 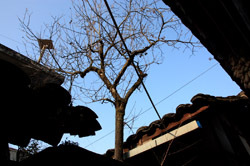 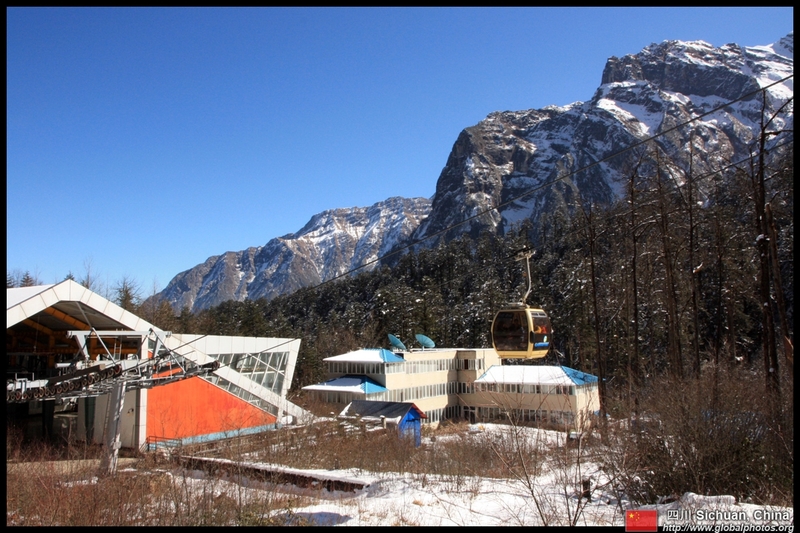 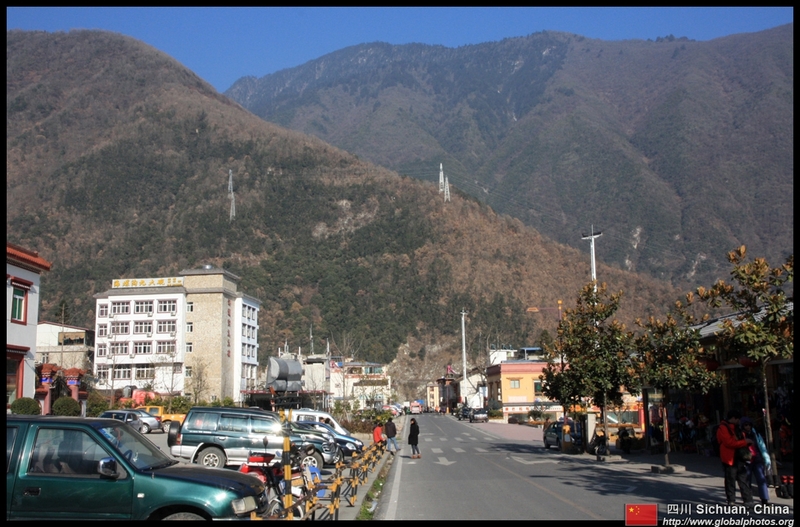 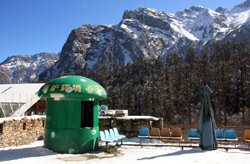 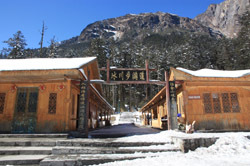 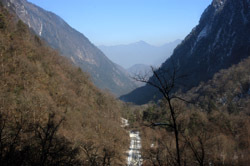 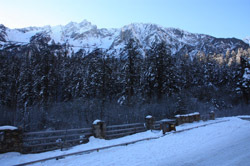 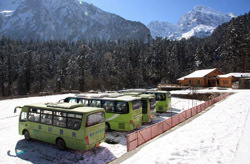 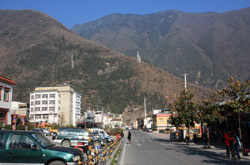 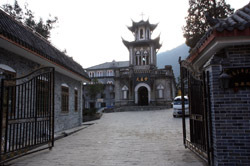 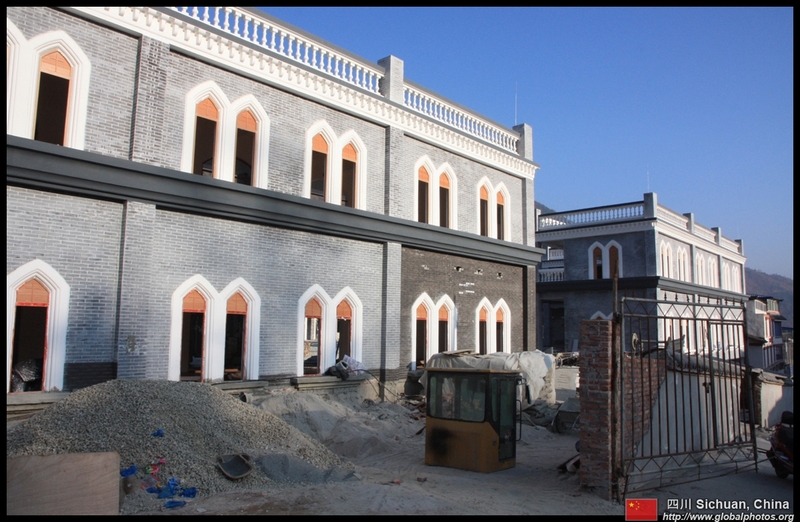 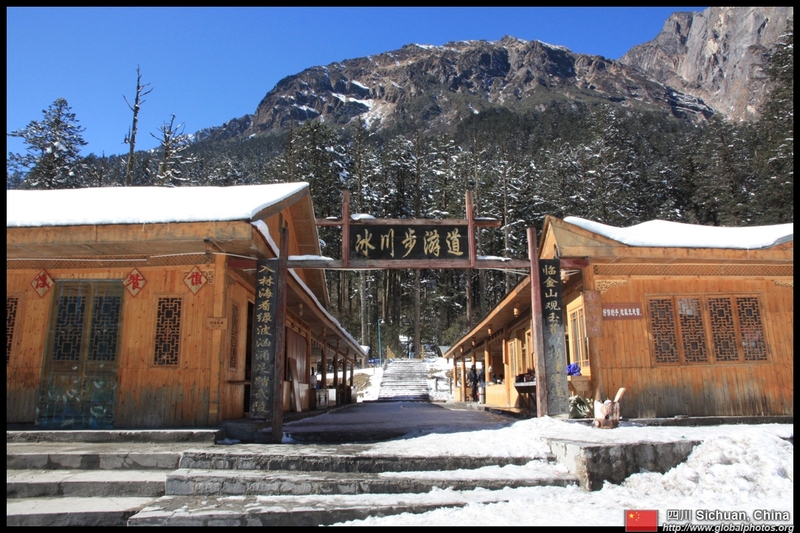 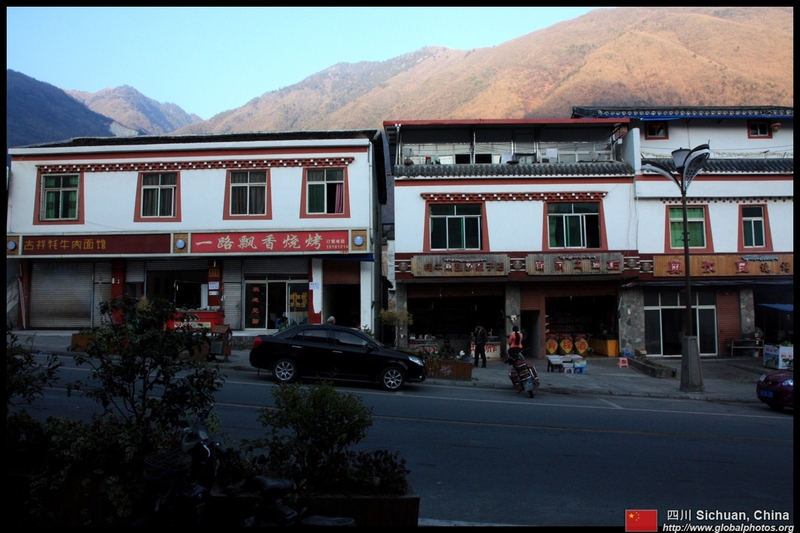 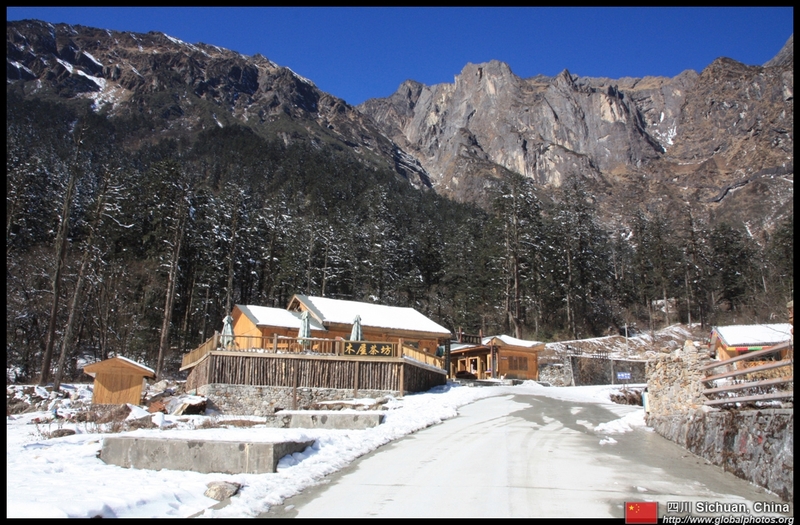 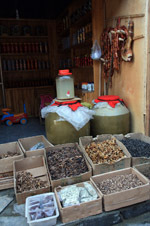 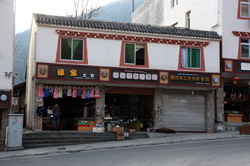 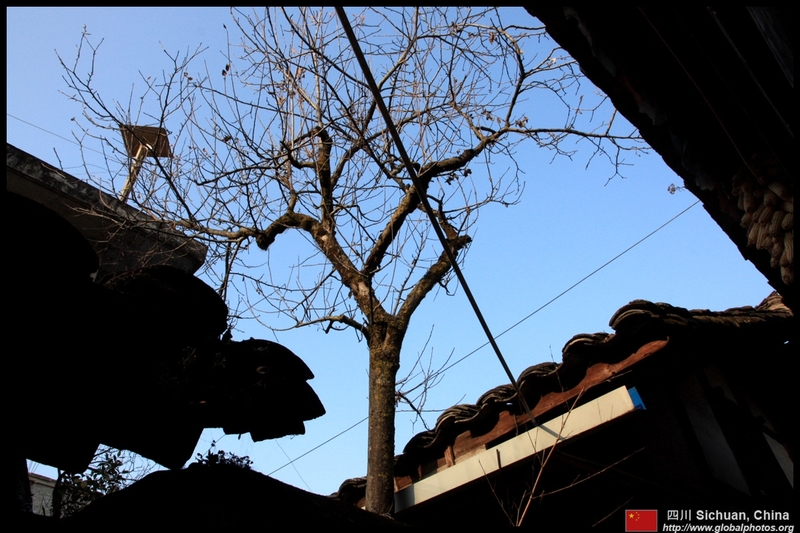 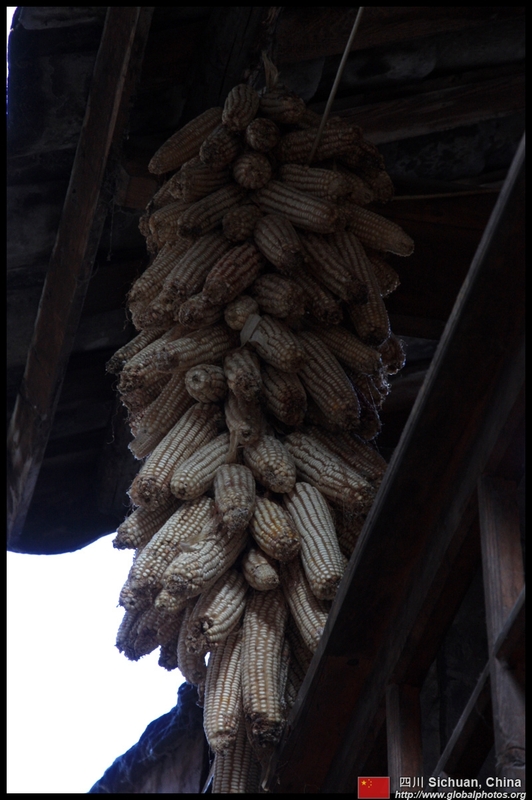 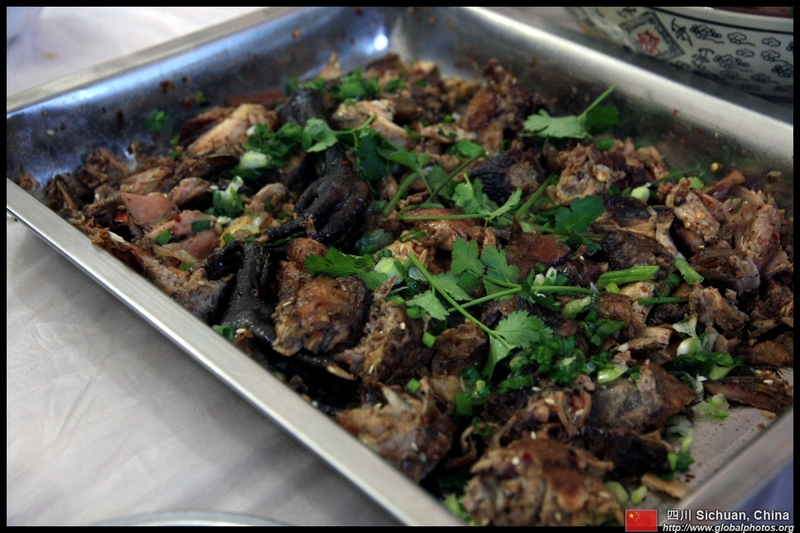 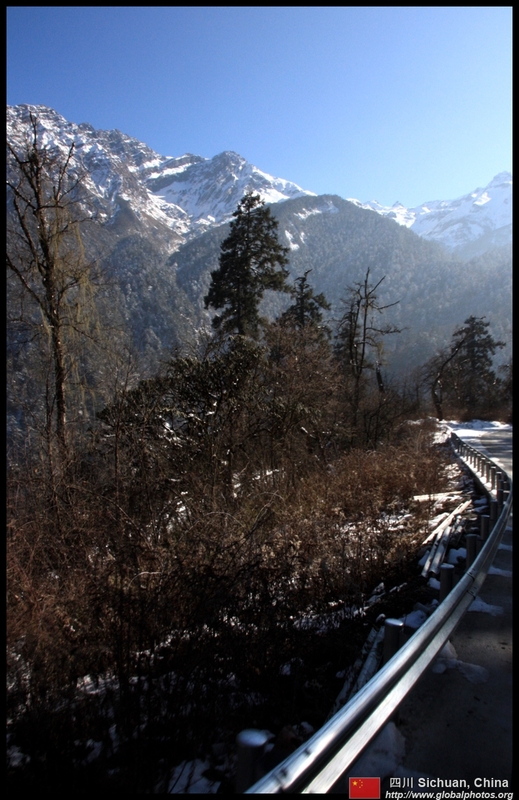 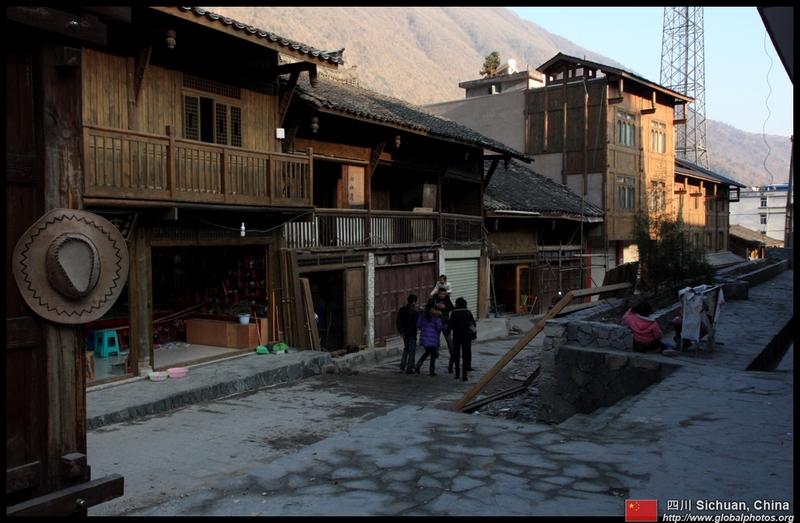 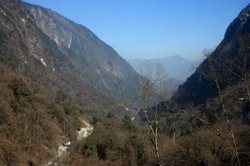 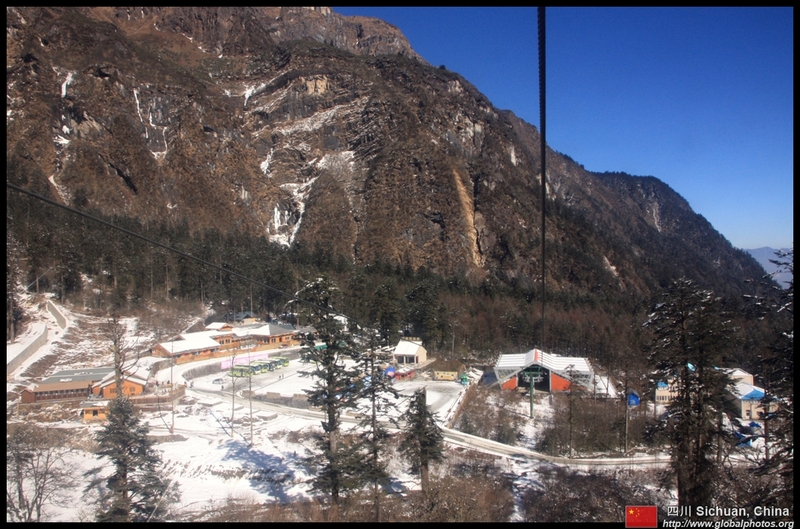 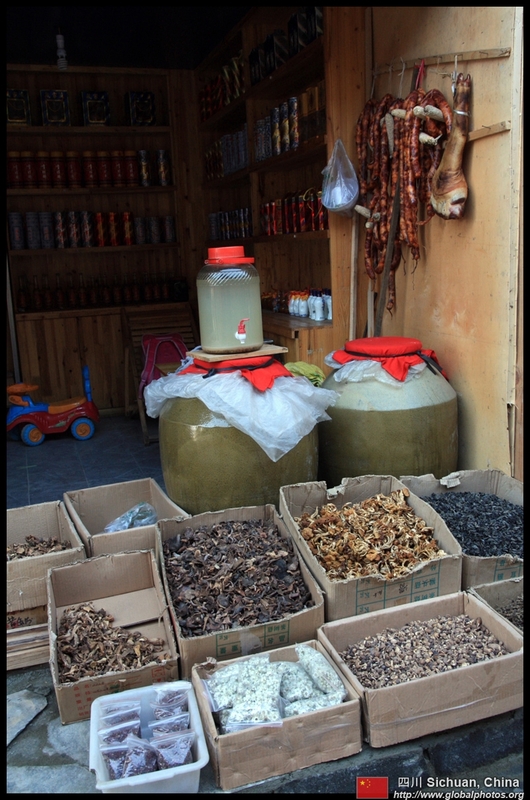 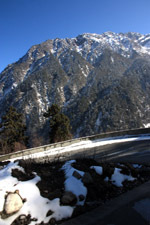 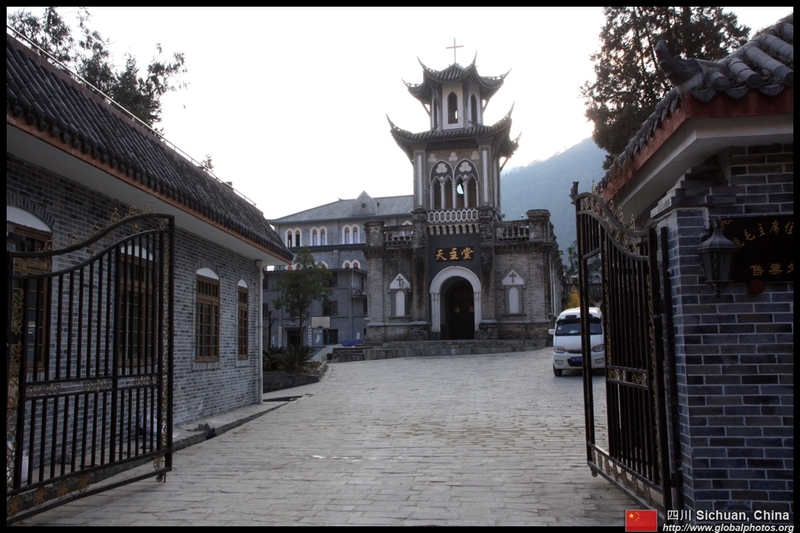 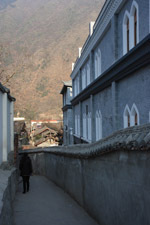 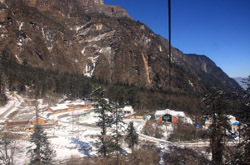 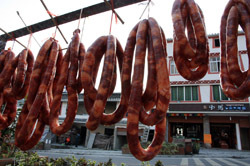 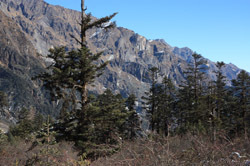 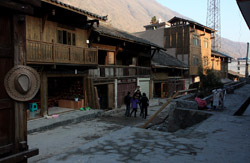 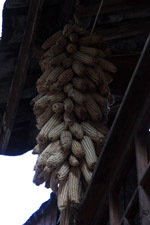 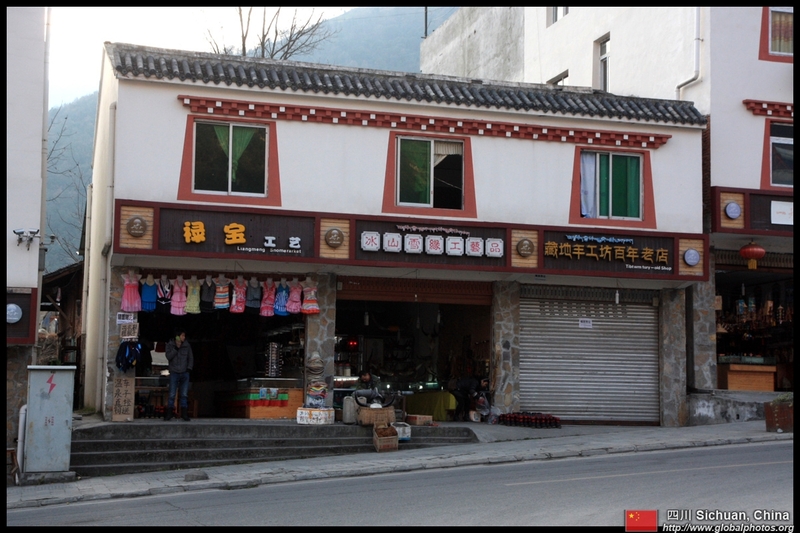 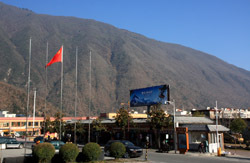 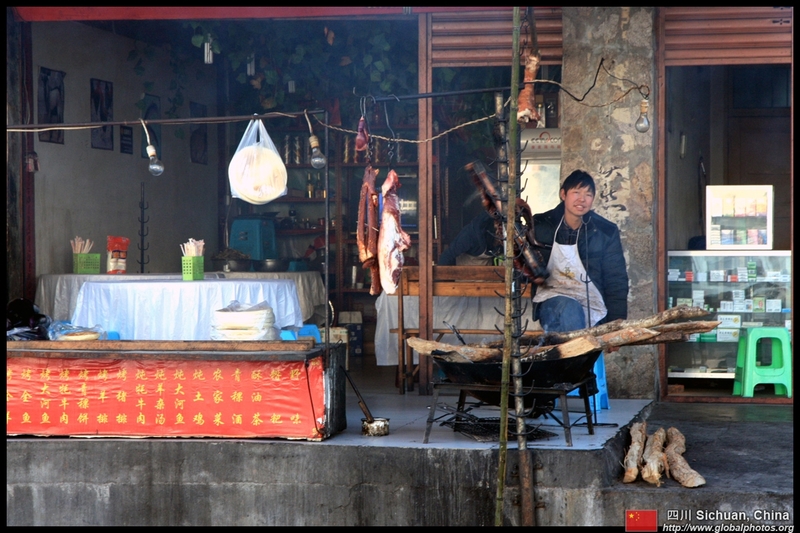 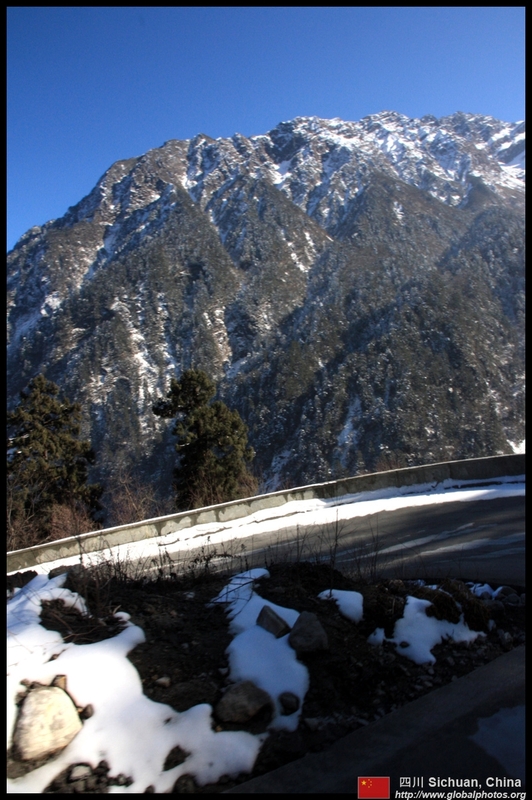 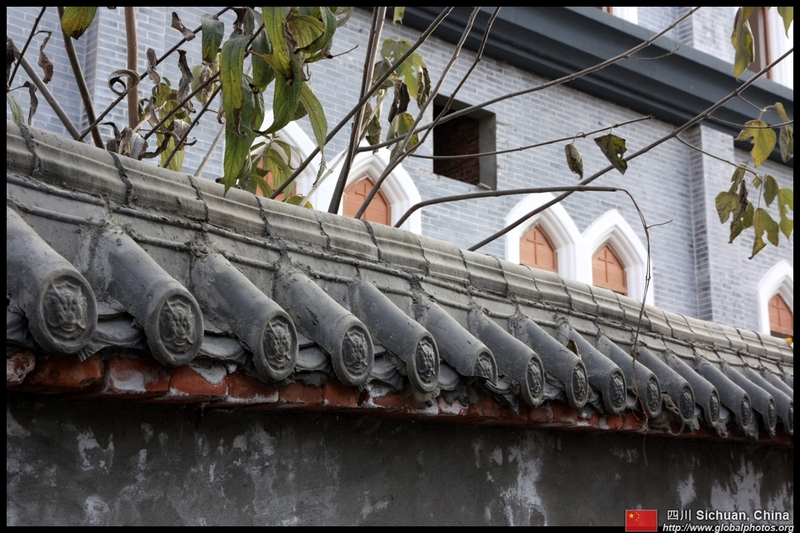 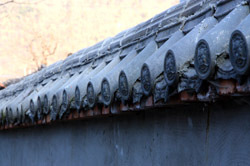 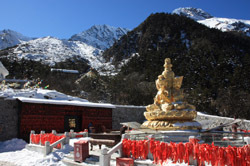 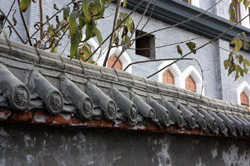 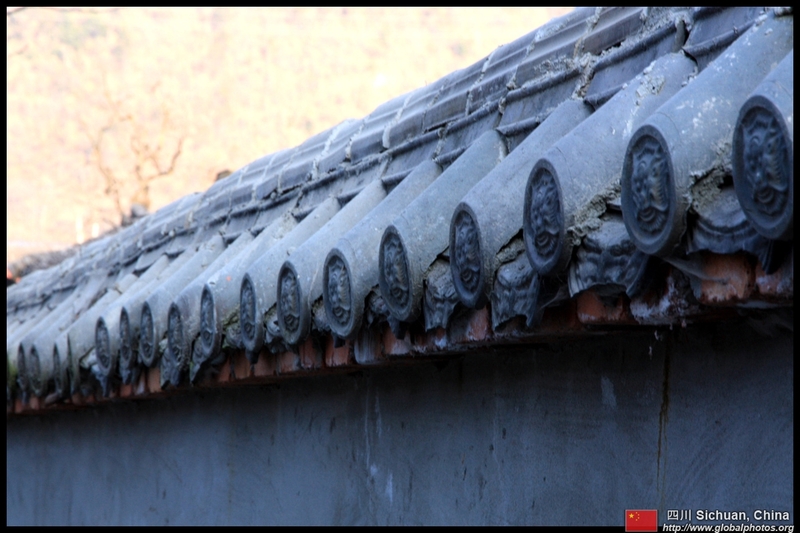 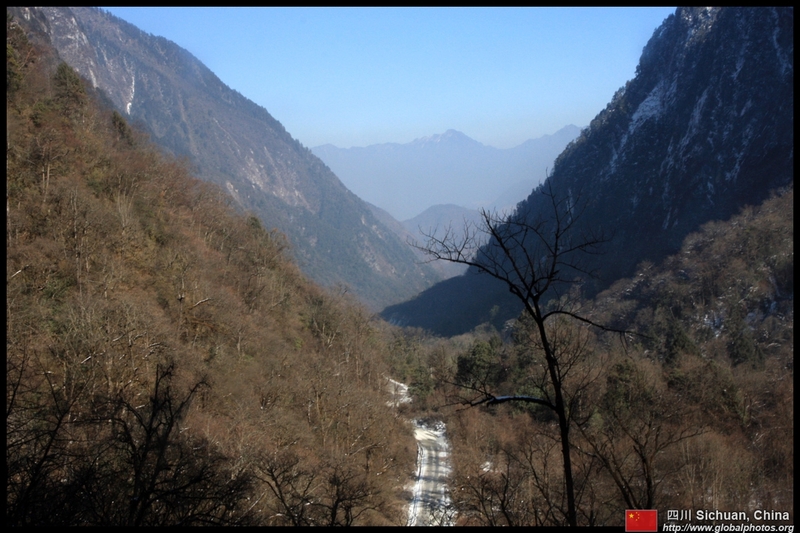 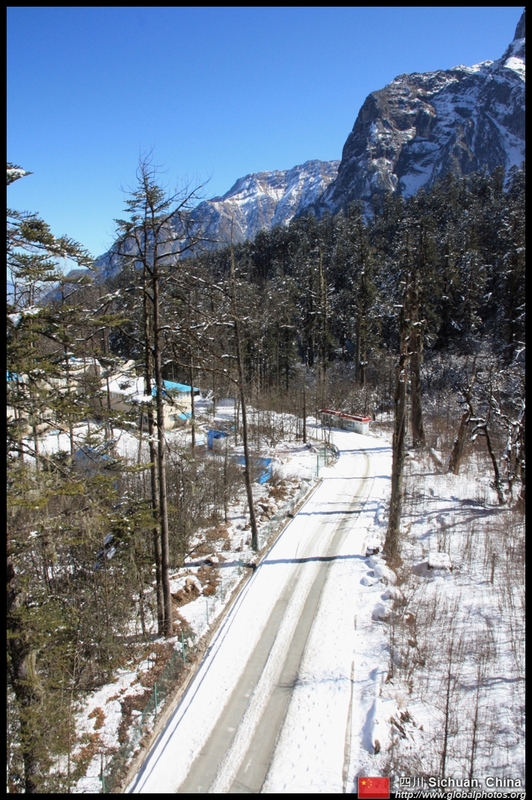 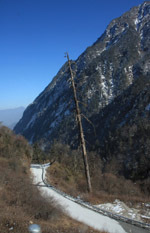 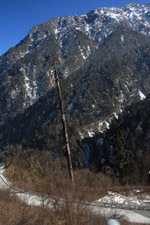 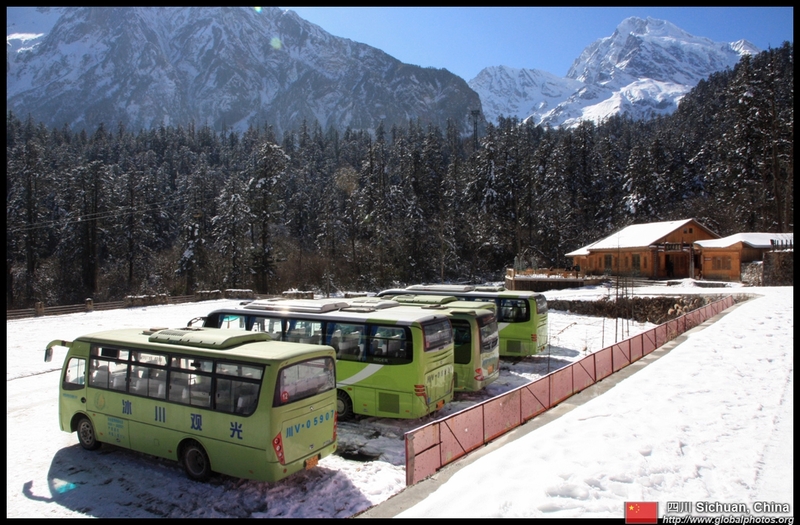 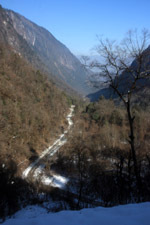 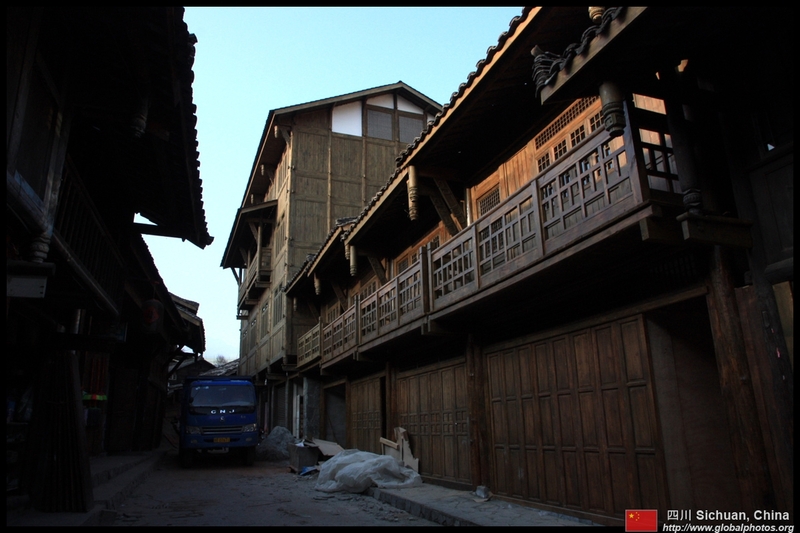 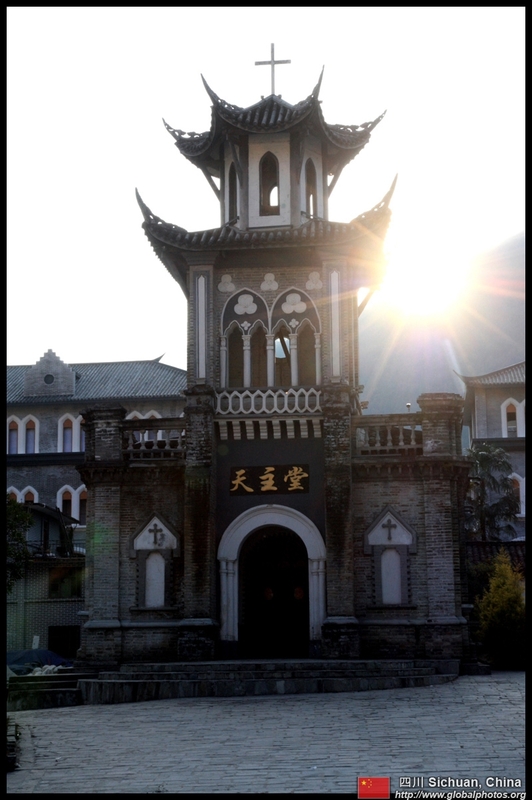 Hailougou is a long 6-hour bus ride from Chengdu, although the journey time can increase substantially as a major proportion of the route goes through narrow mountain roads. 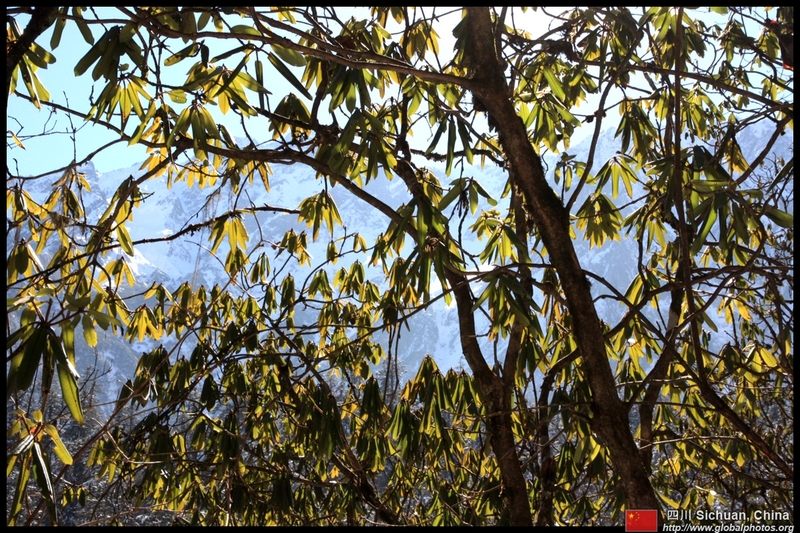 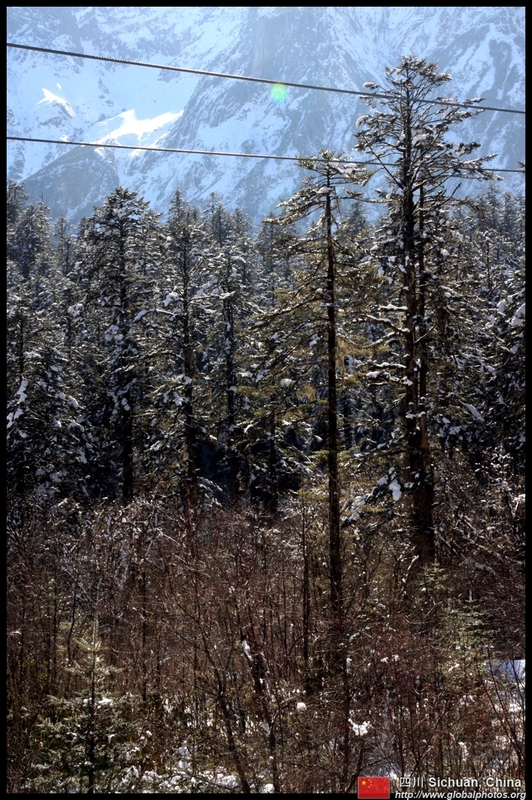 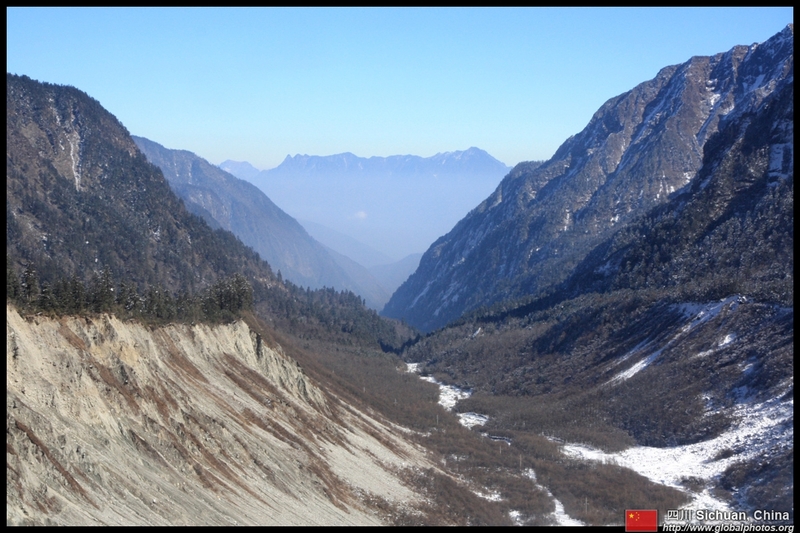 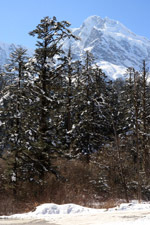 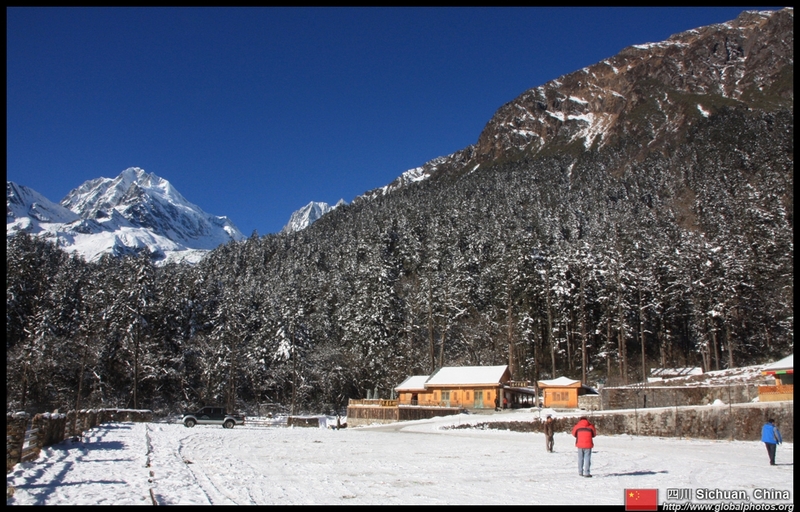 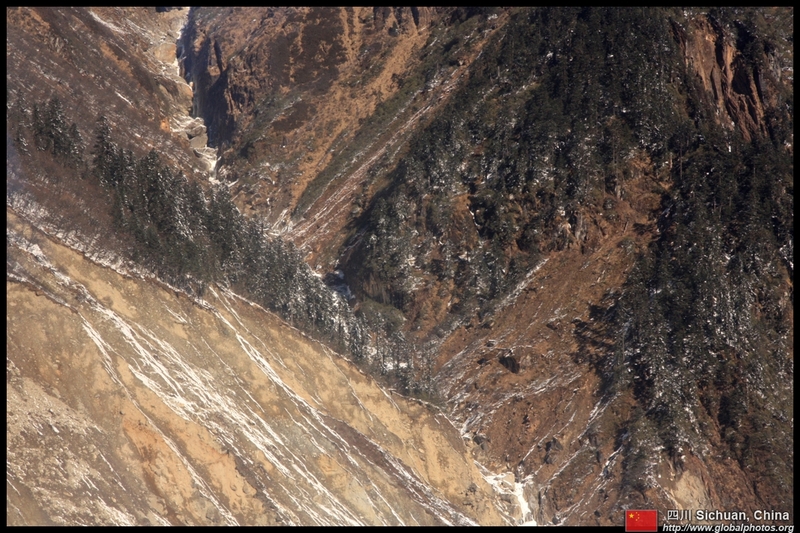 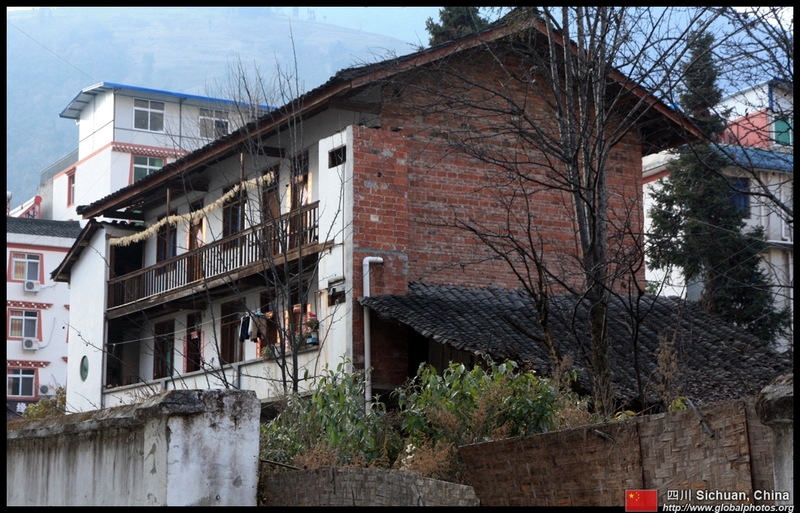 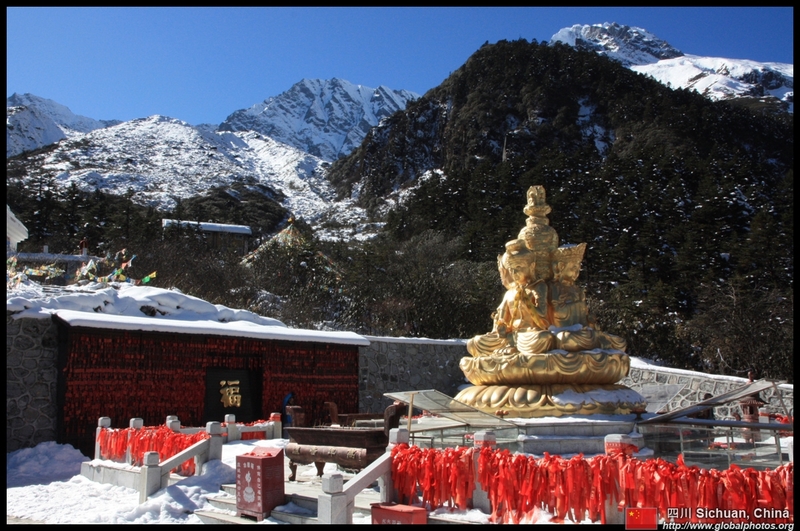 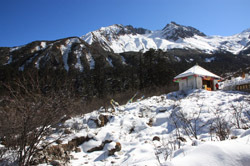 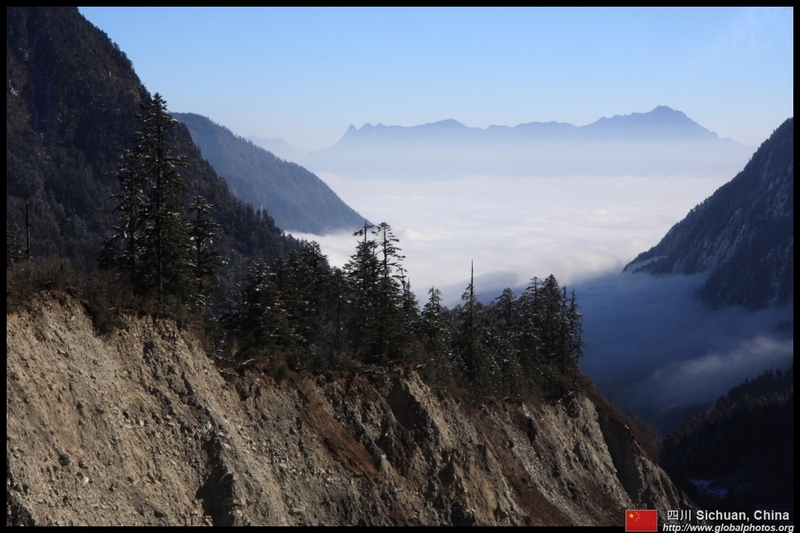 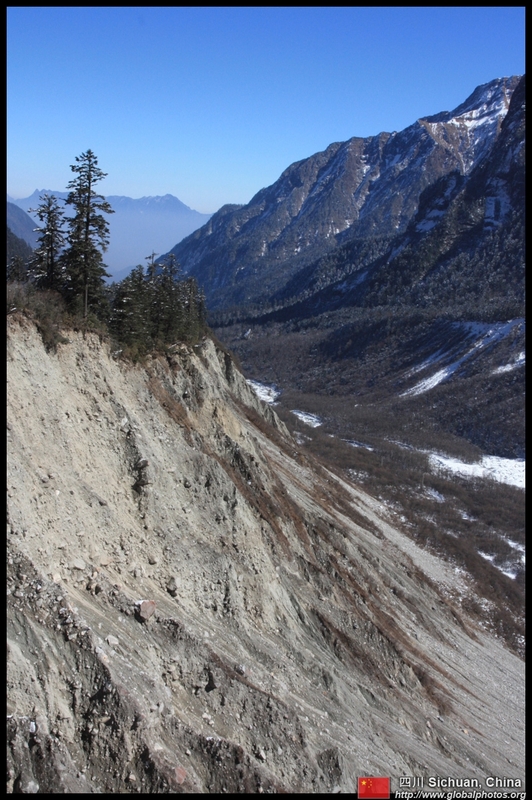 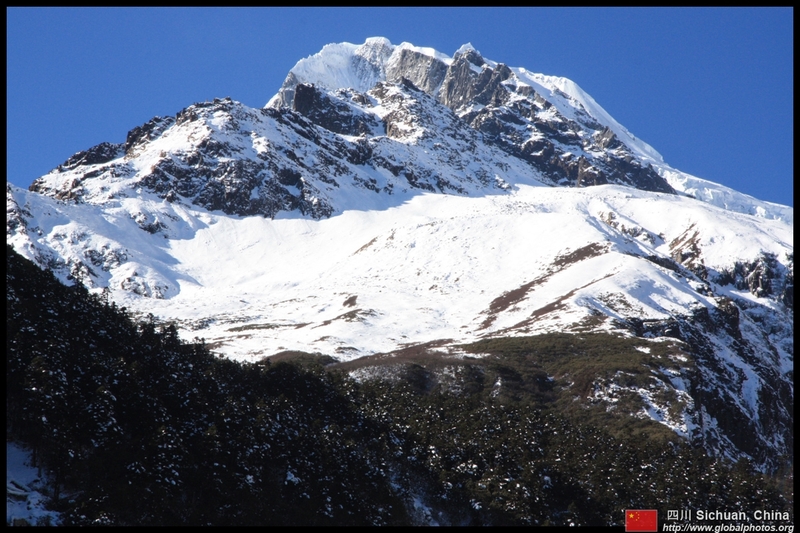 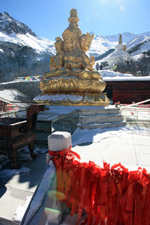 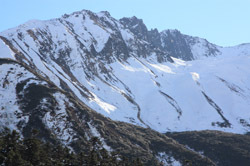 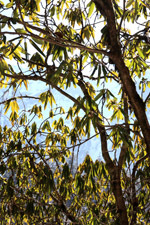 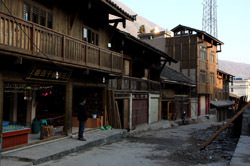 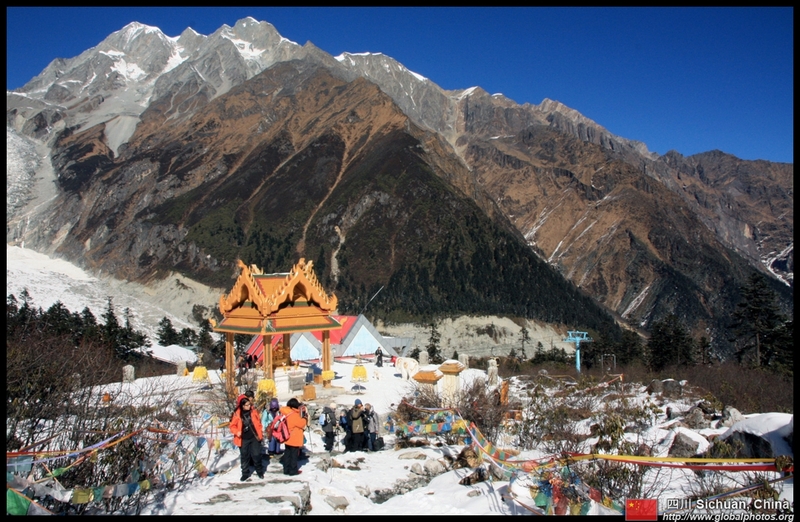 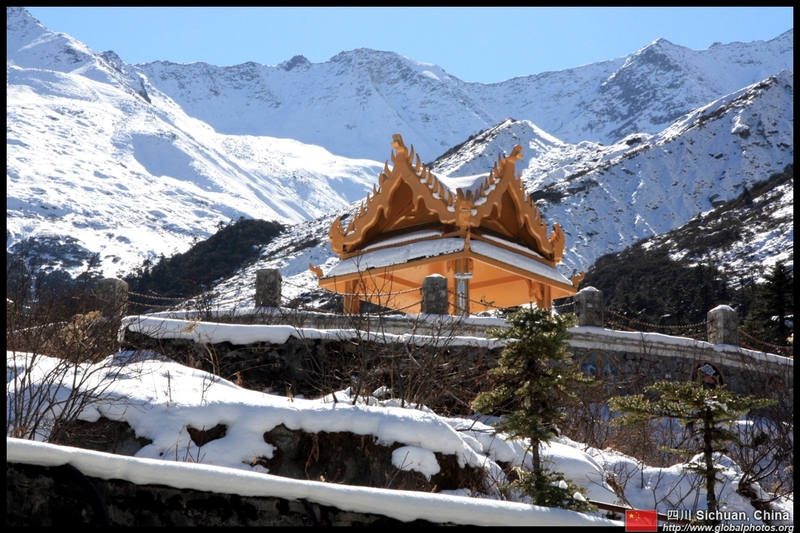 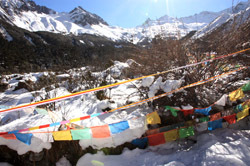 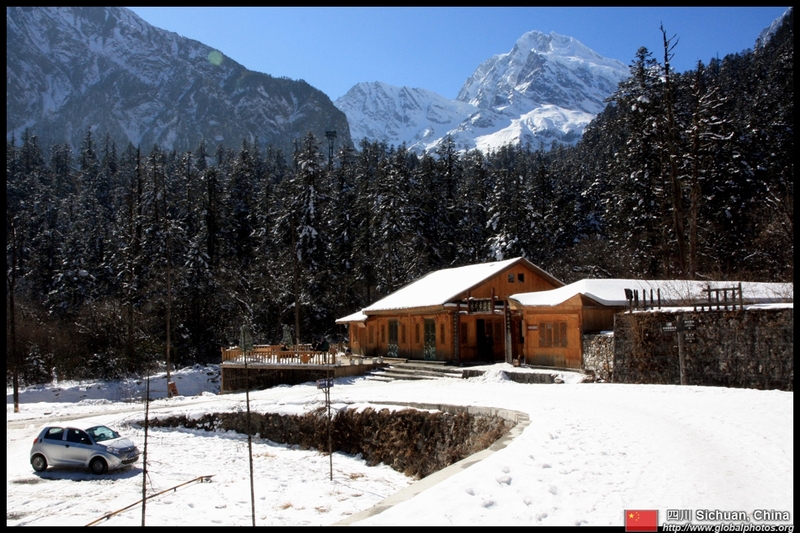 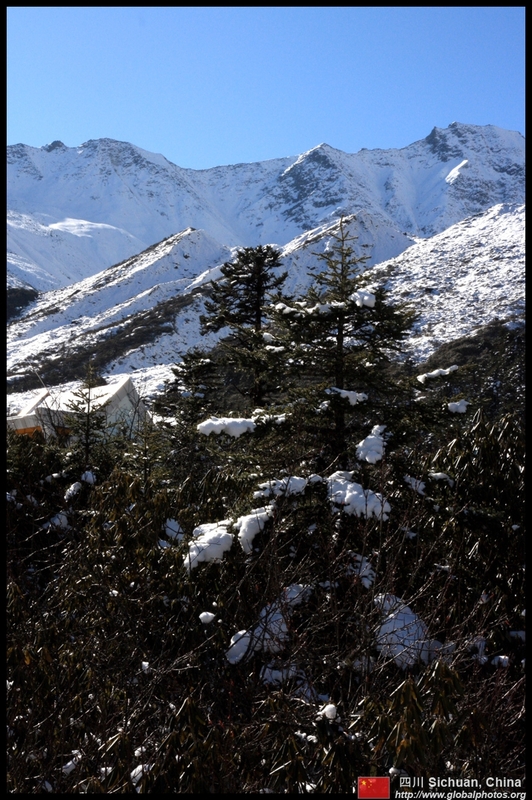 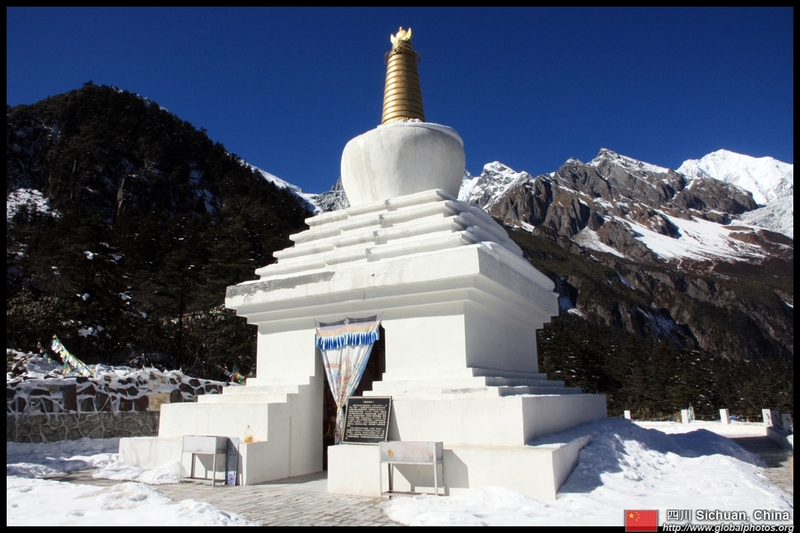 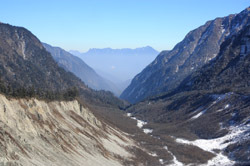 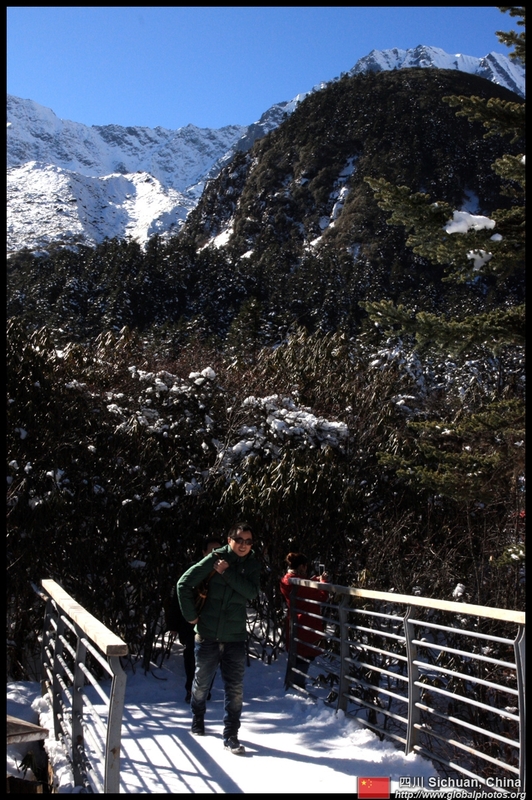 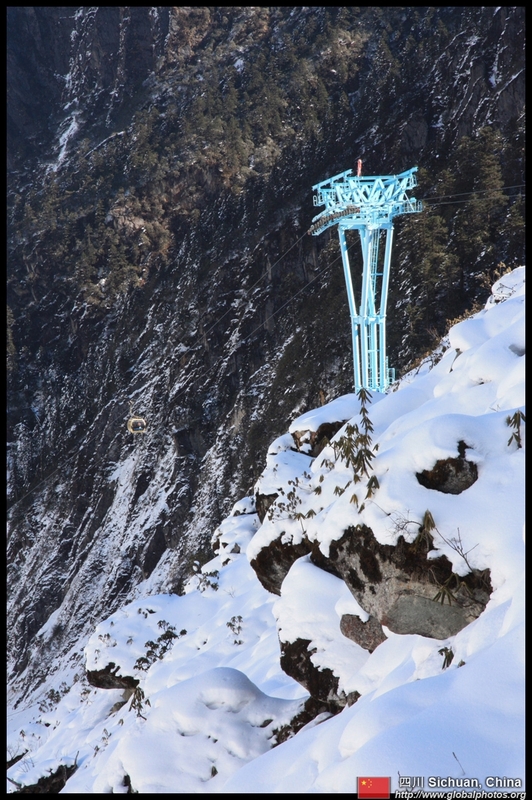 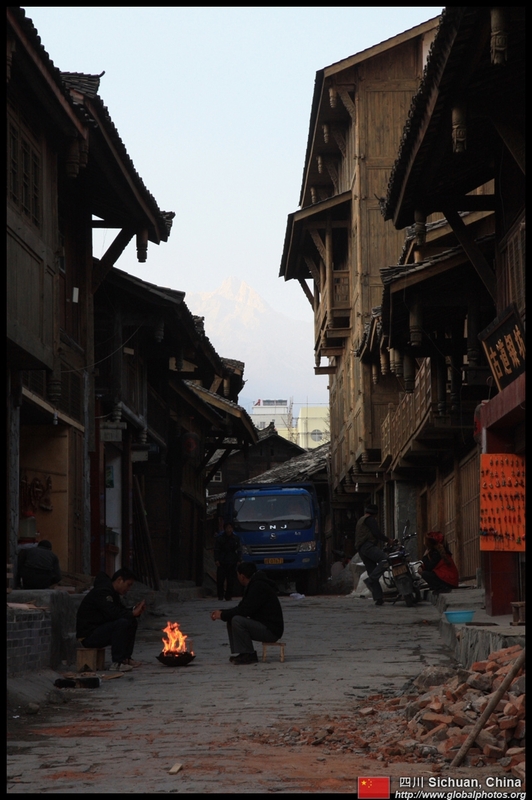 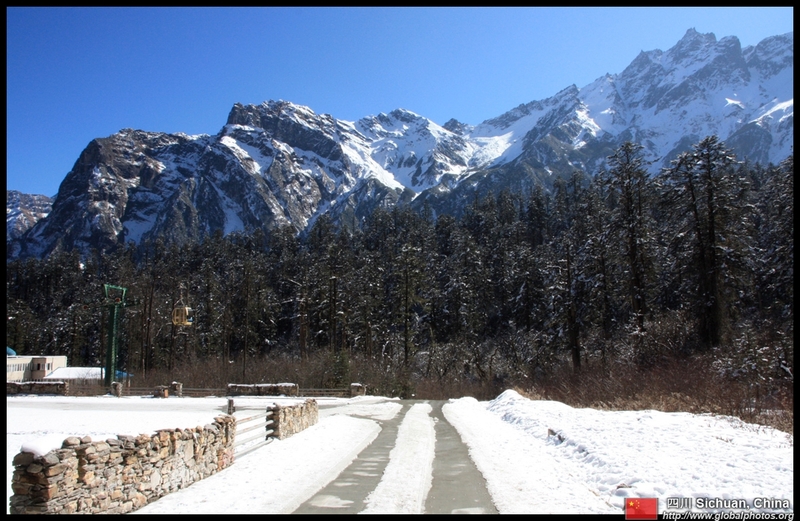 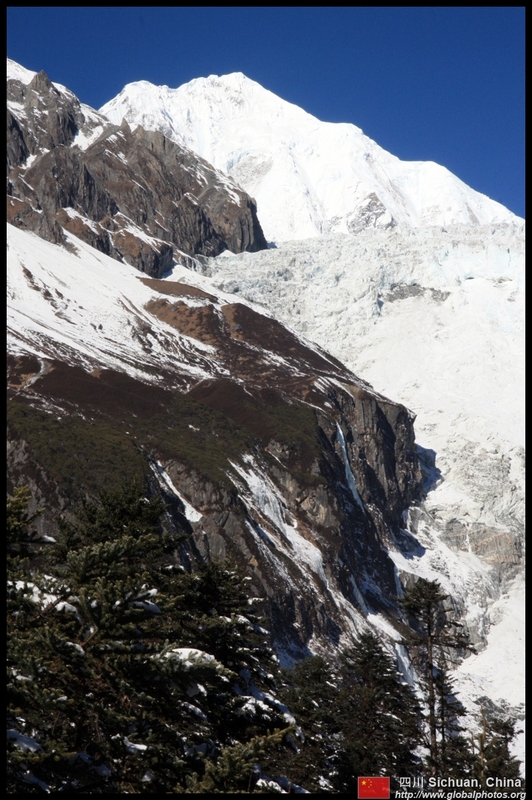 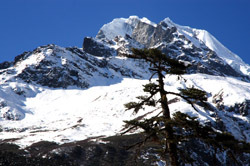 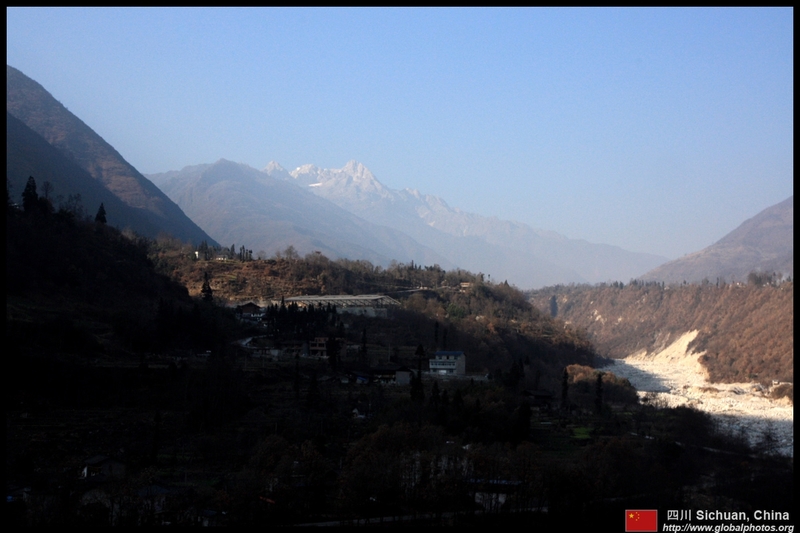 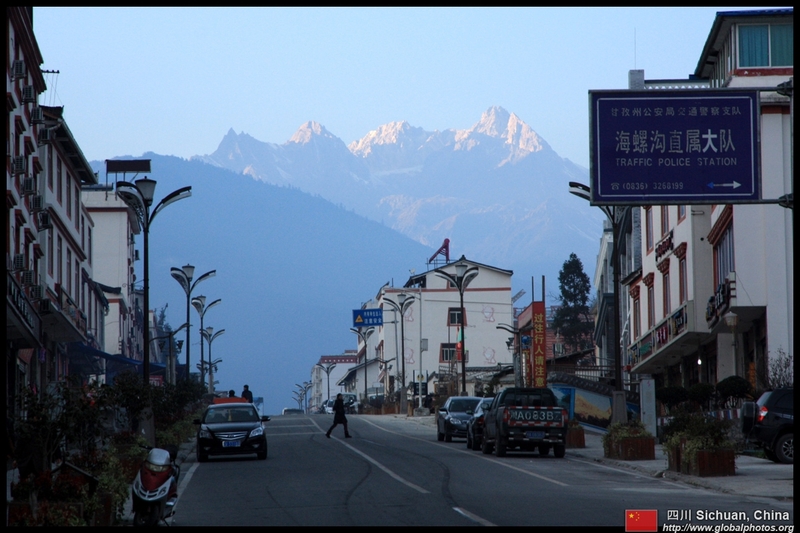 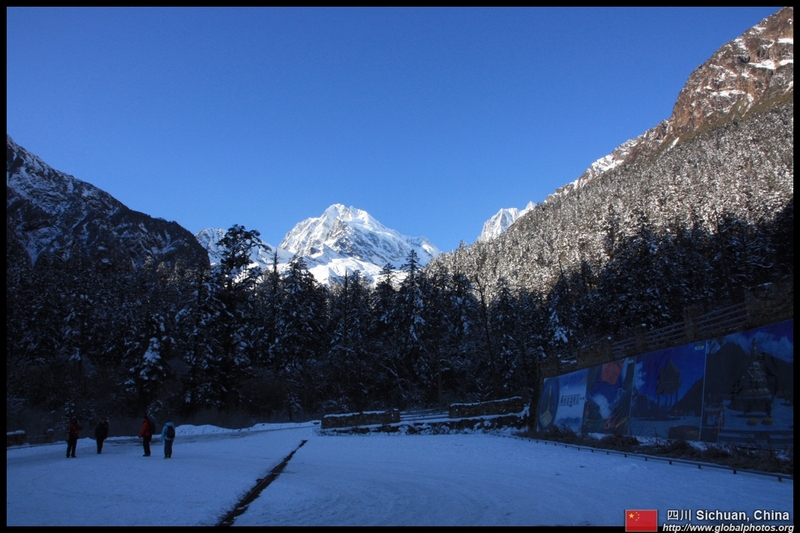 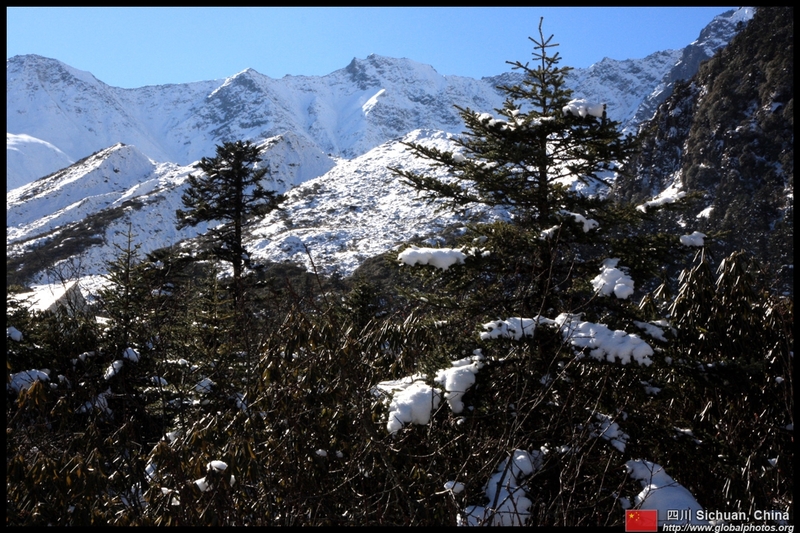 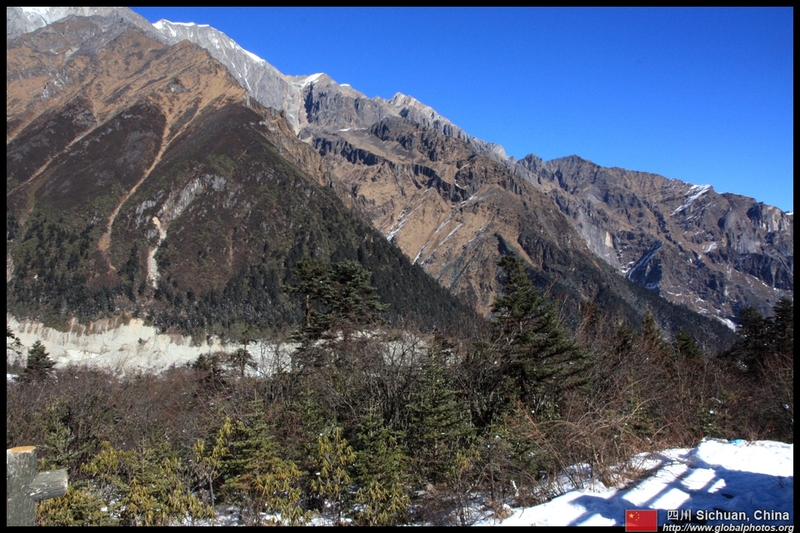 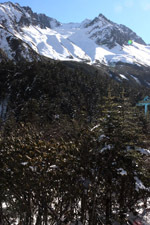 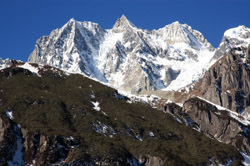 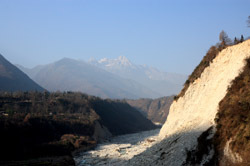 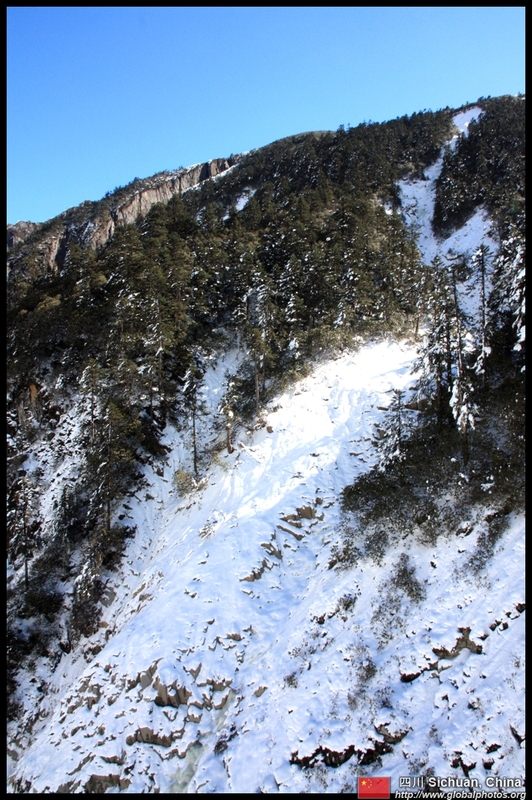 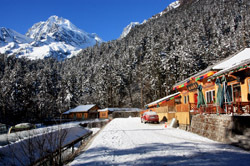 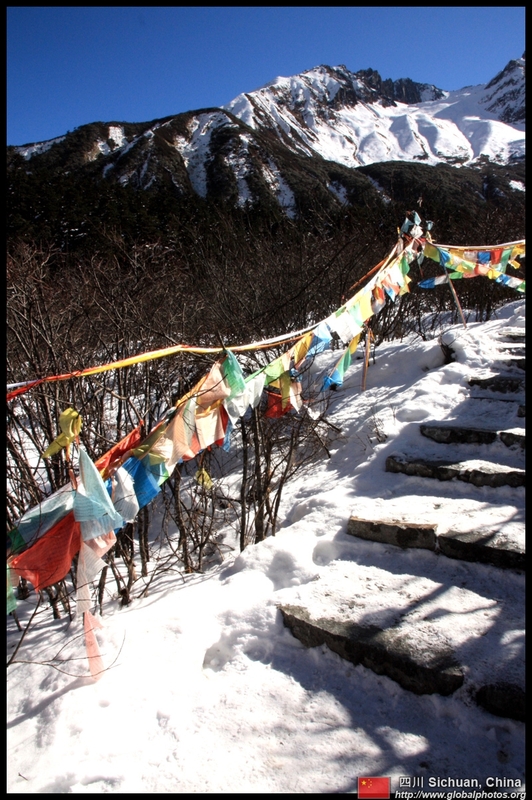 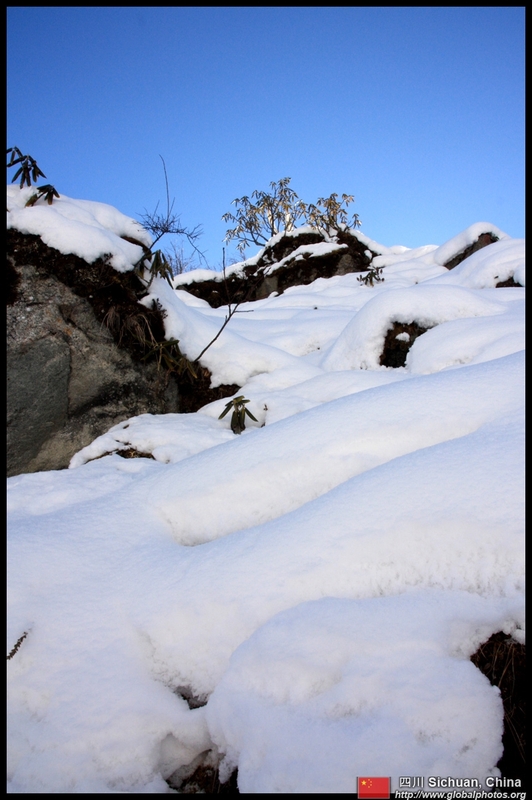 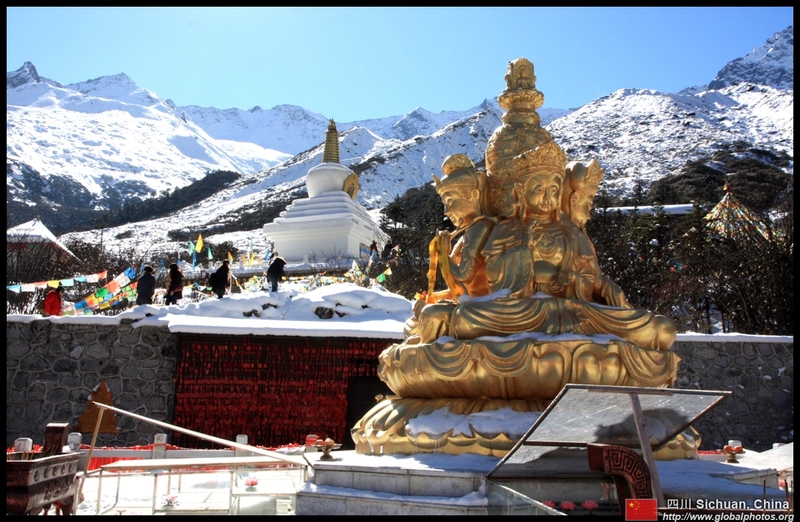 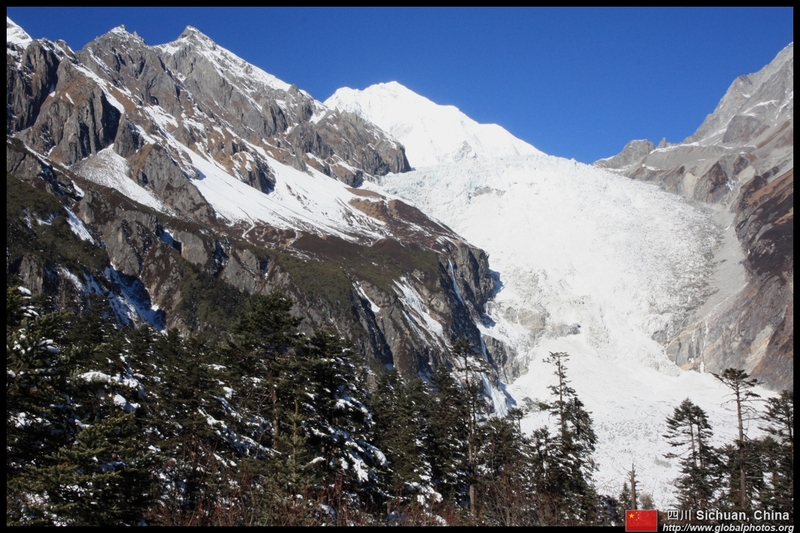 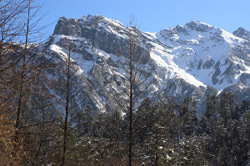 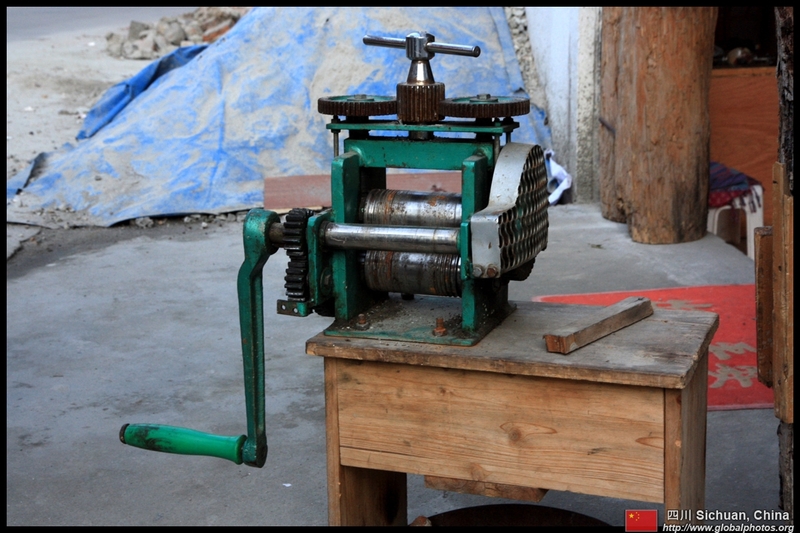 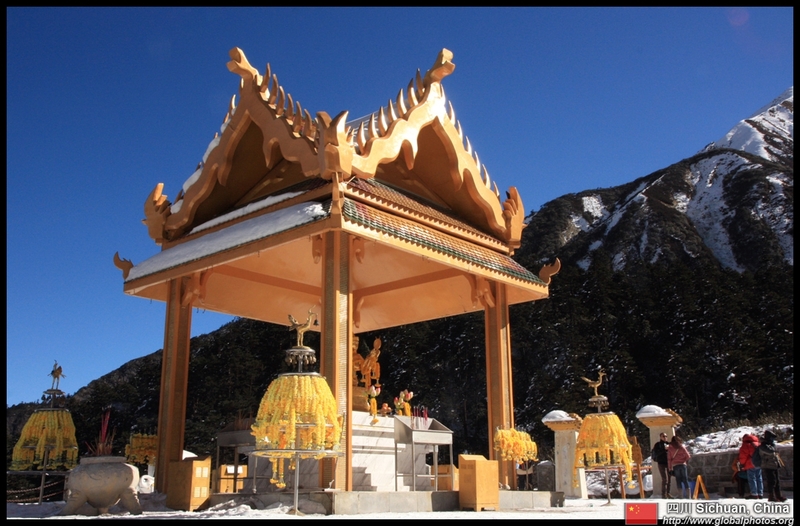 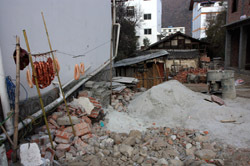 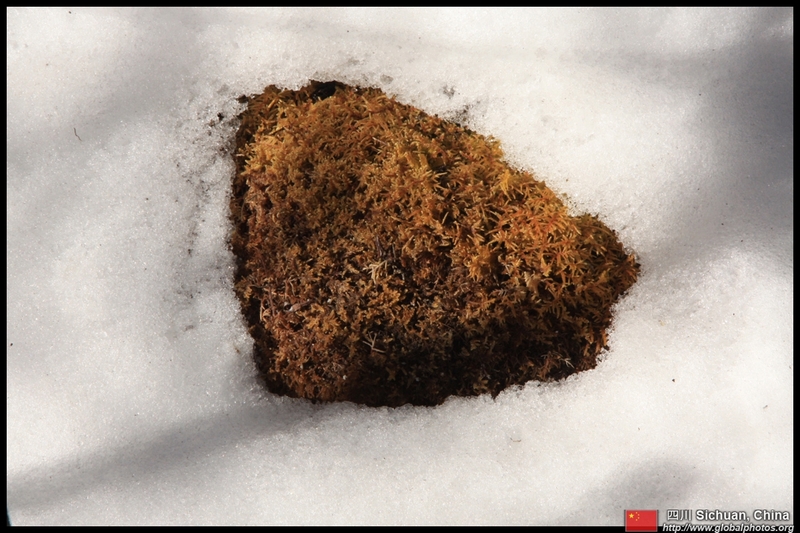 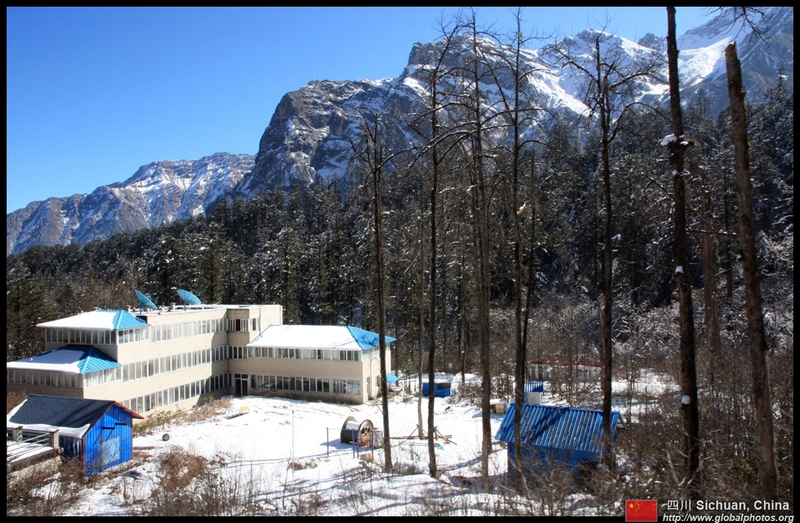 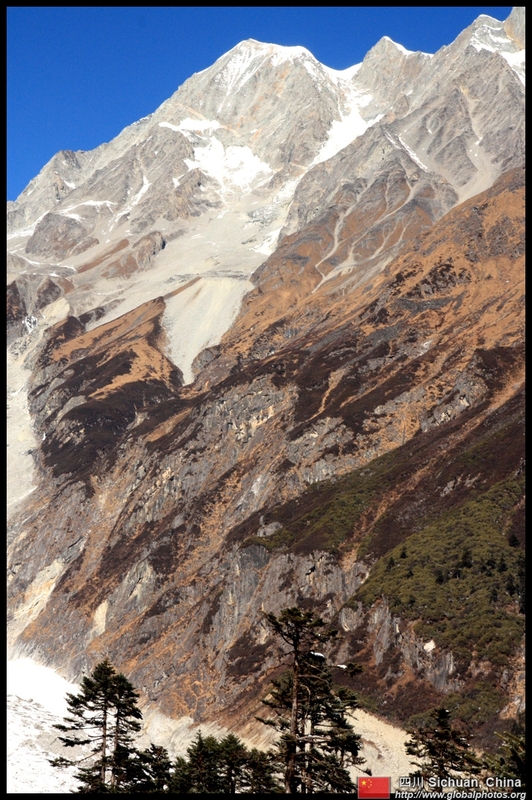 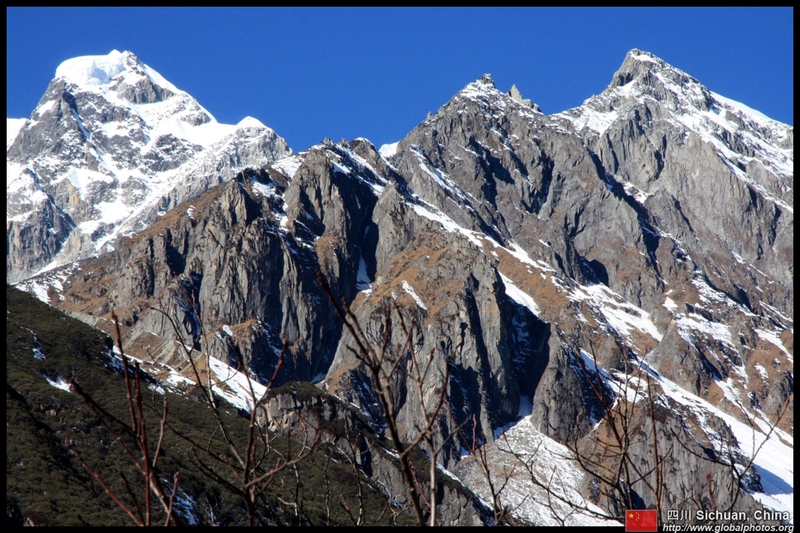 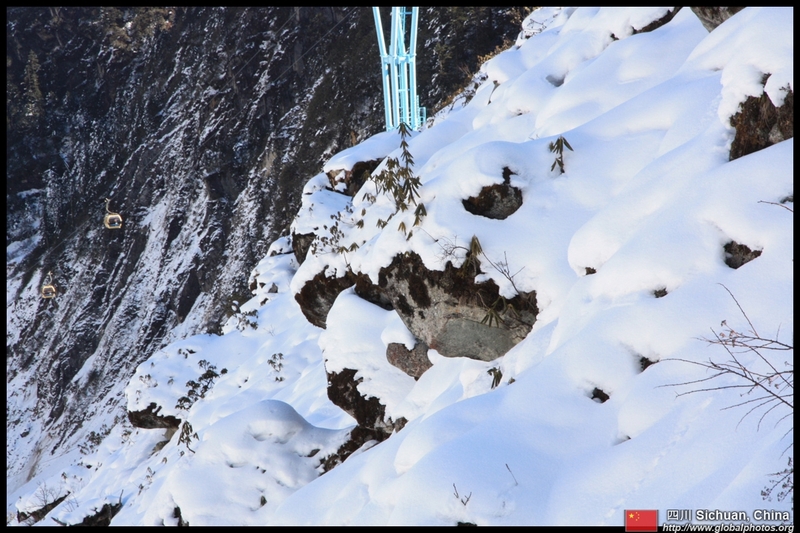 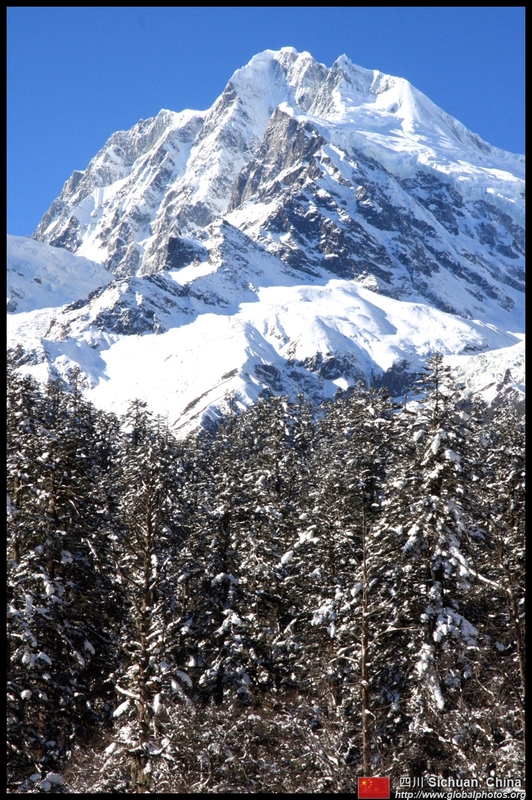 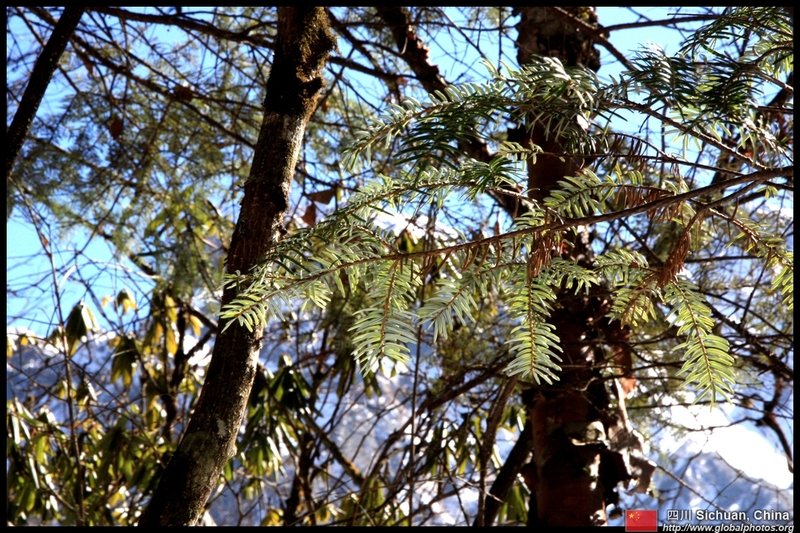 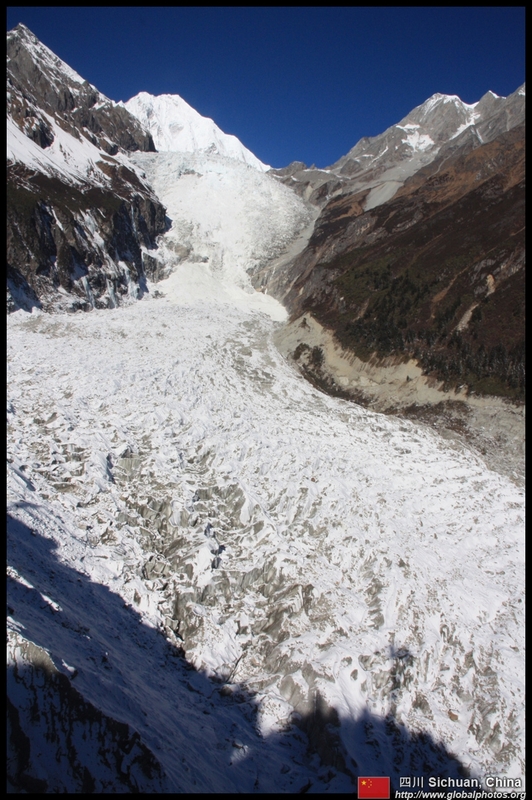 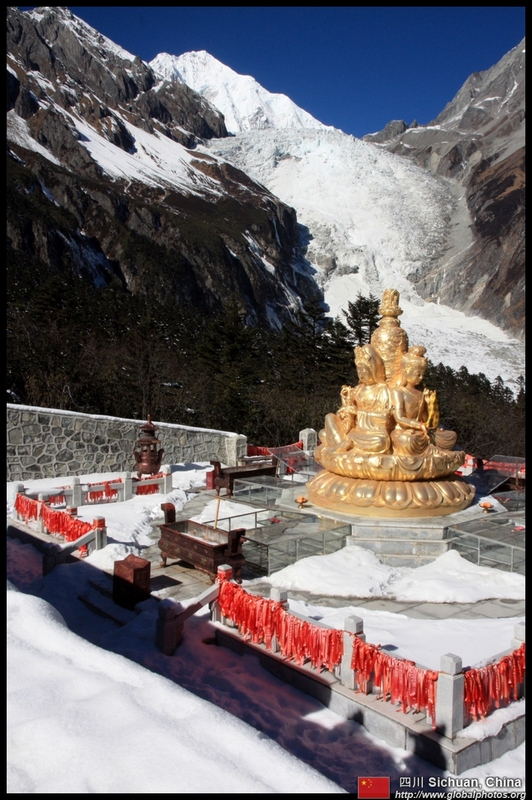 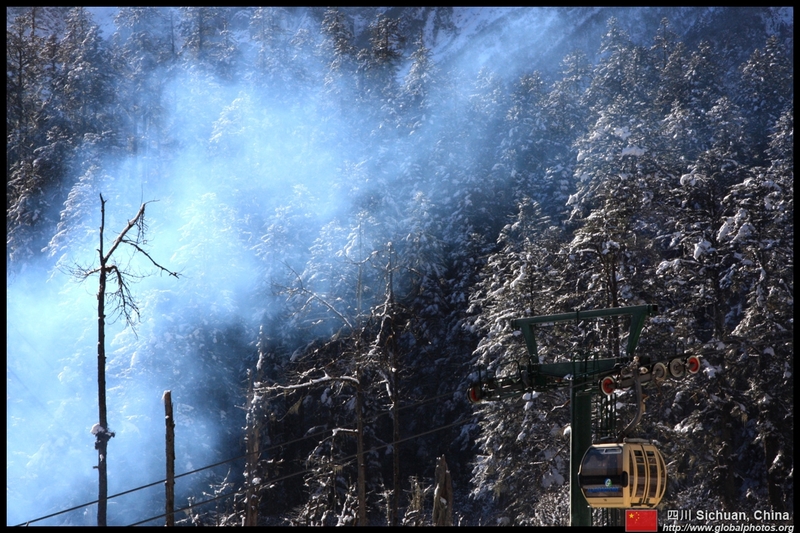 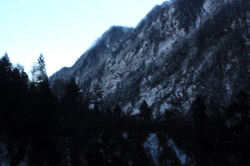 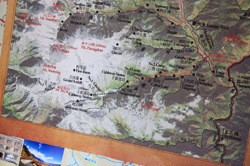 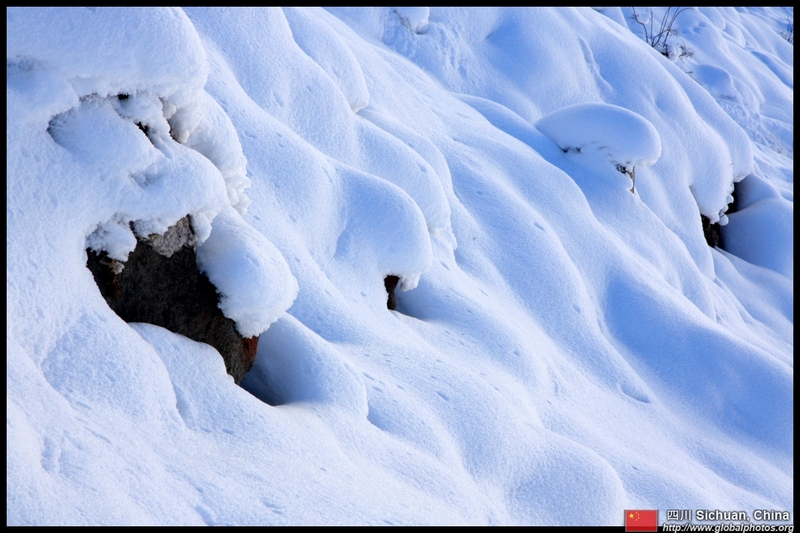 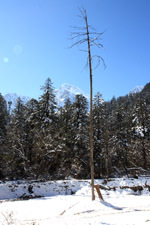 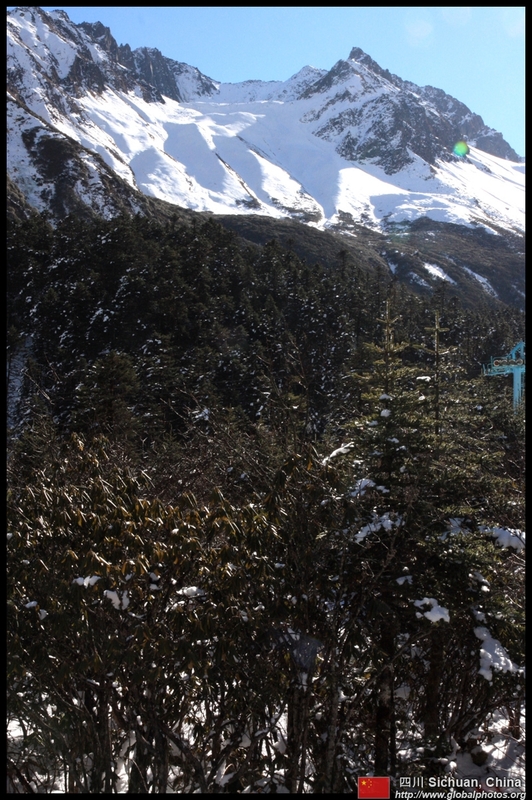 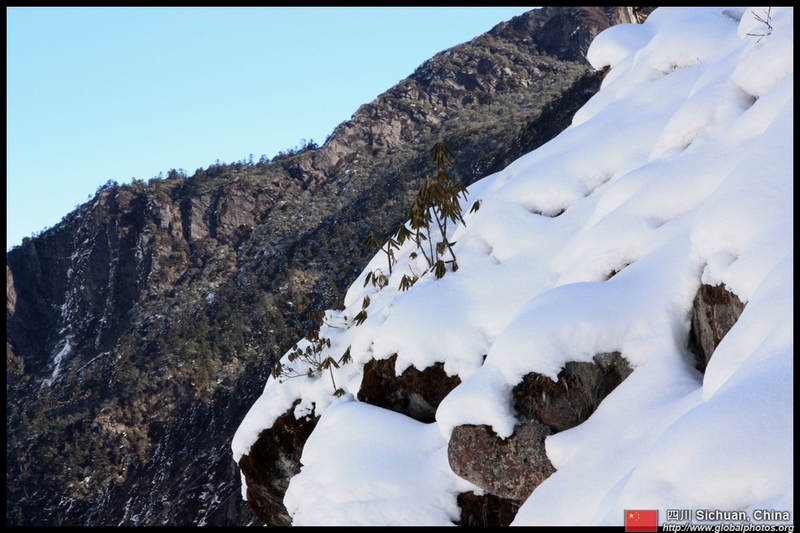 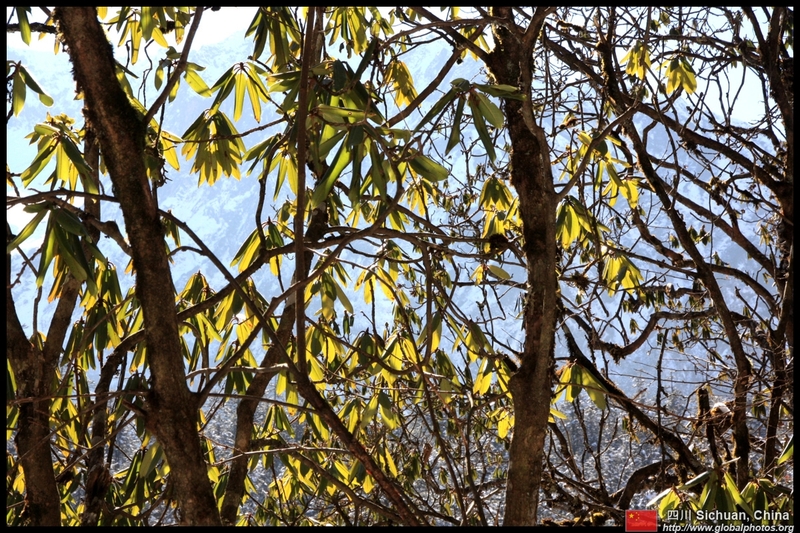 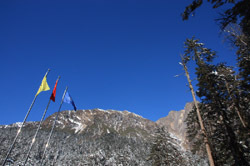 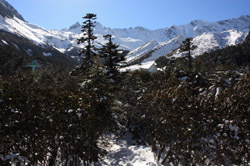 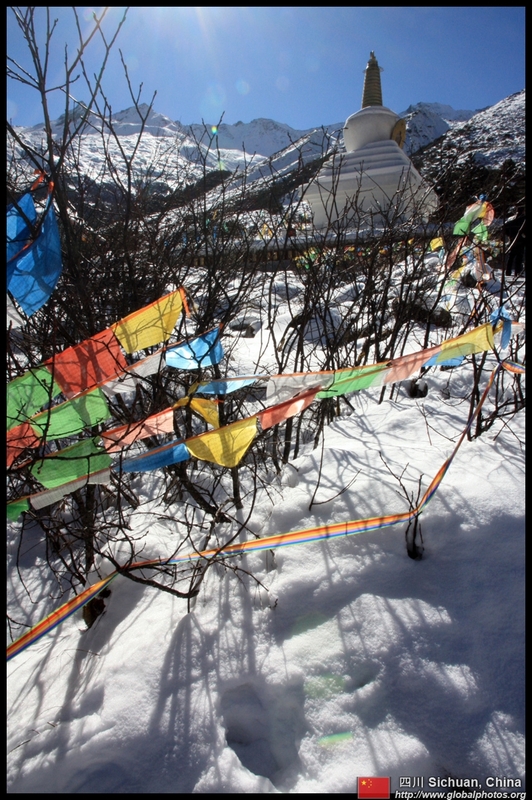 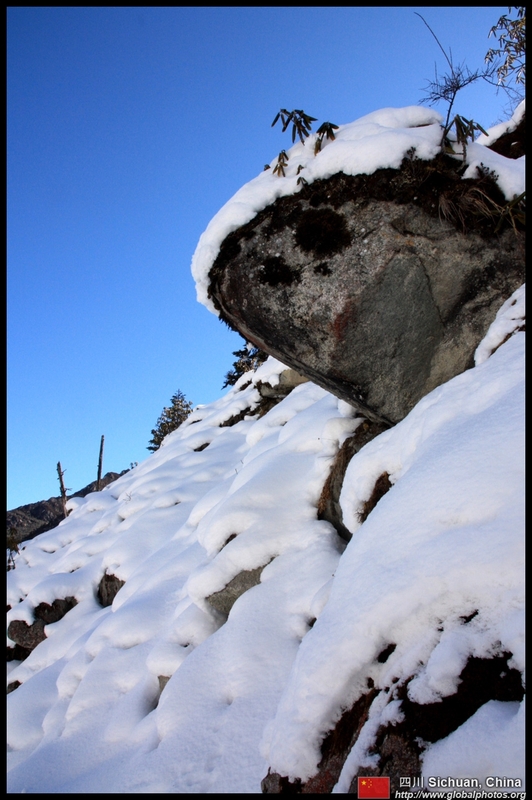 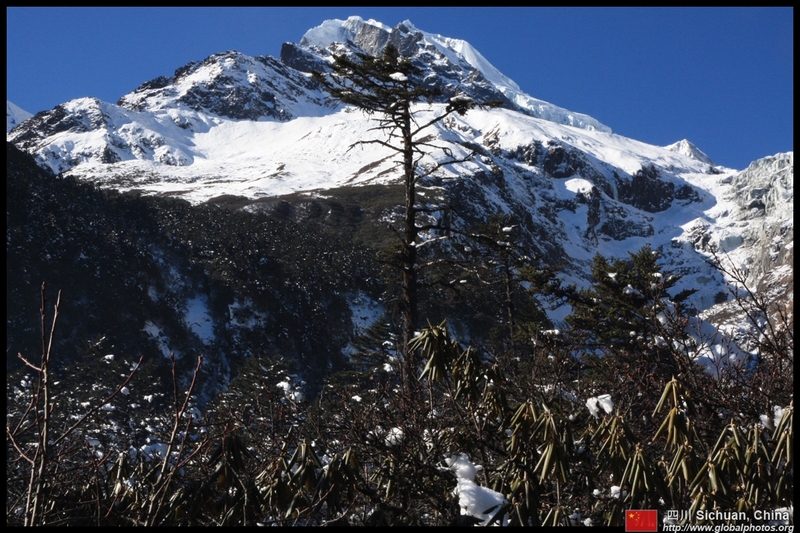 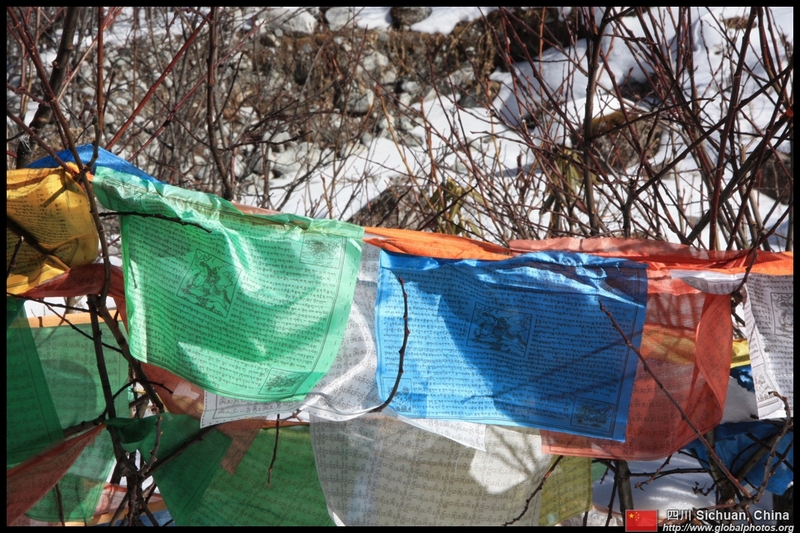 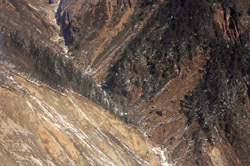 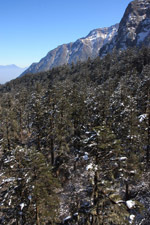 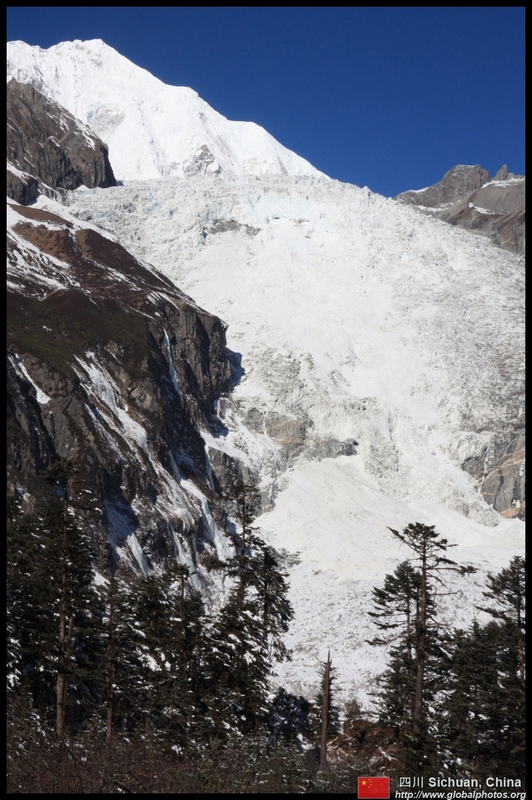 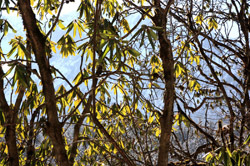 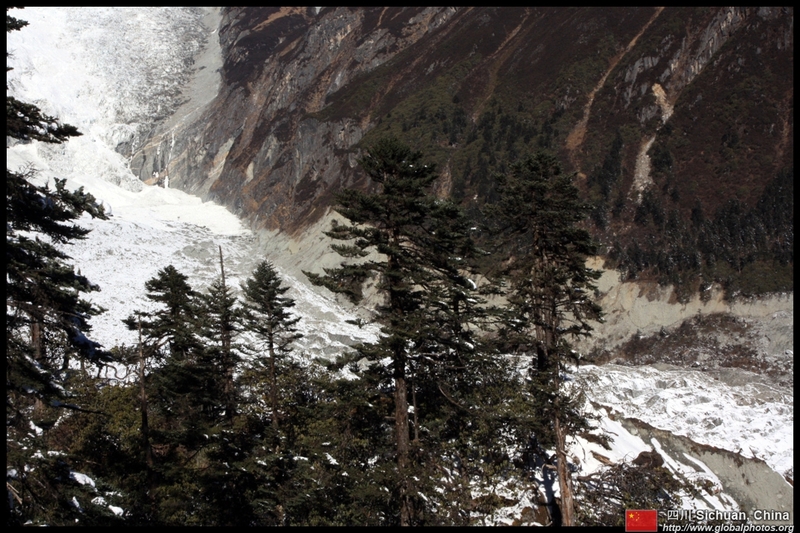 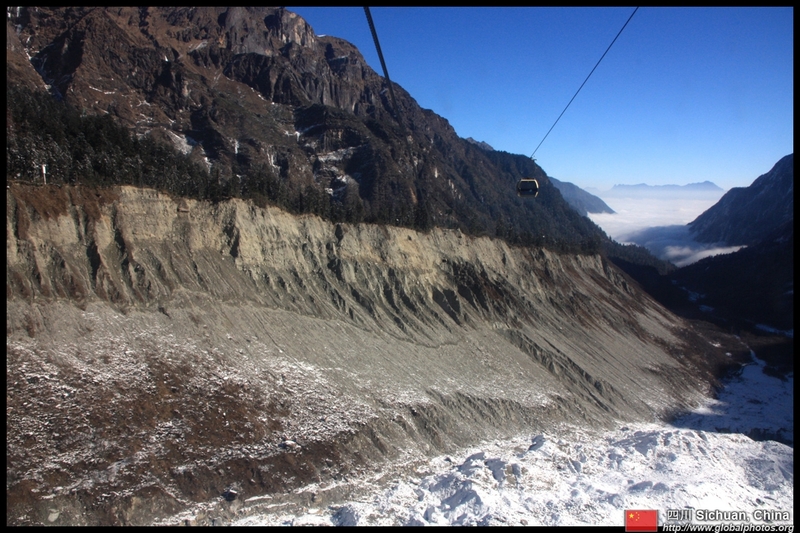 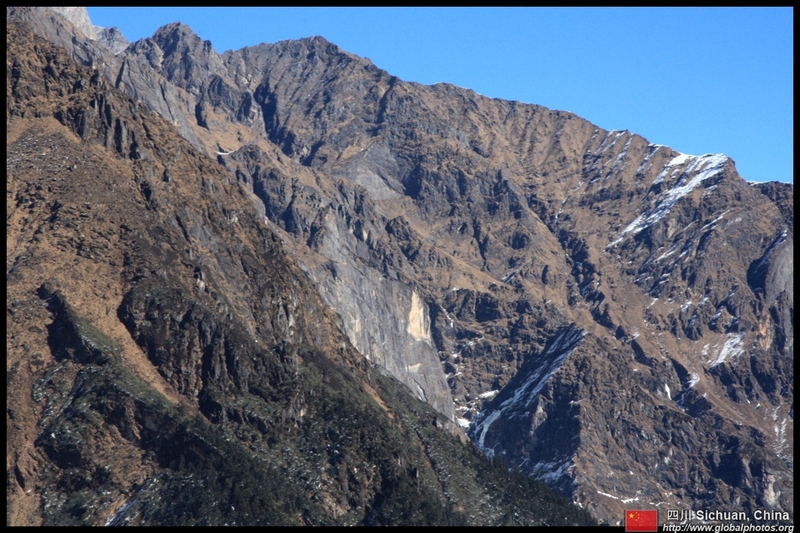 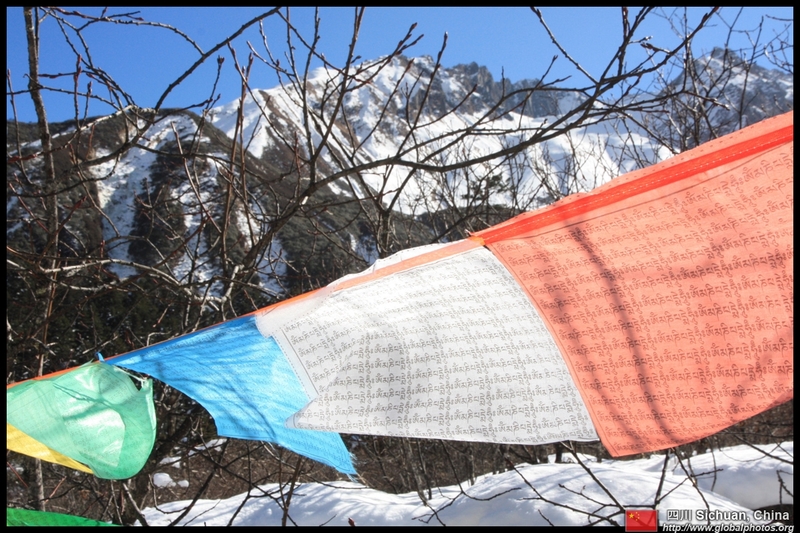 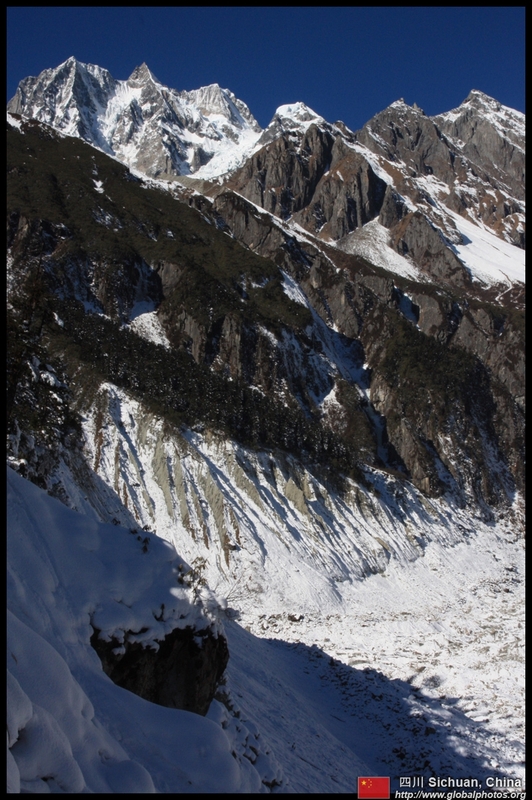 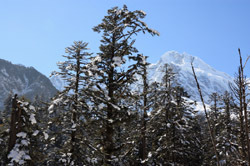 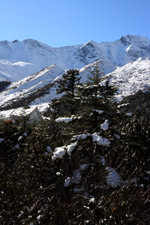 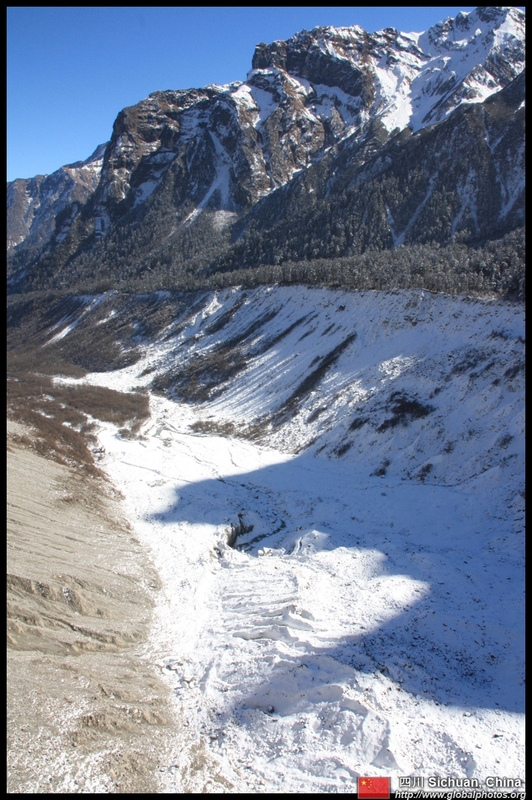 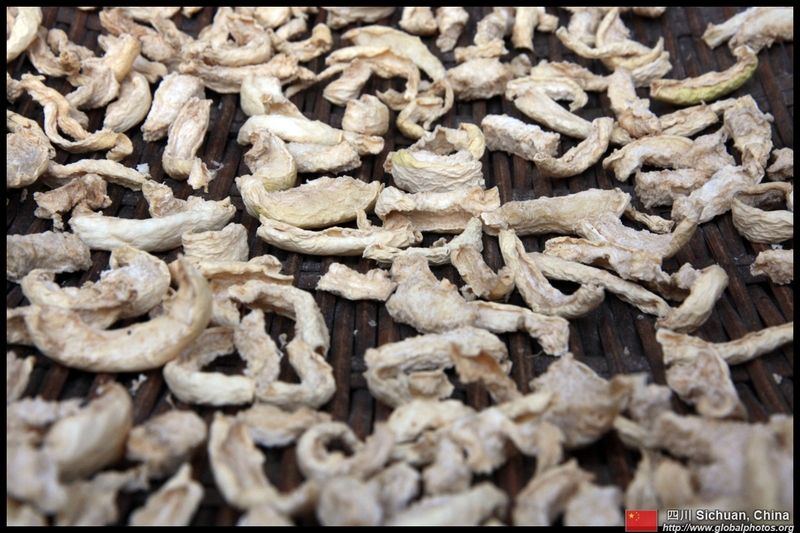 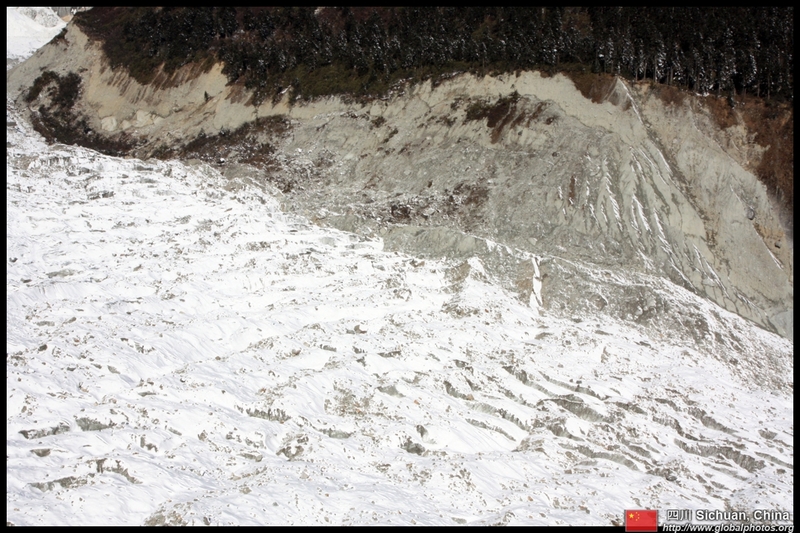 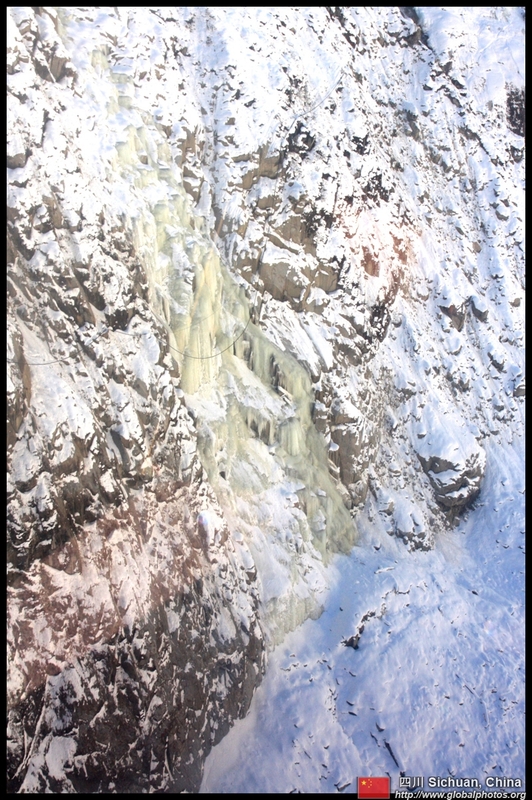 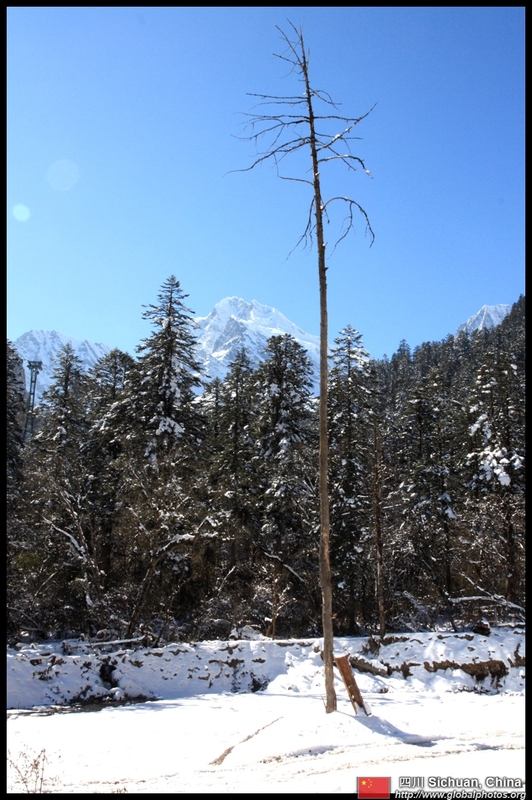 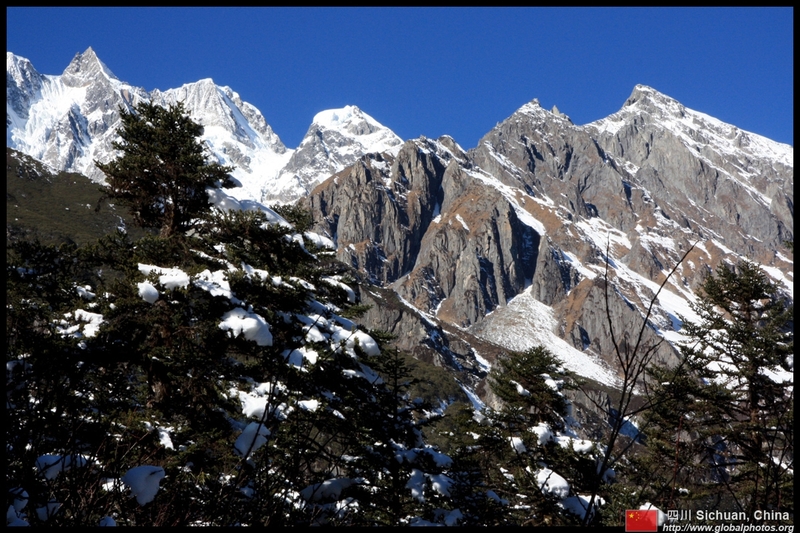 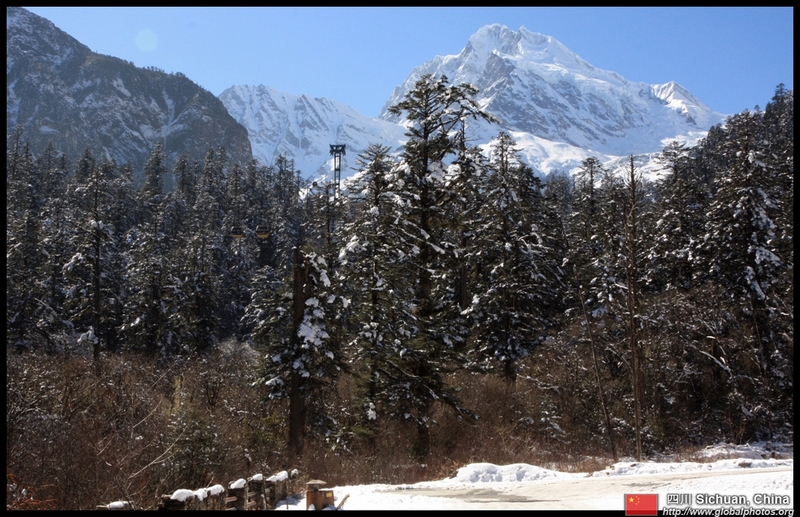 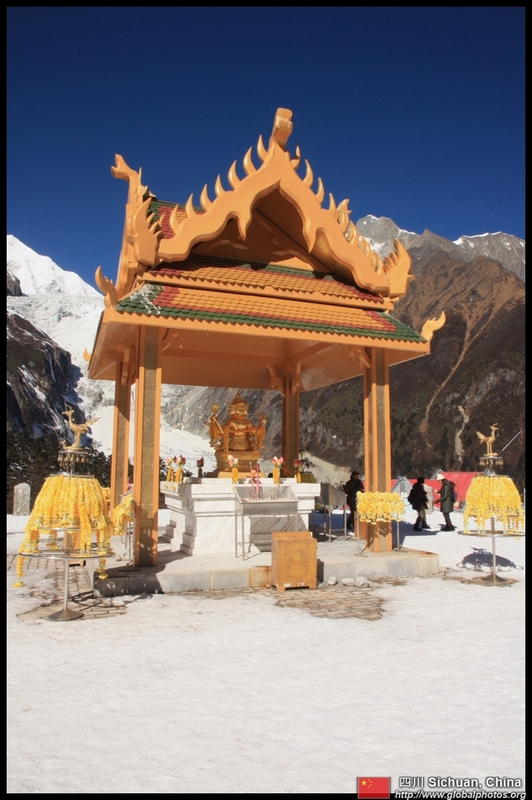 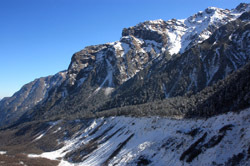 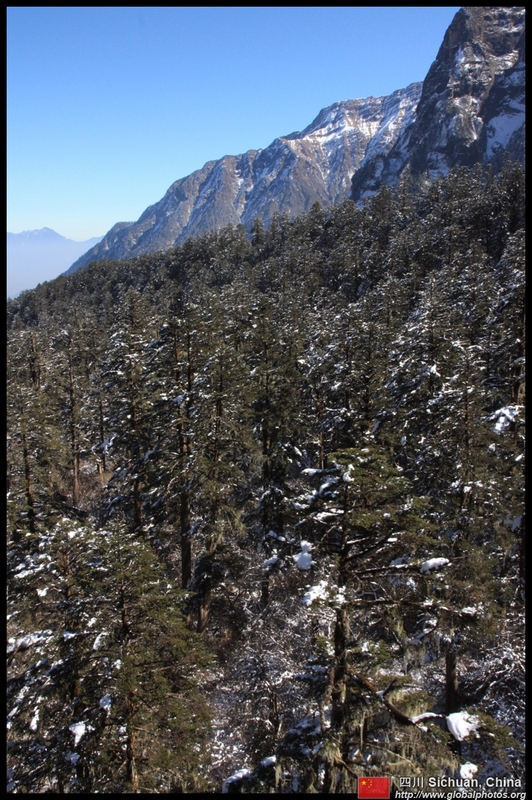 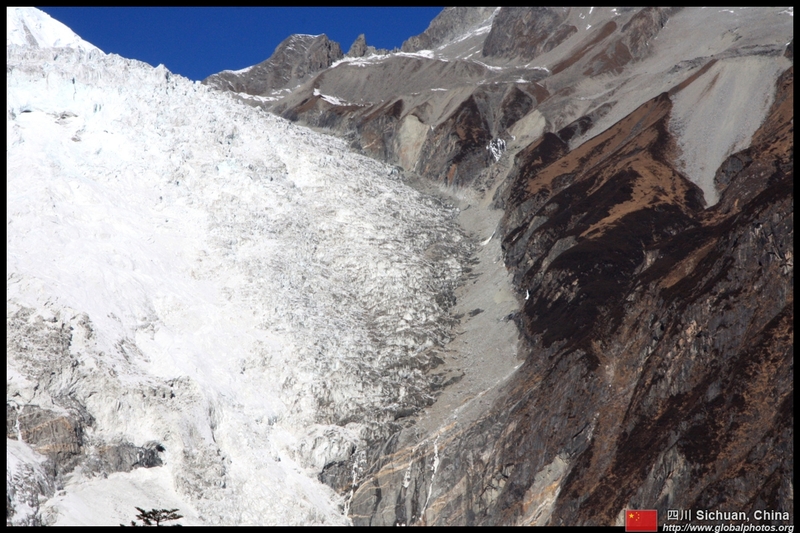 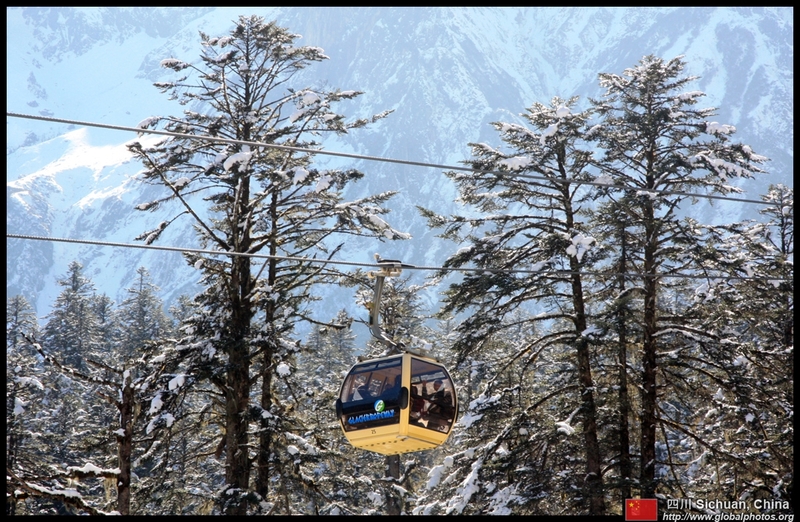 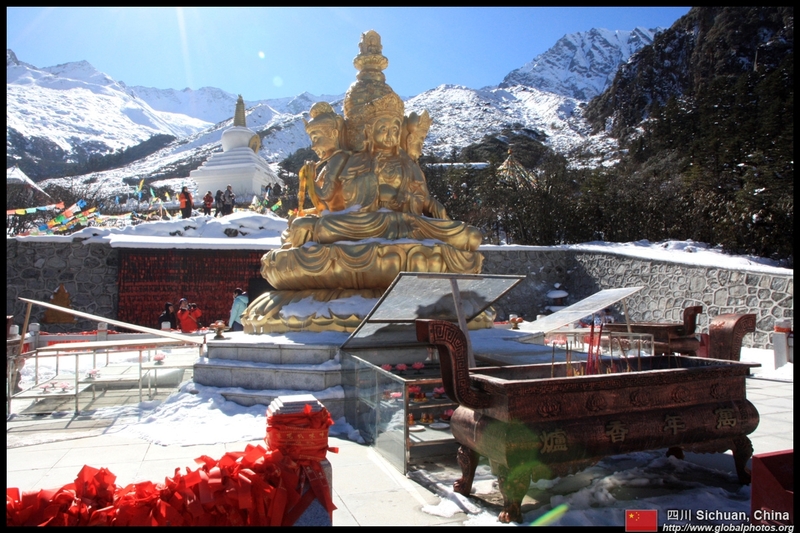 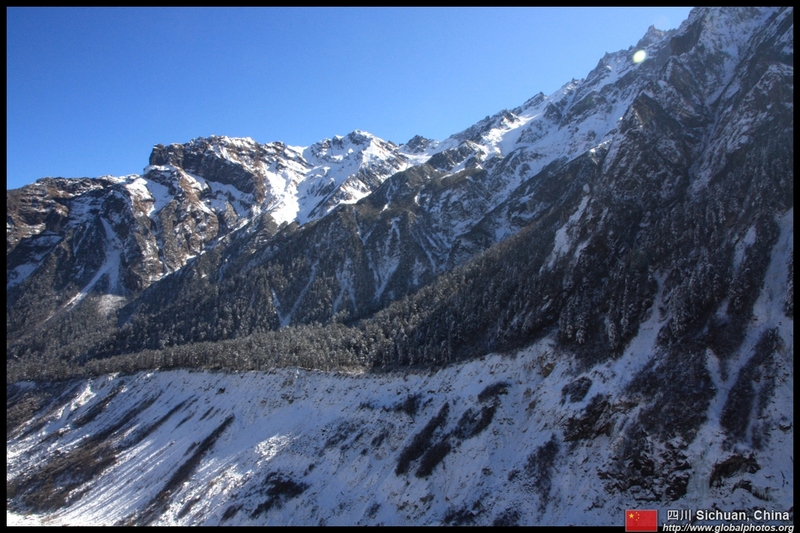 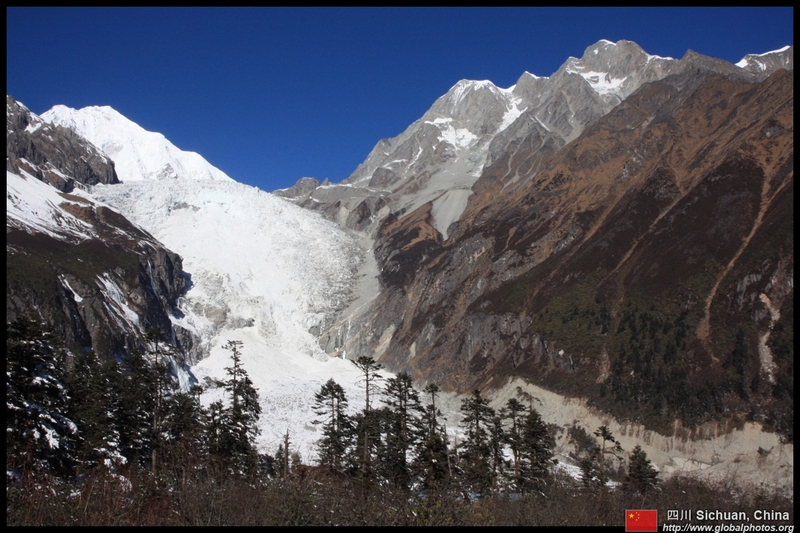 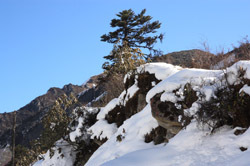 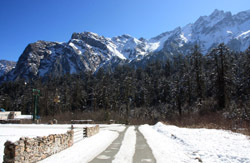 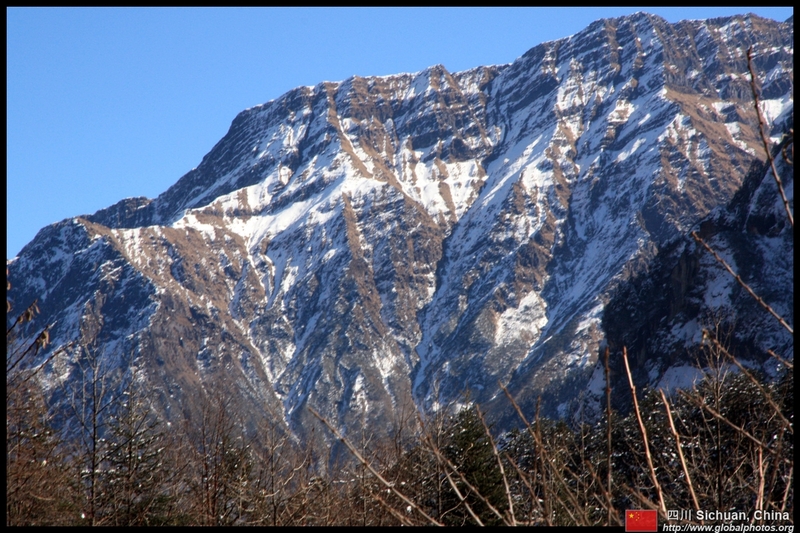 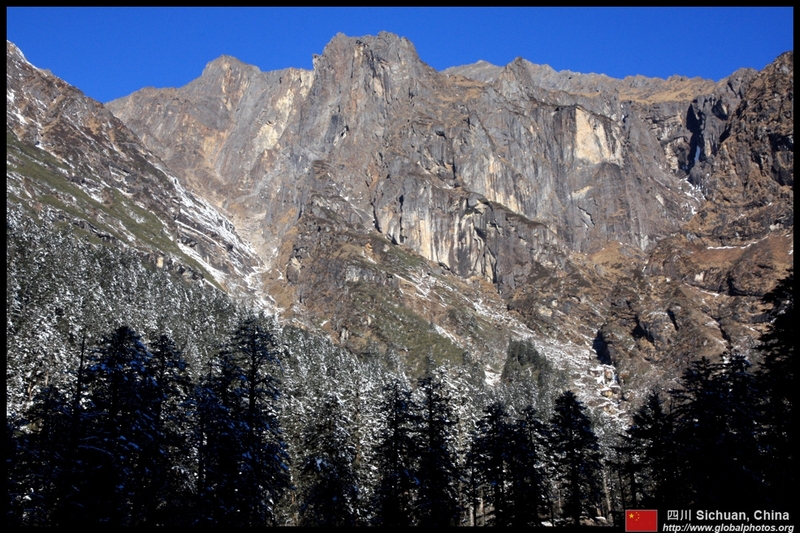 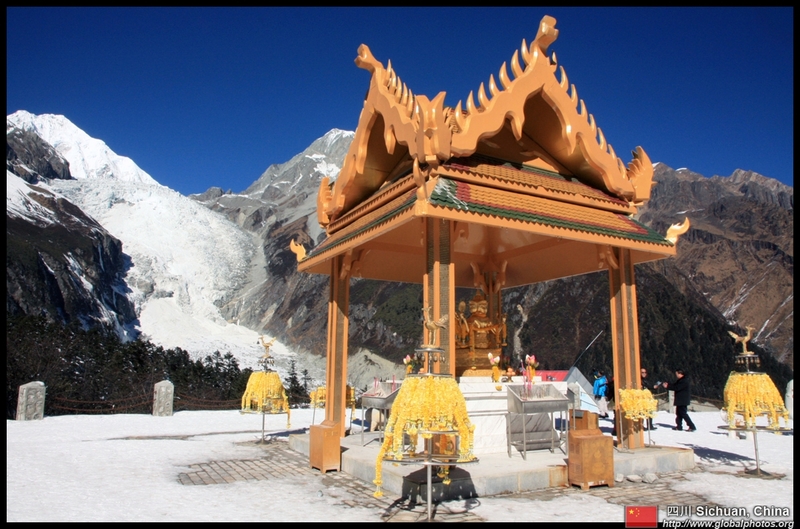 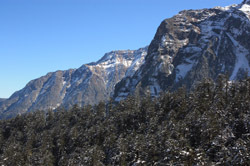 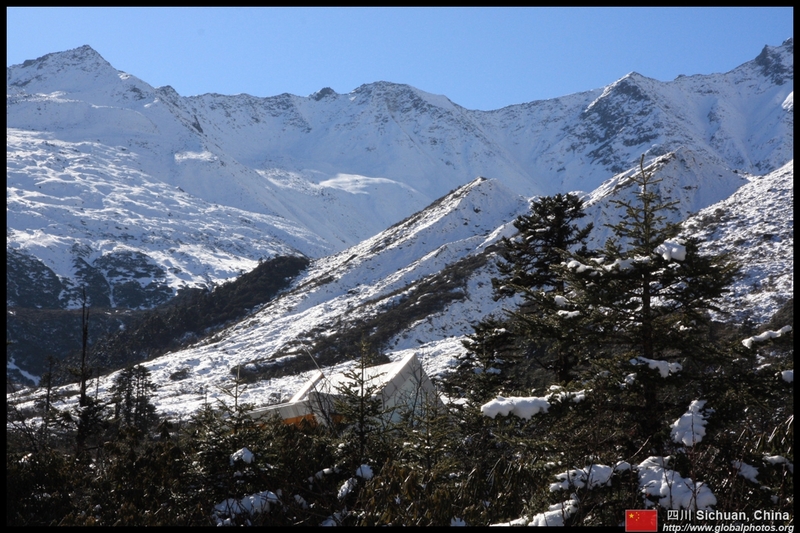 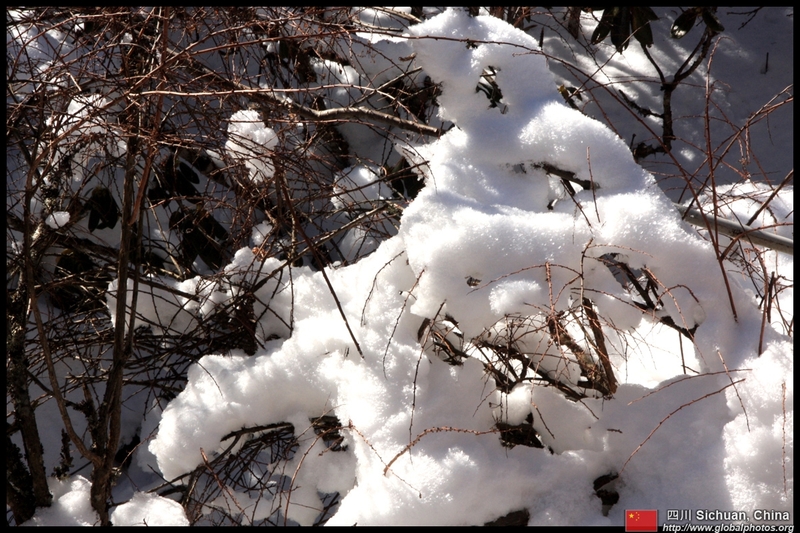 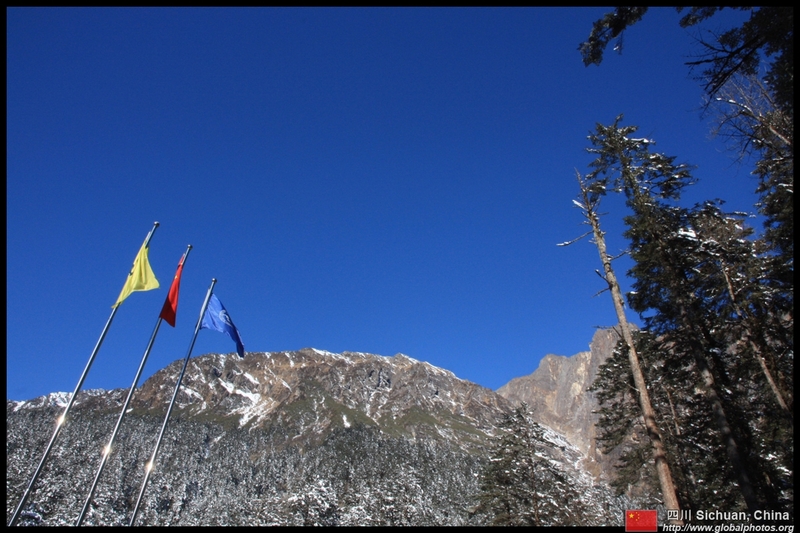 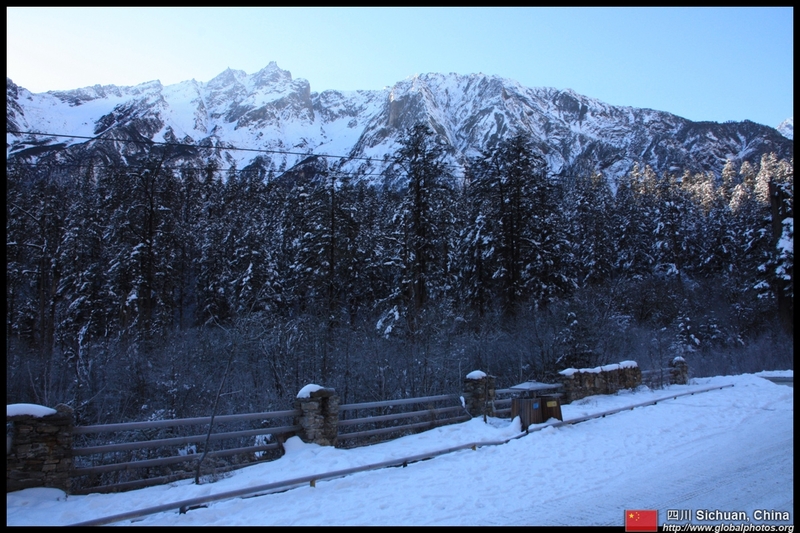 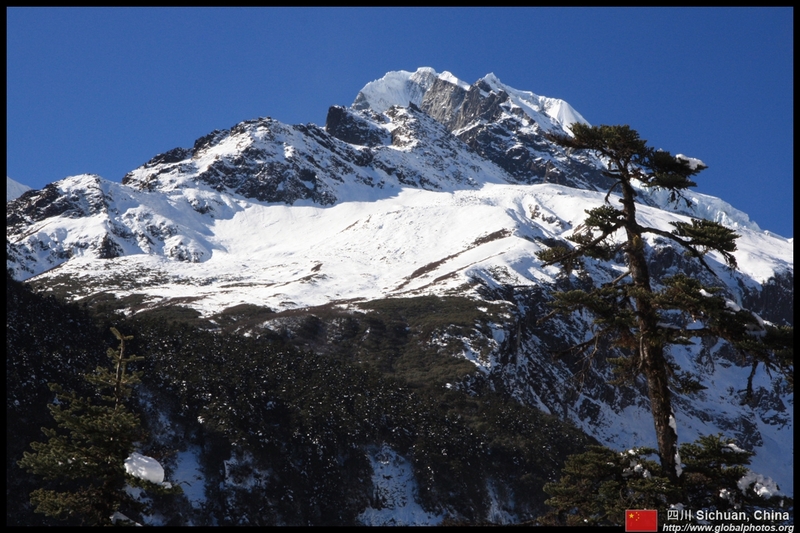 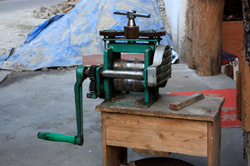 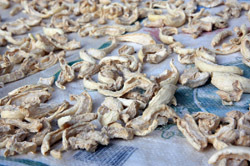 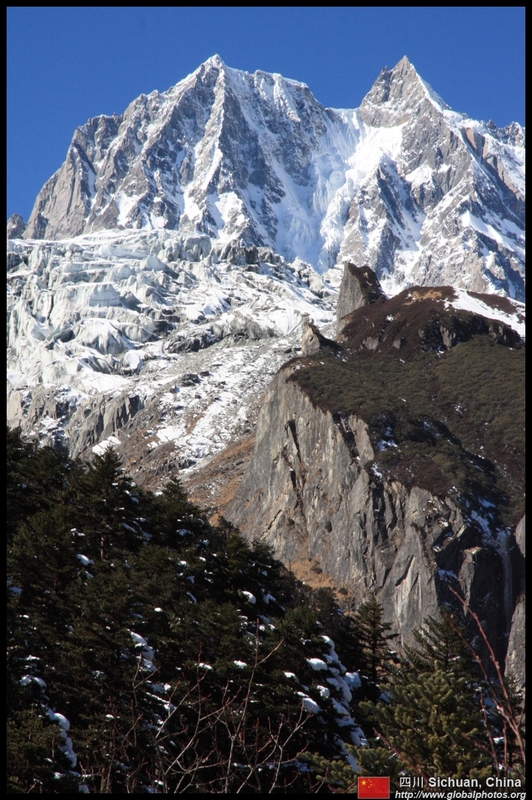 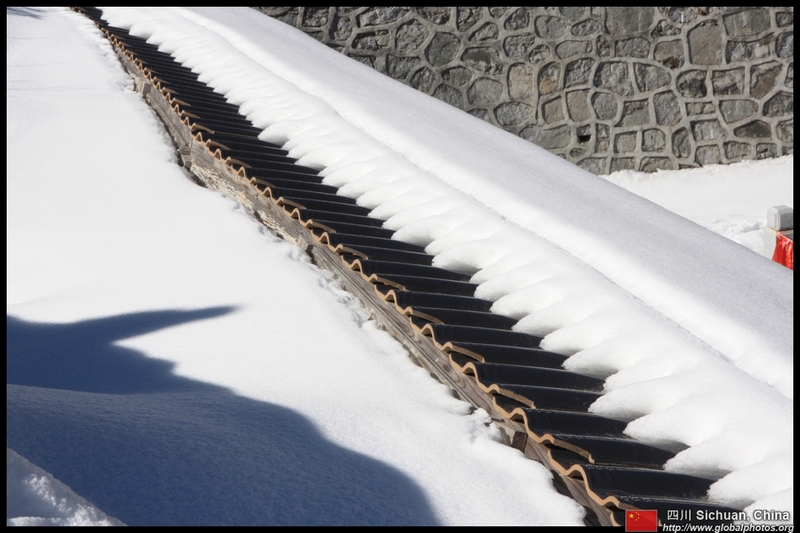 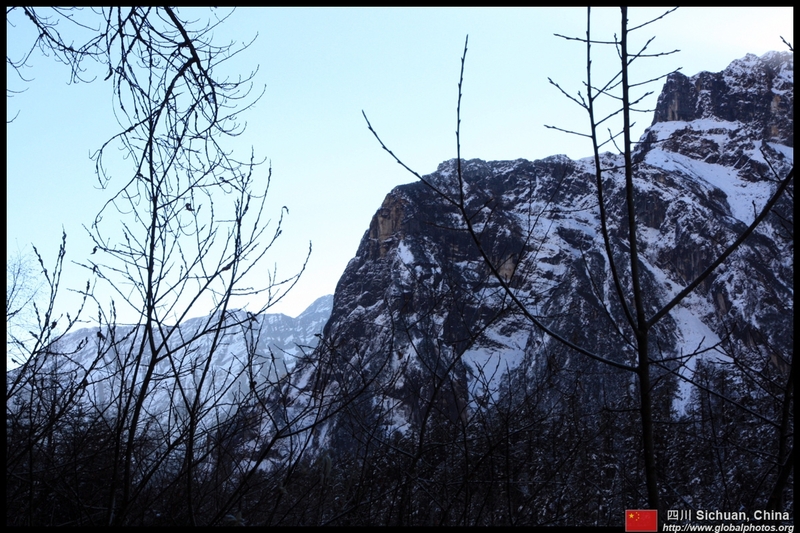 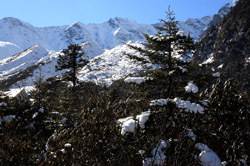 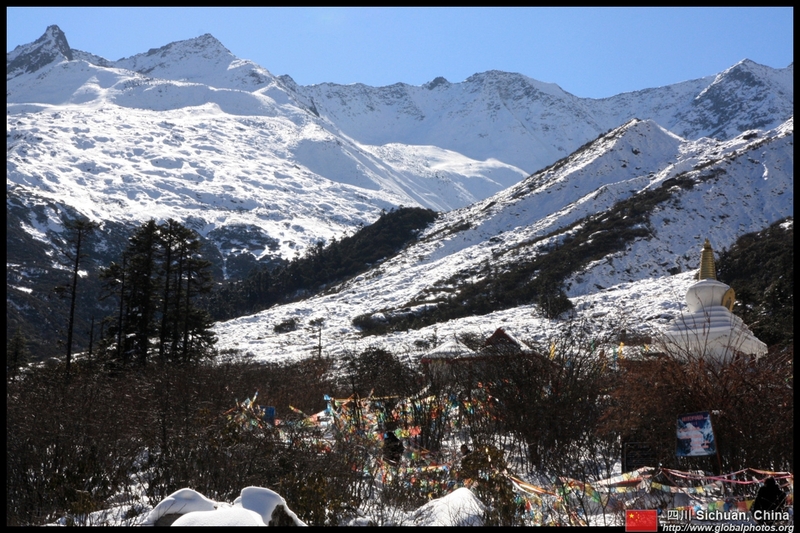 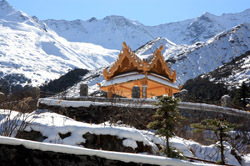 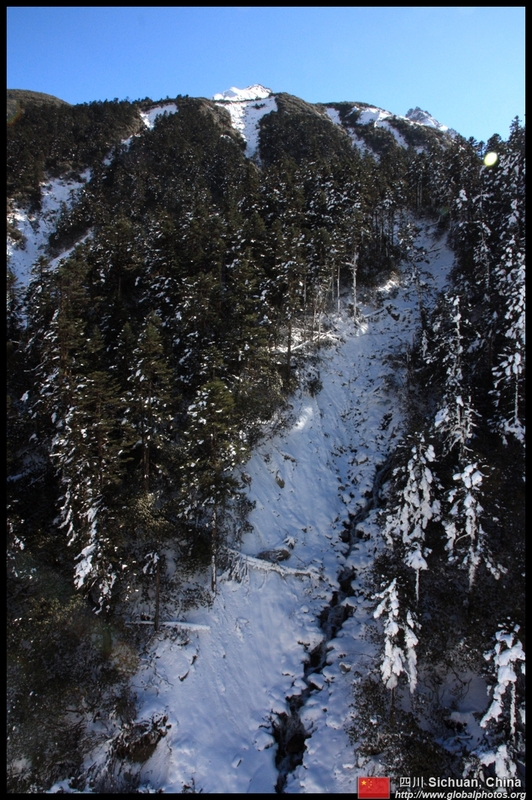 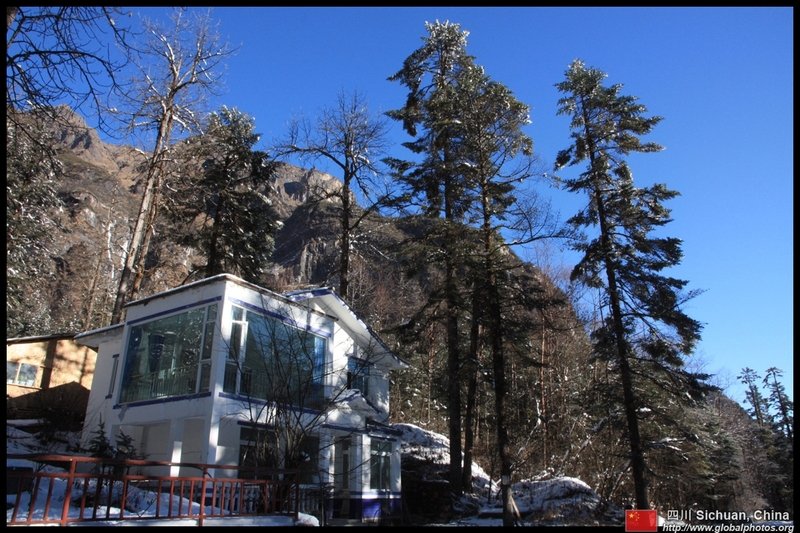 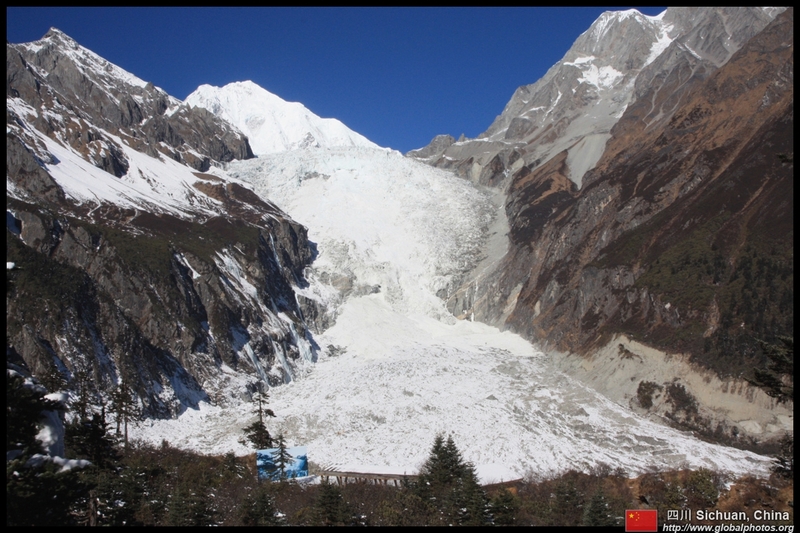 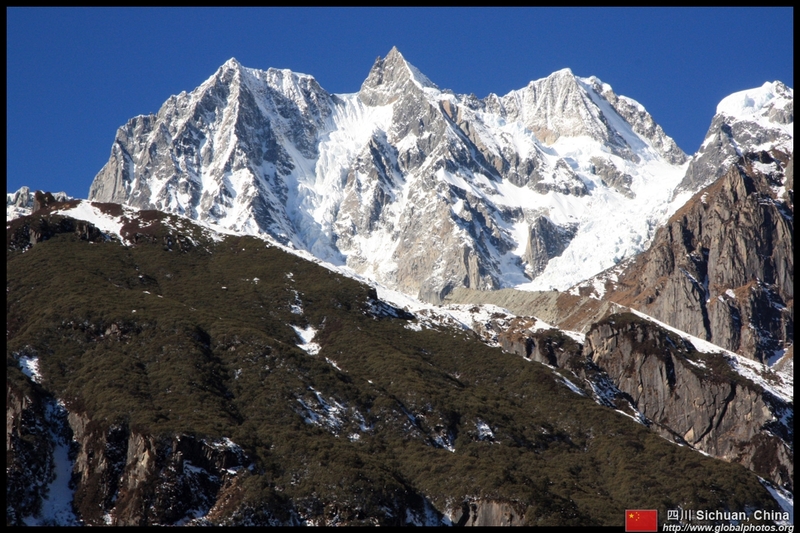 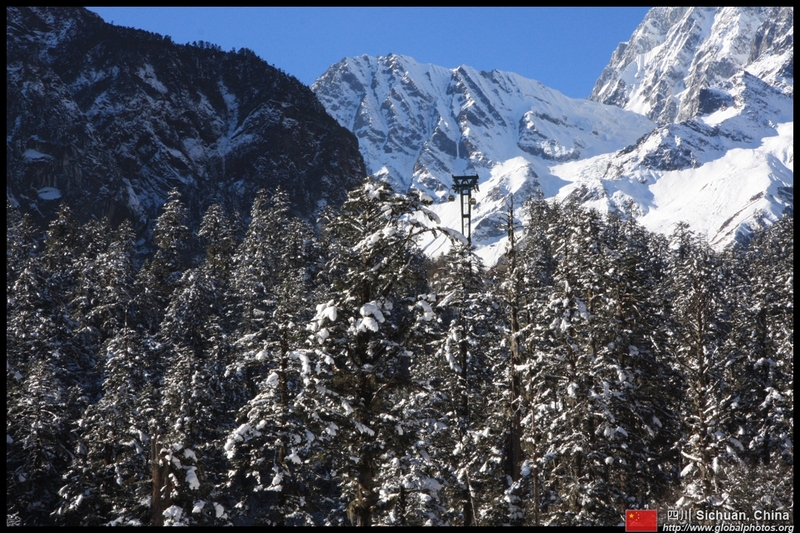 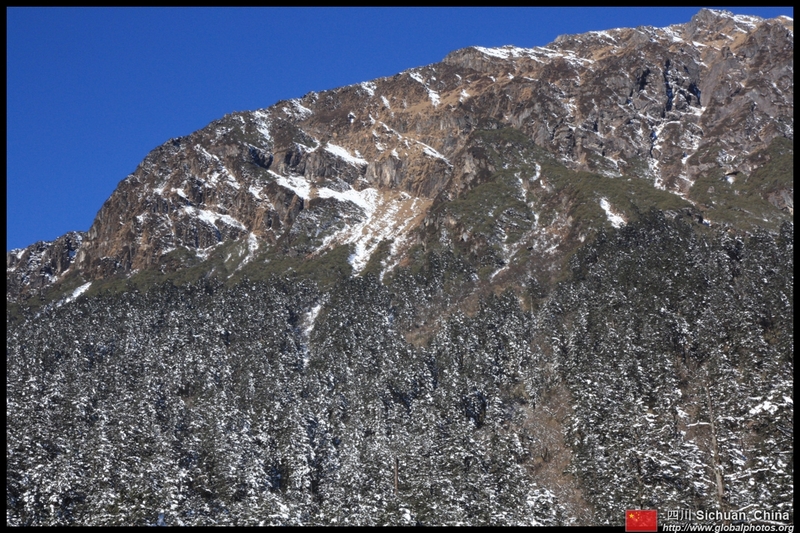 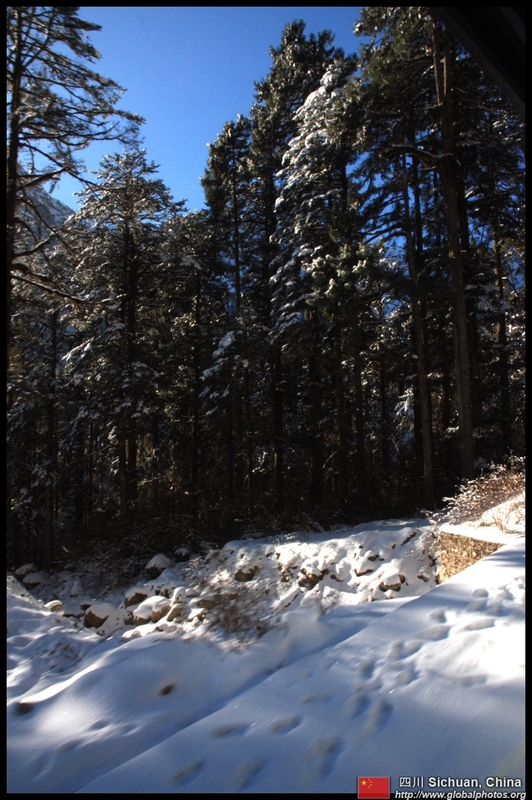 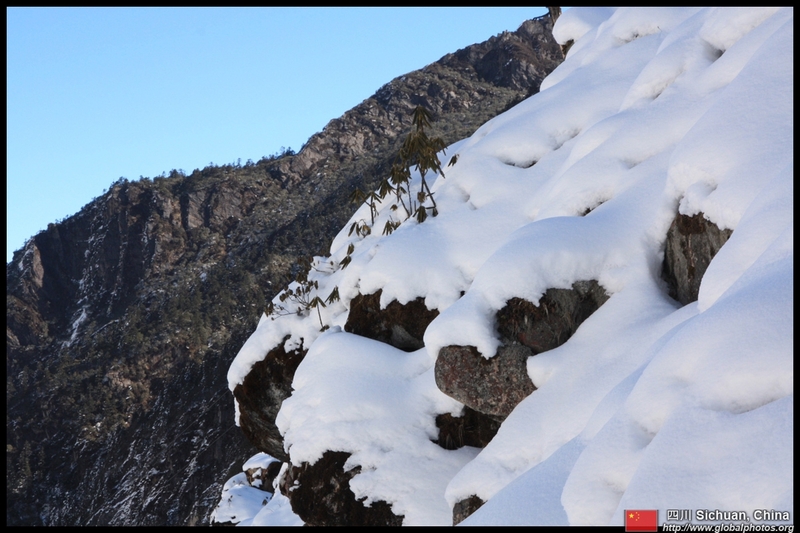 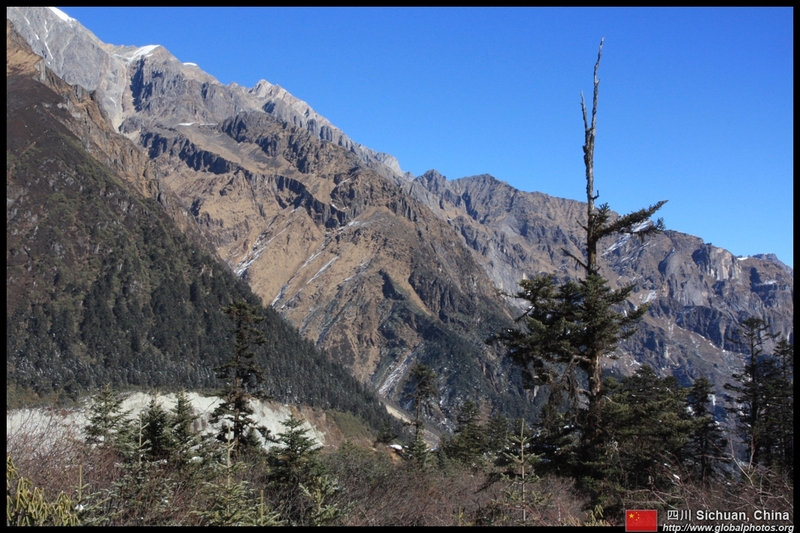 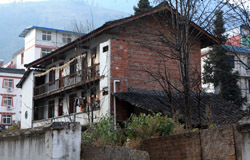 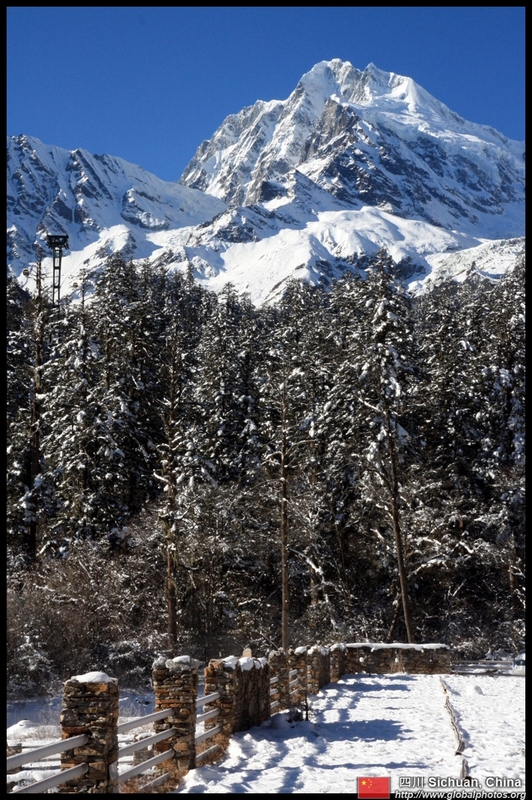 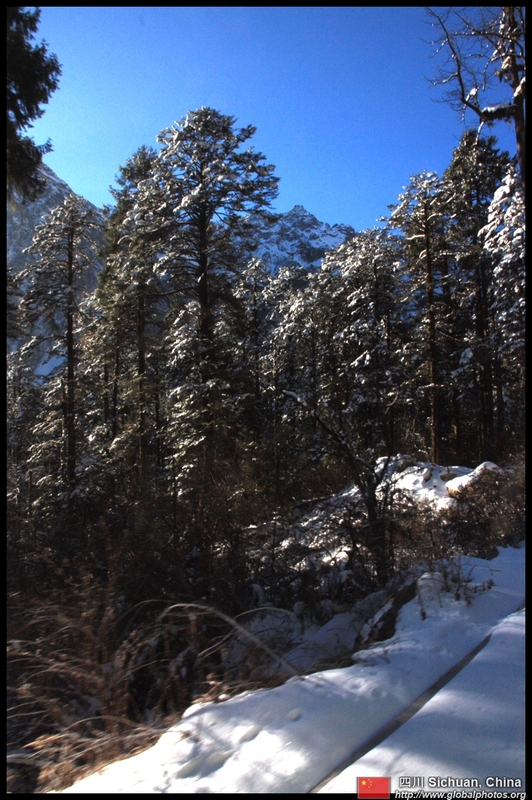 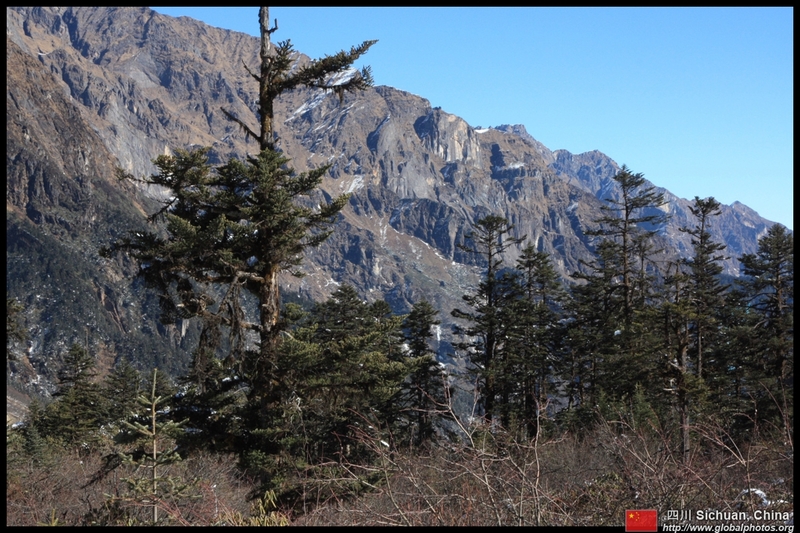 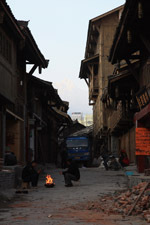 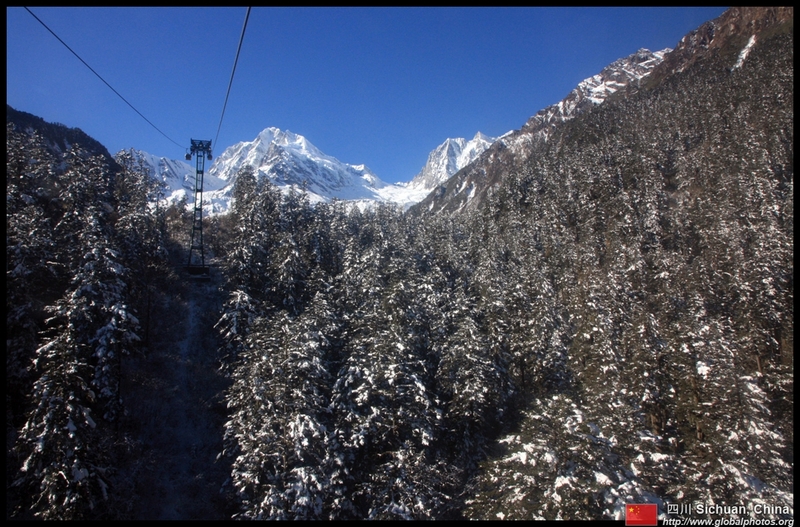 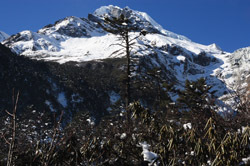 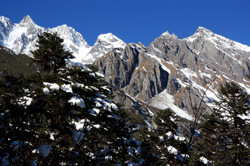 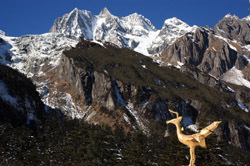 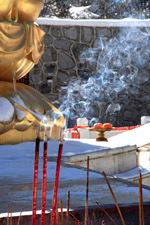 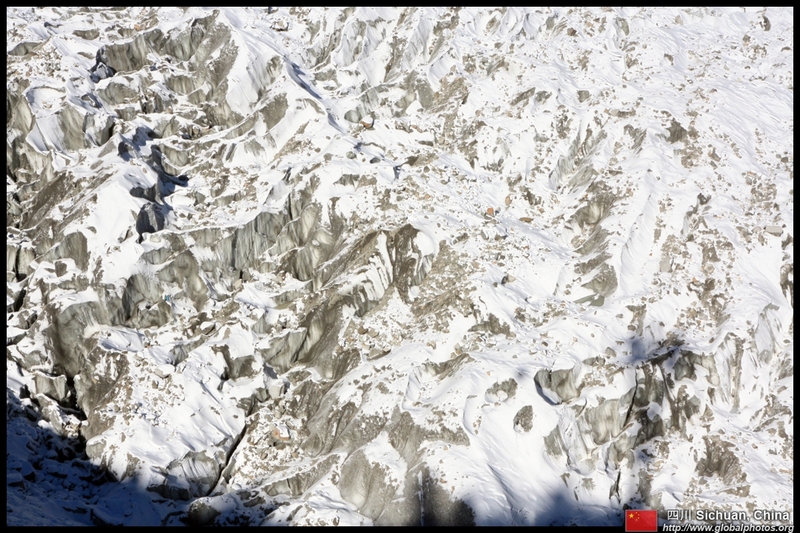 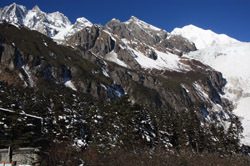 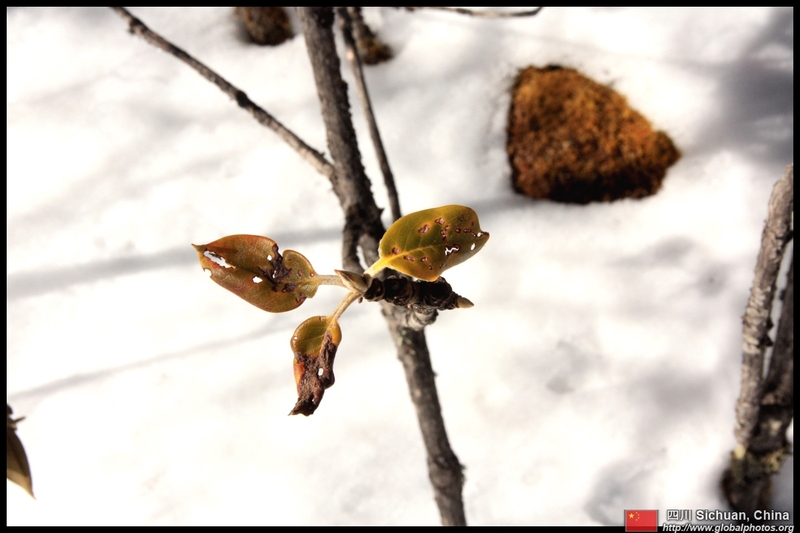 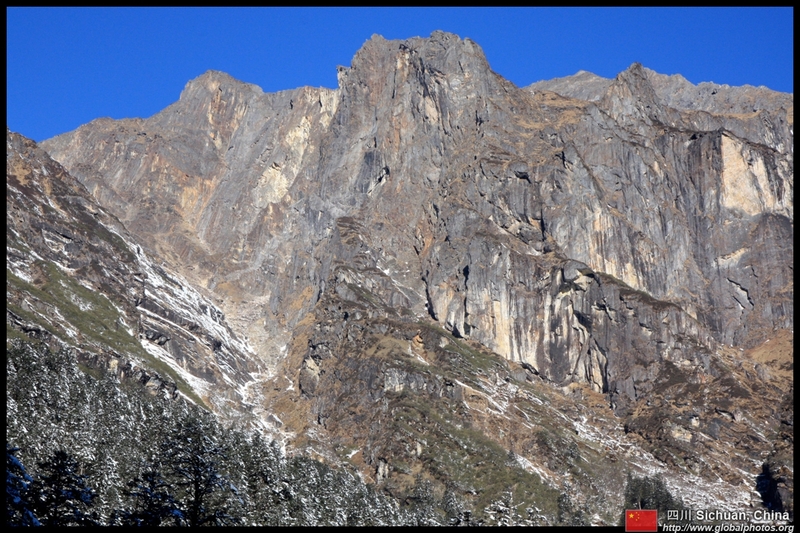 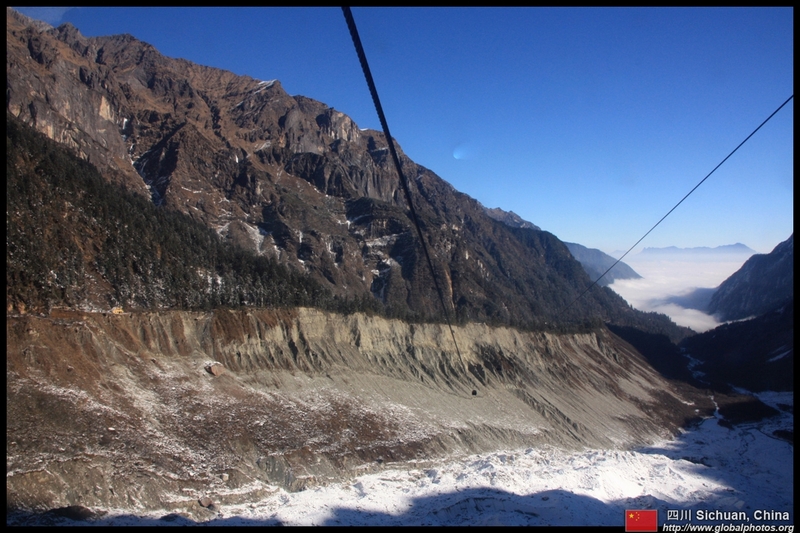 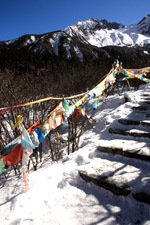 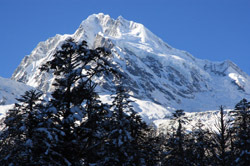 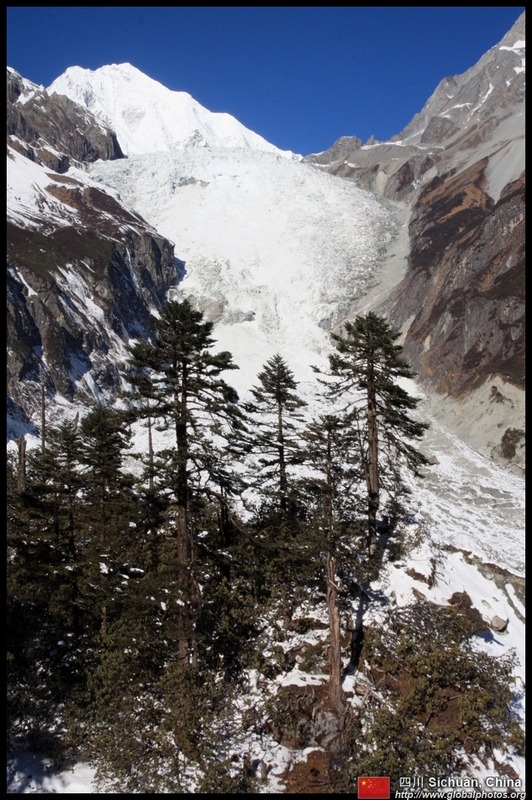 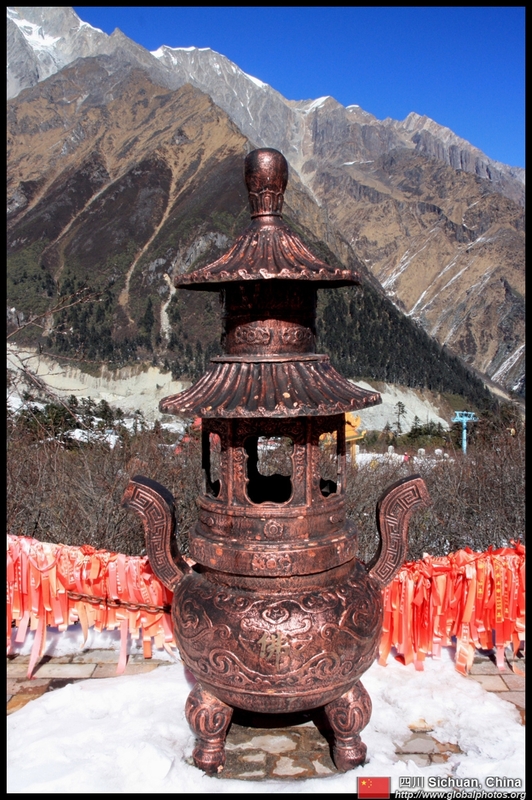 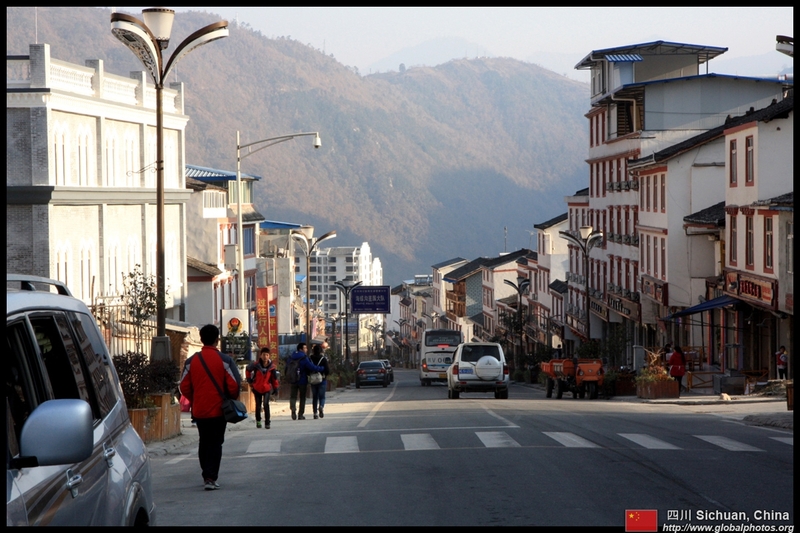 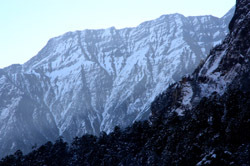 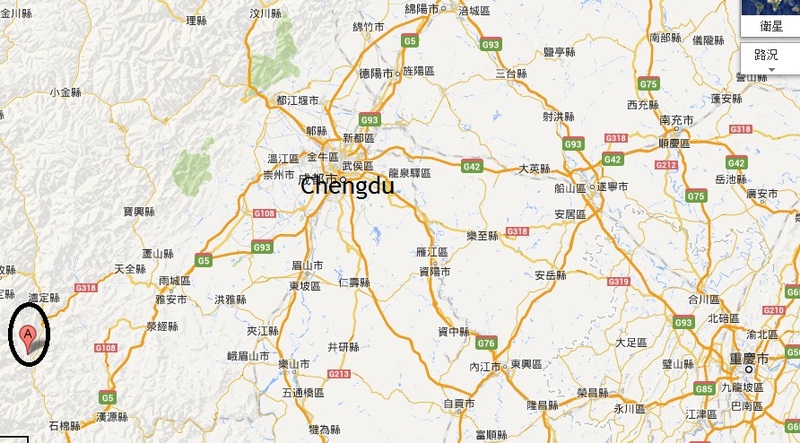 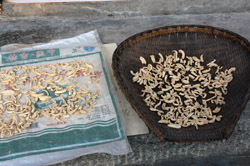 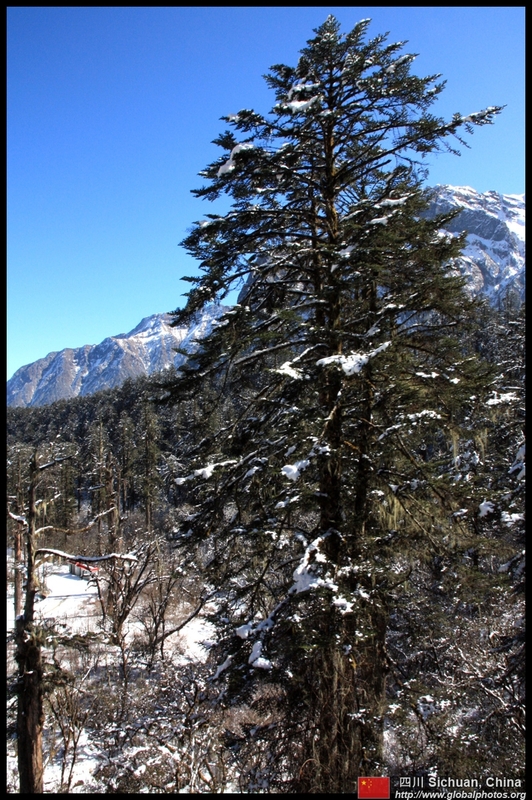 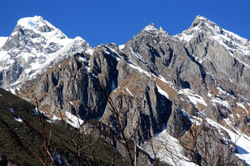 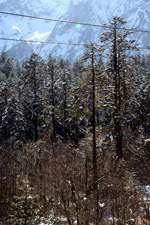 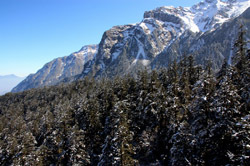 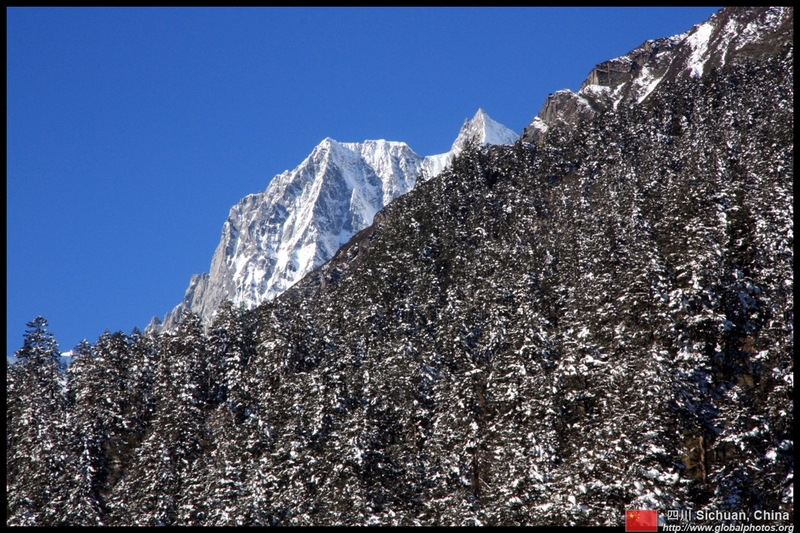 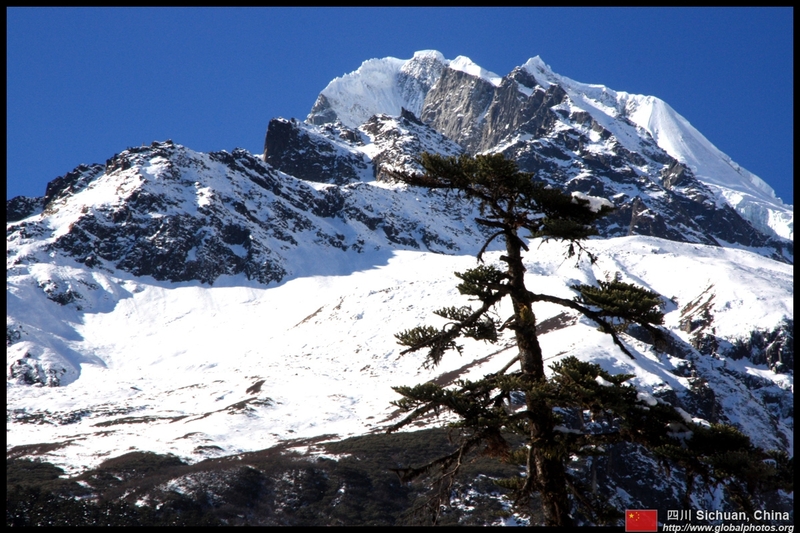 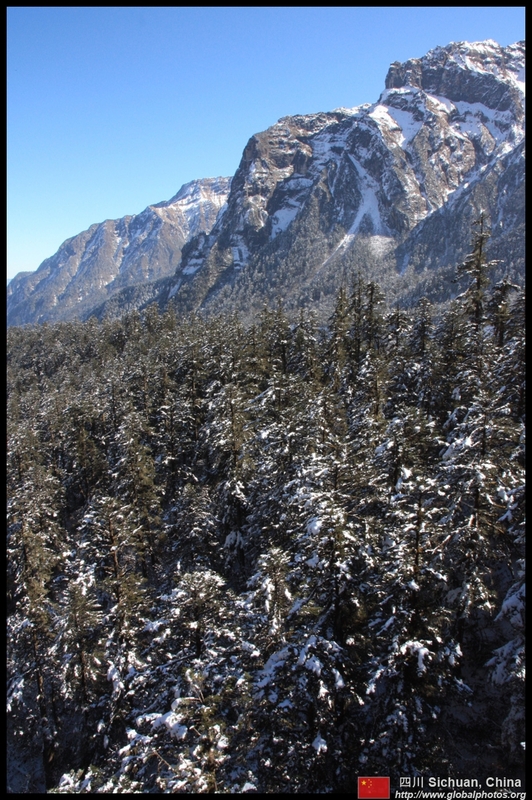 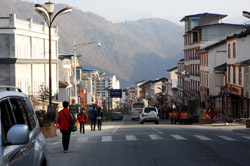 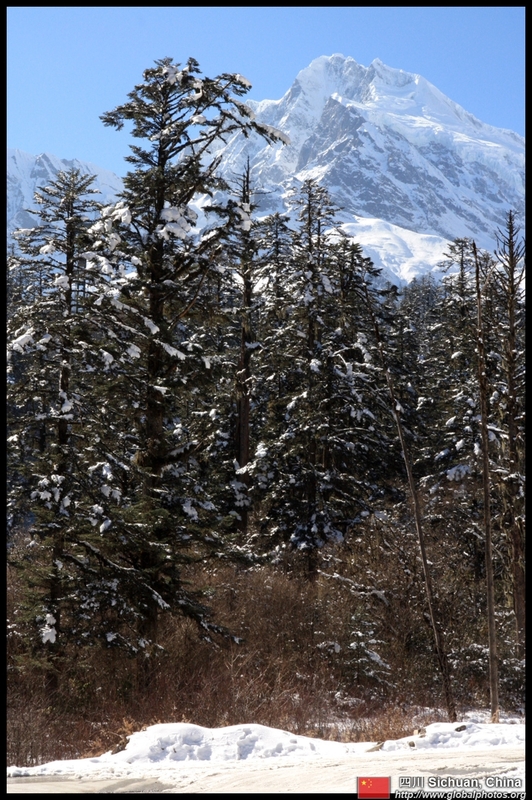 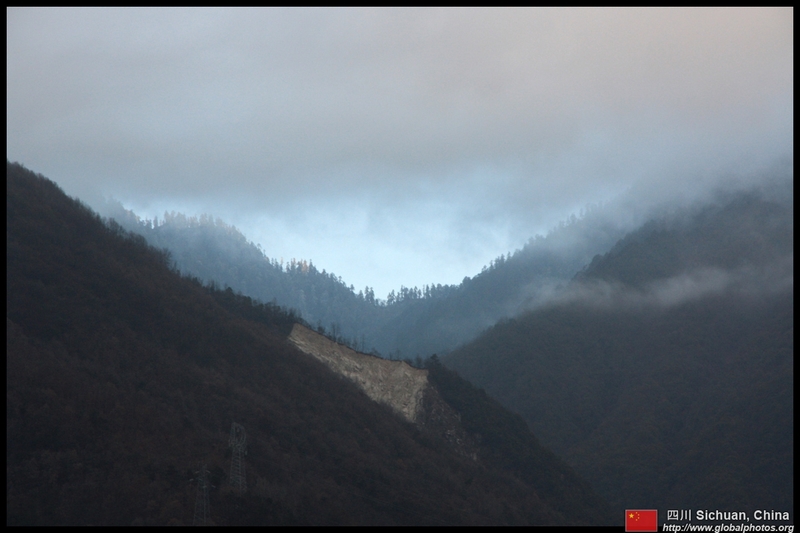 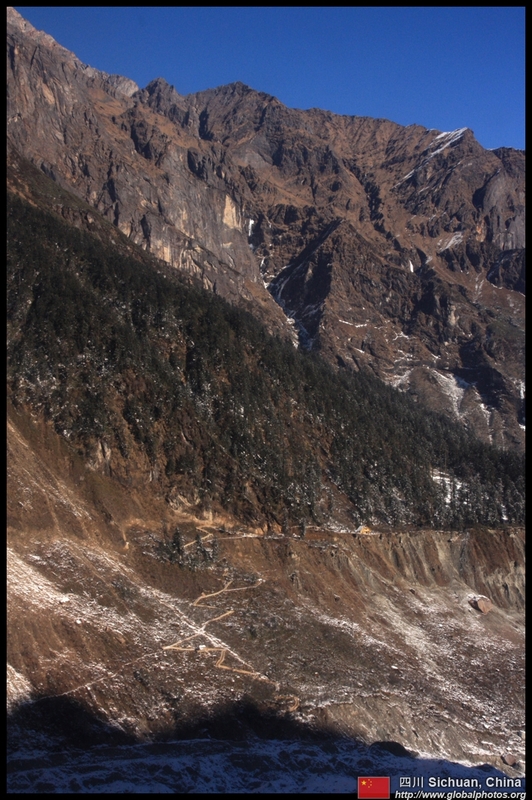 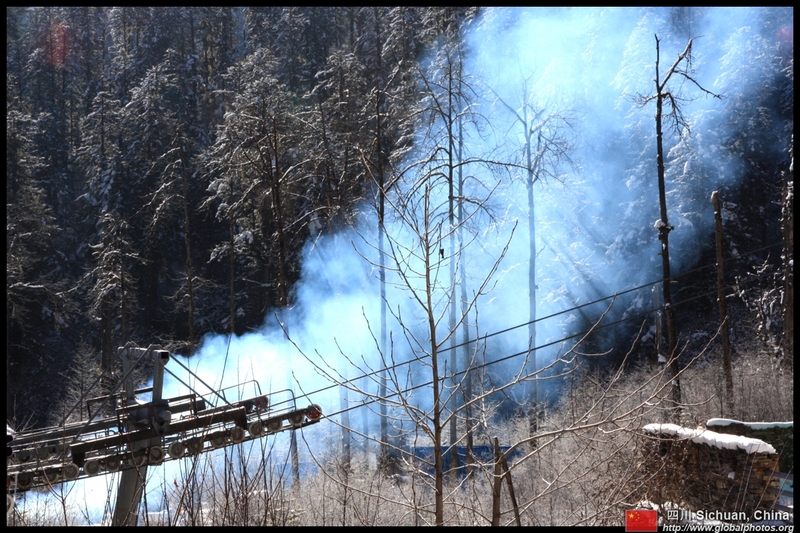 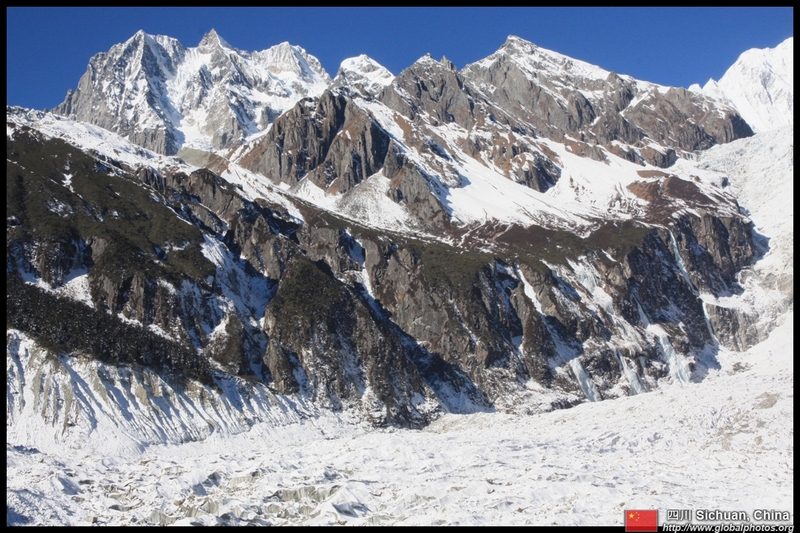 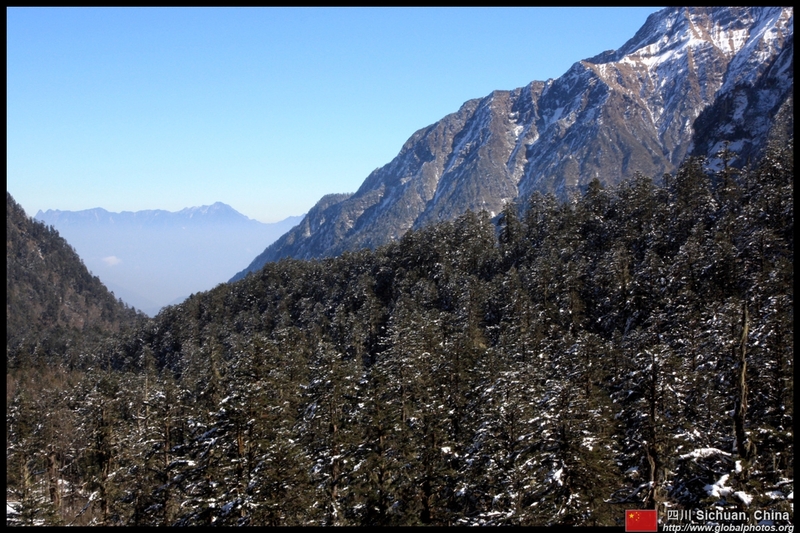 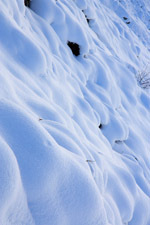 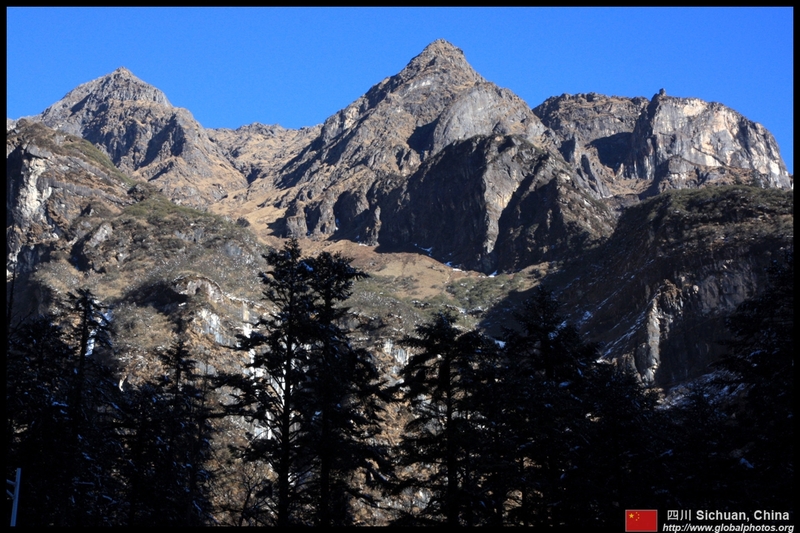 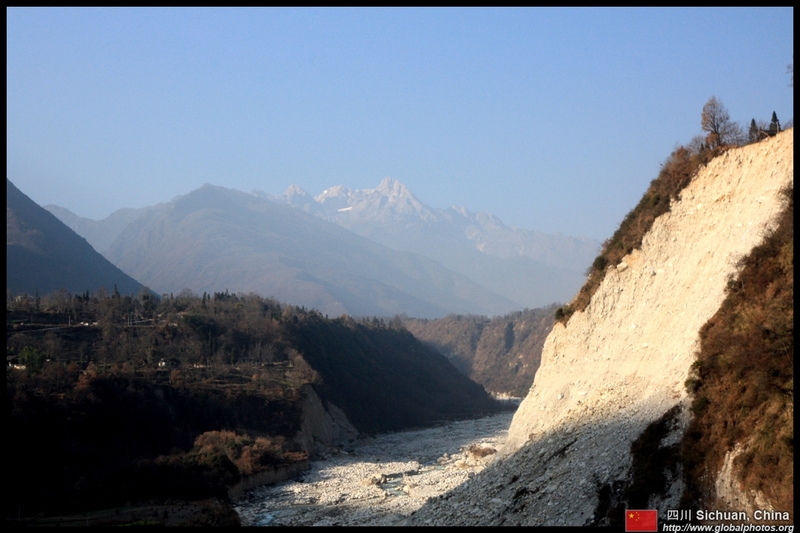 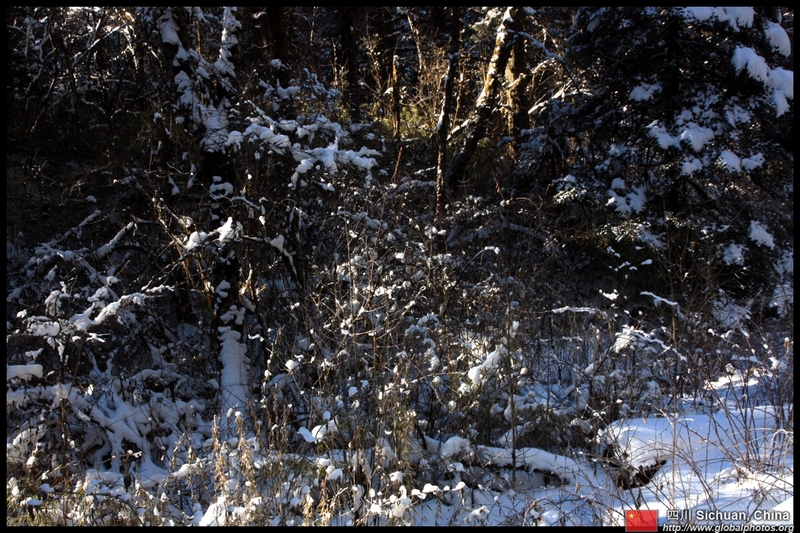 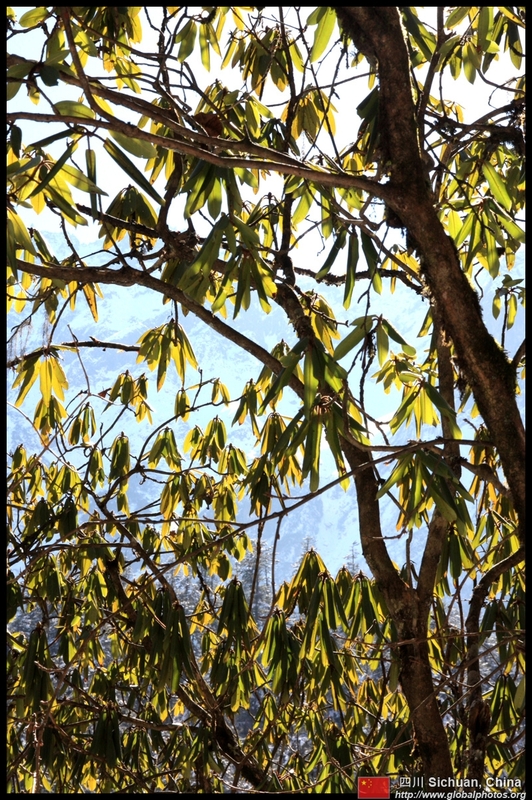 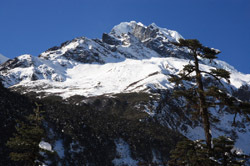 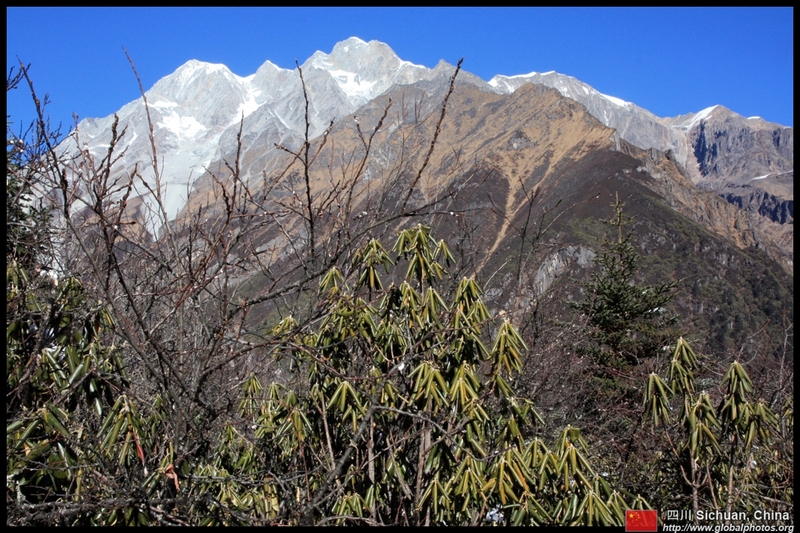 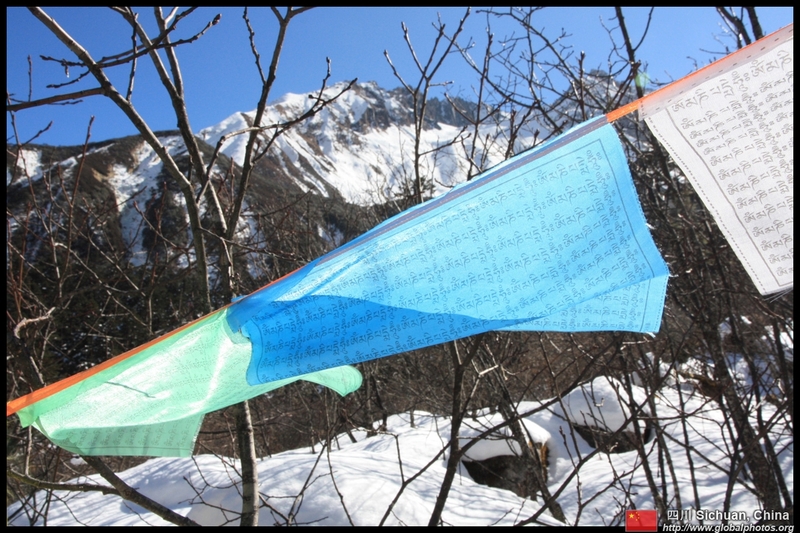 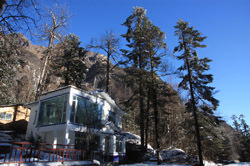 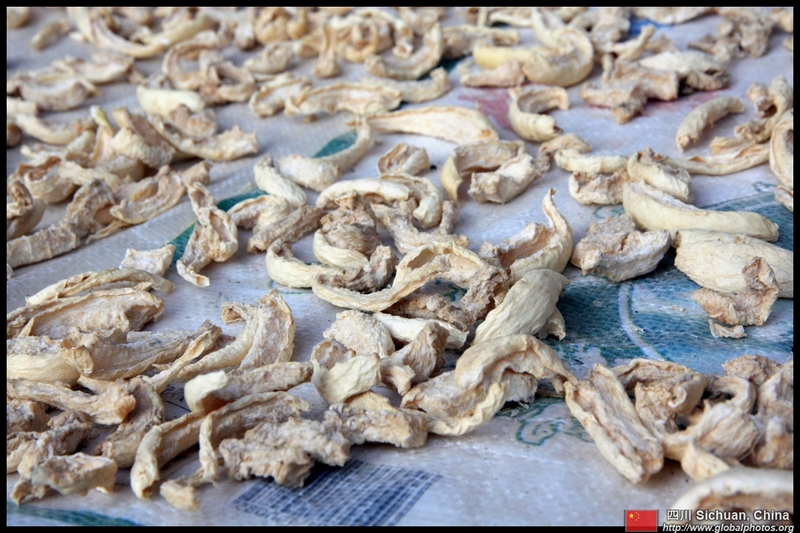 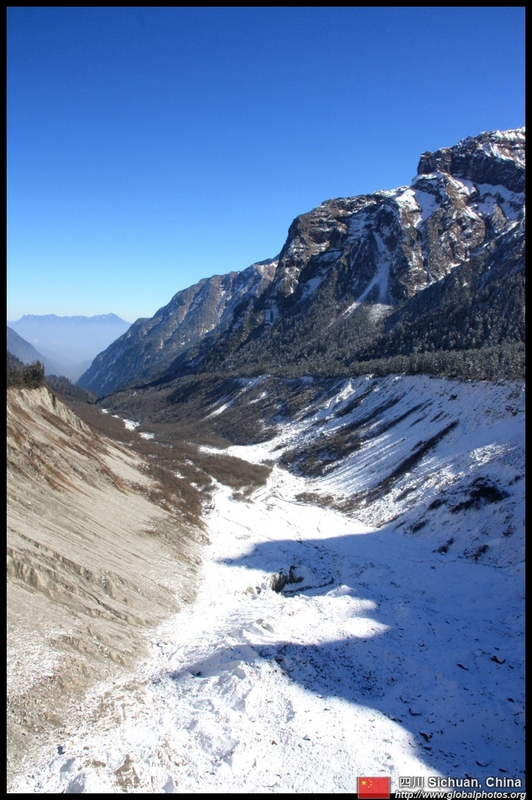 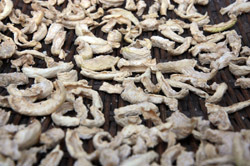 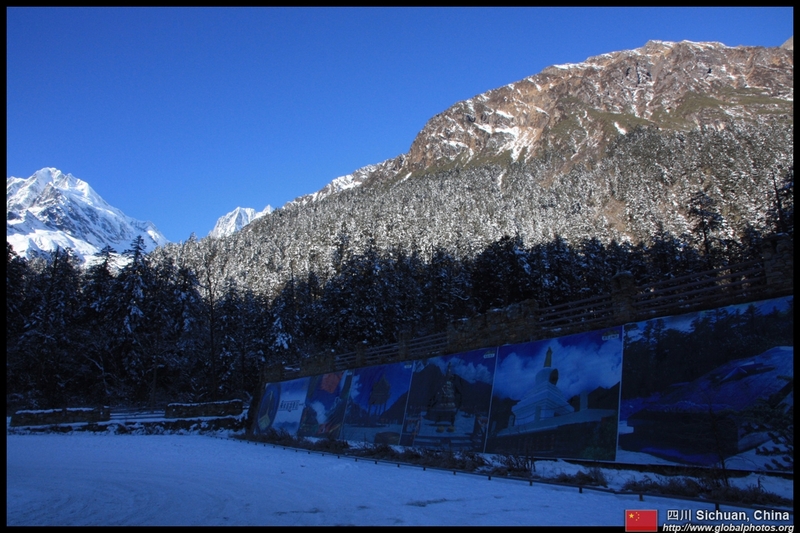 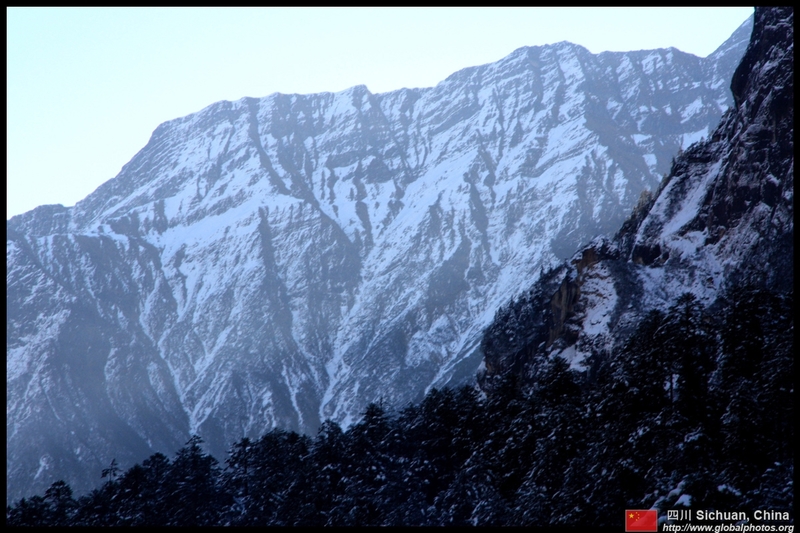 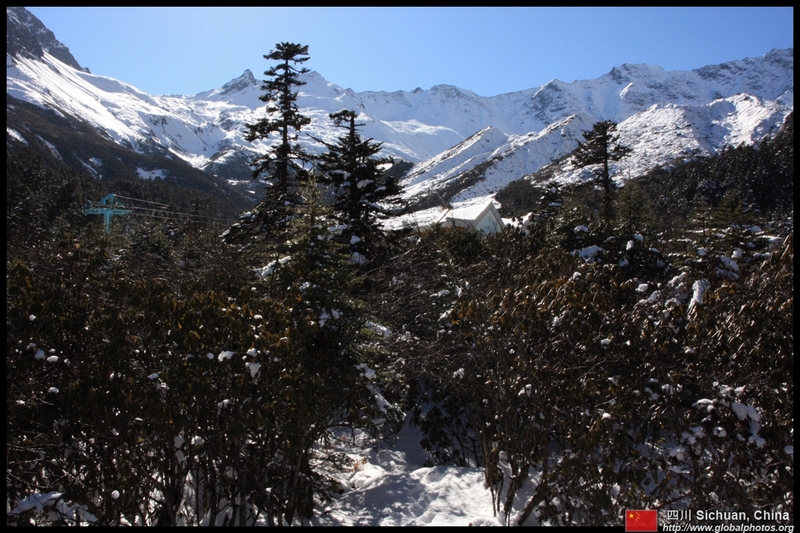 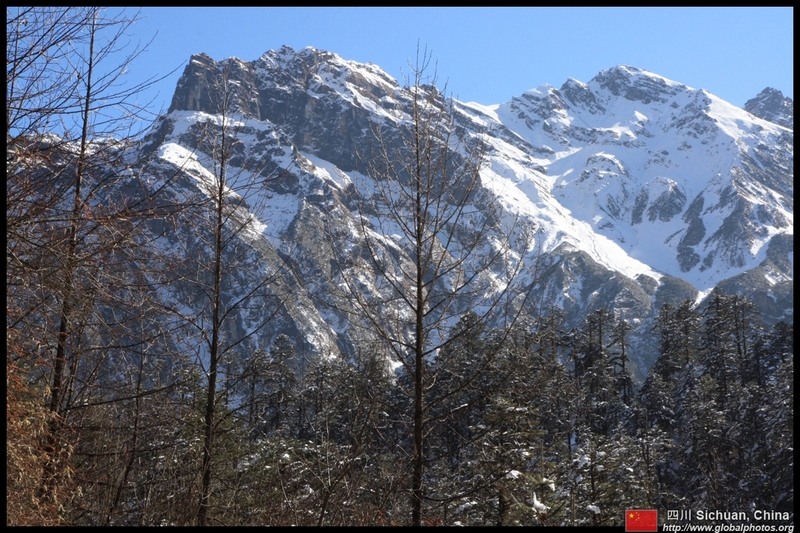 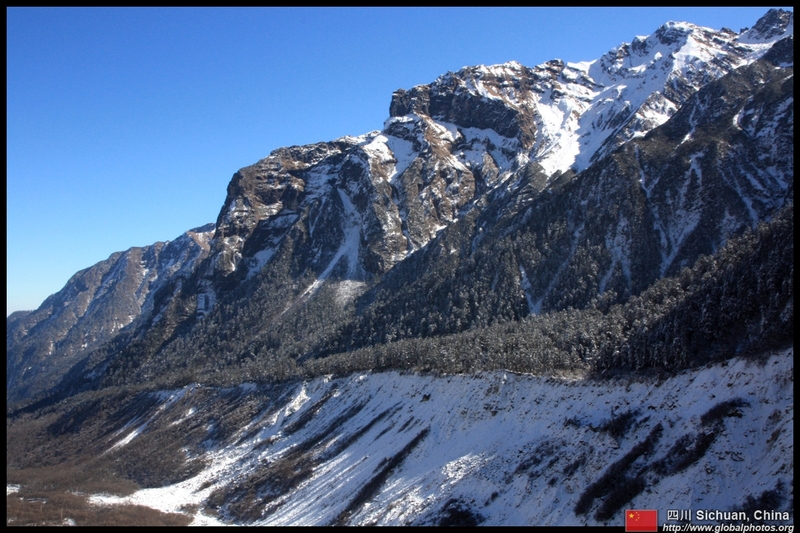 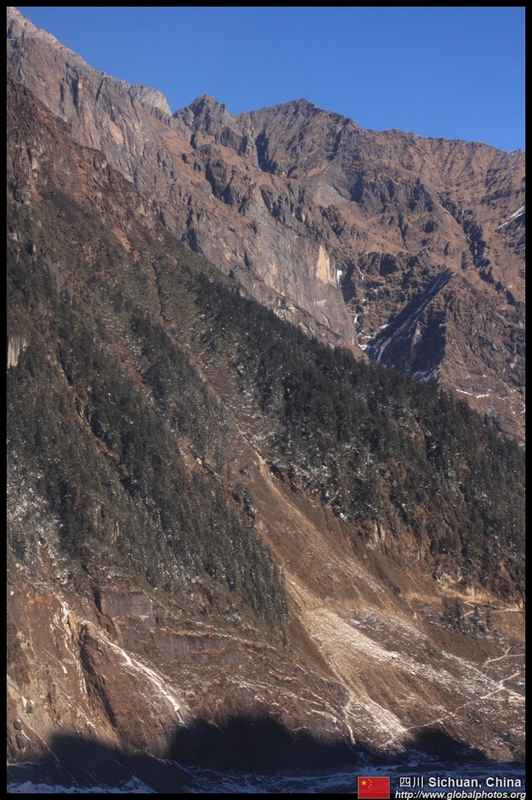 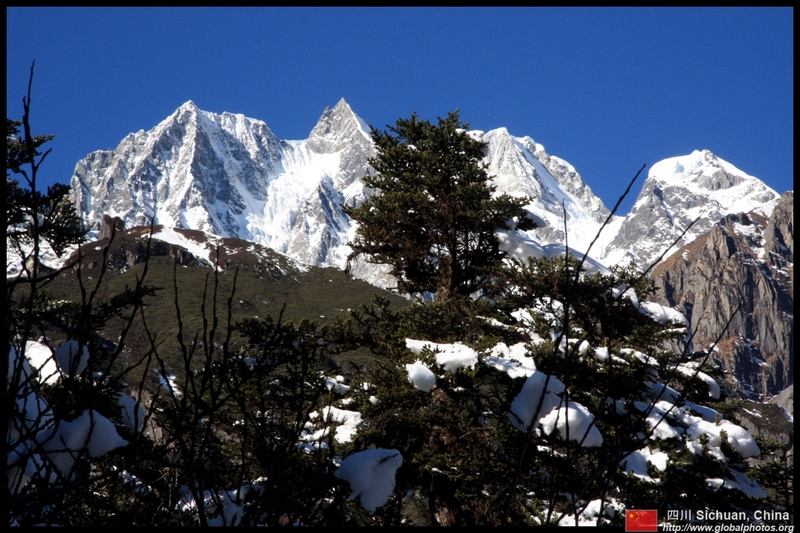 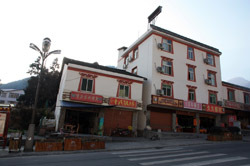 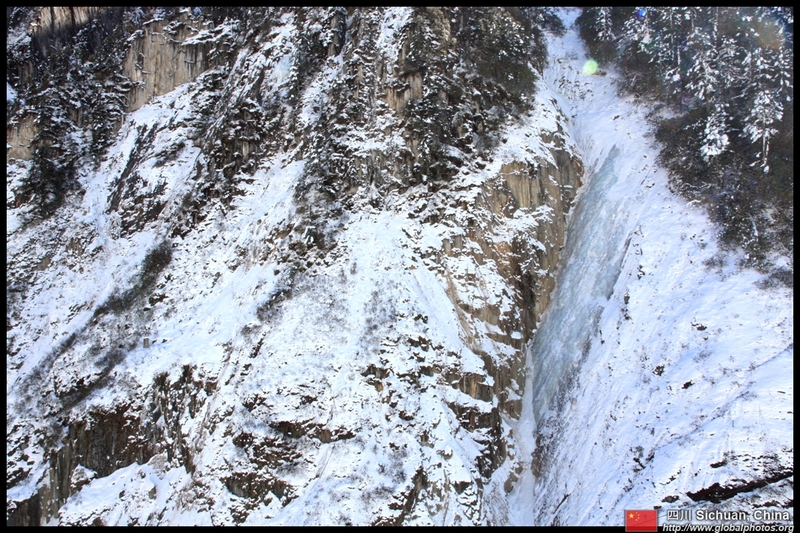 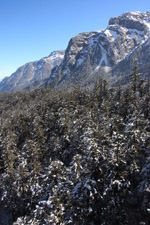 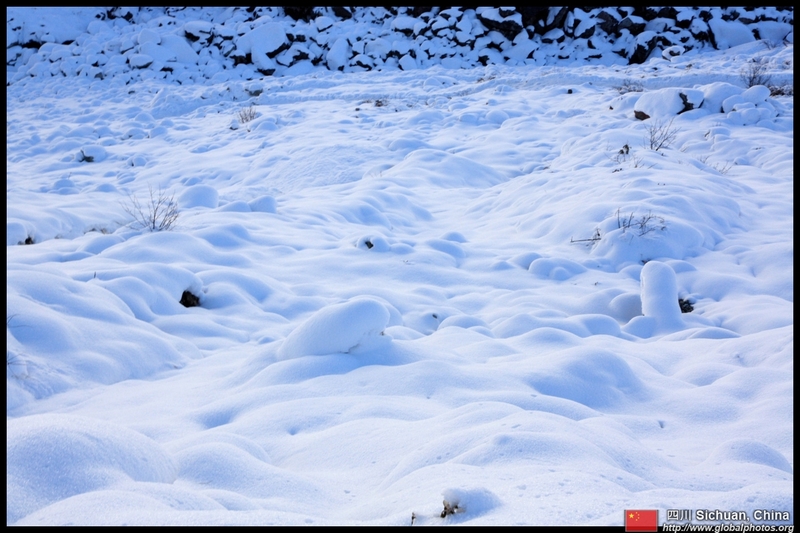 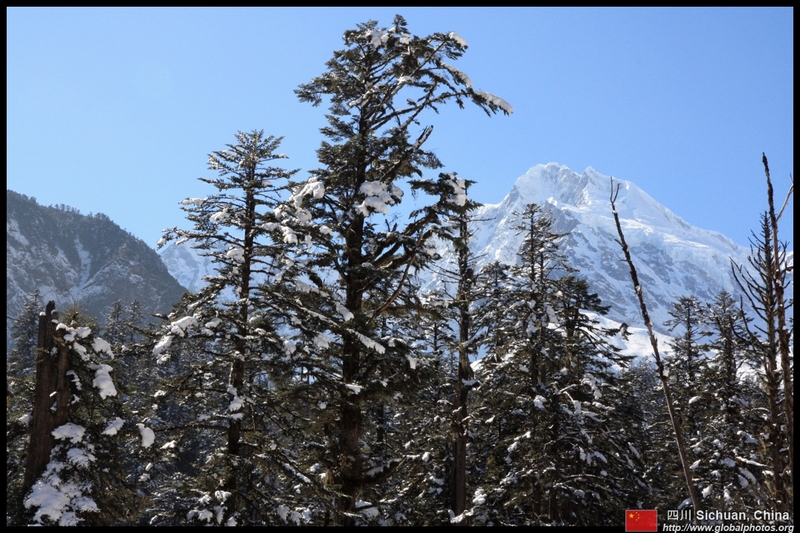 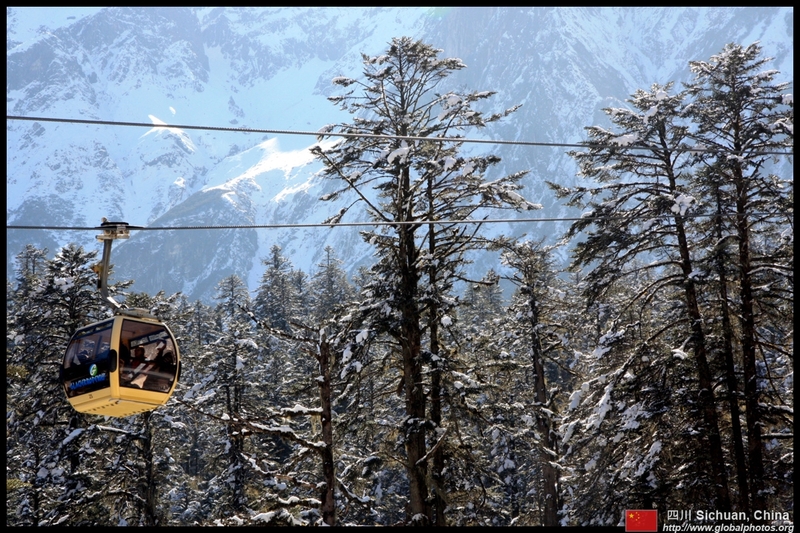 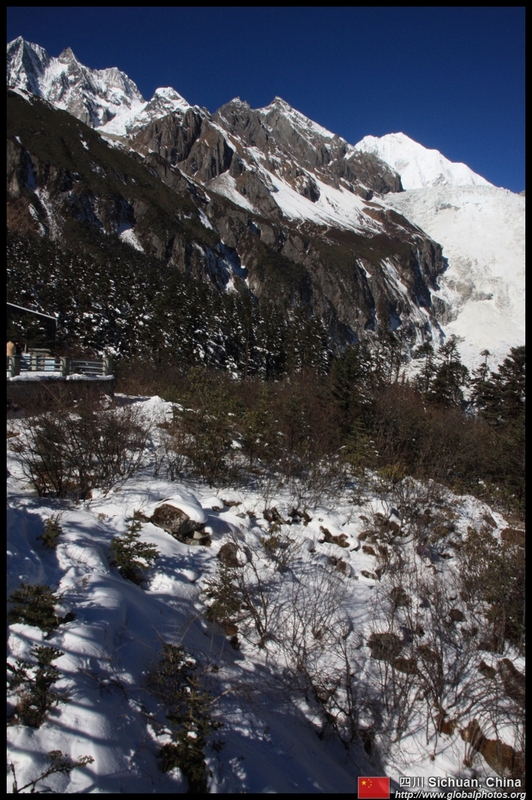 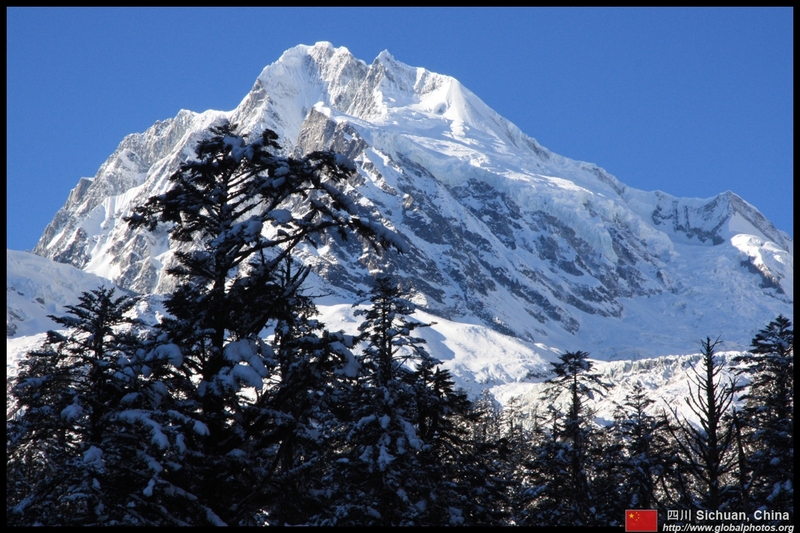 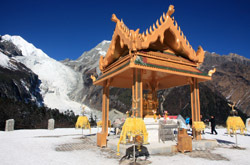 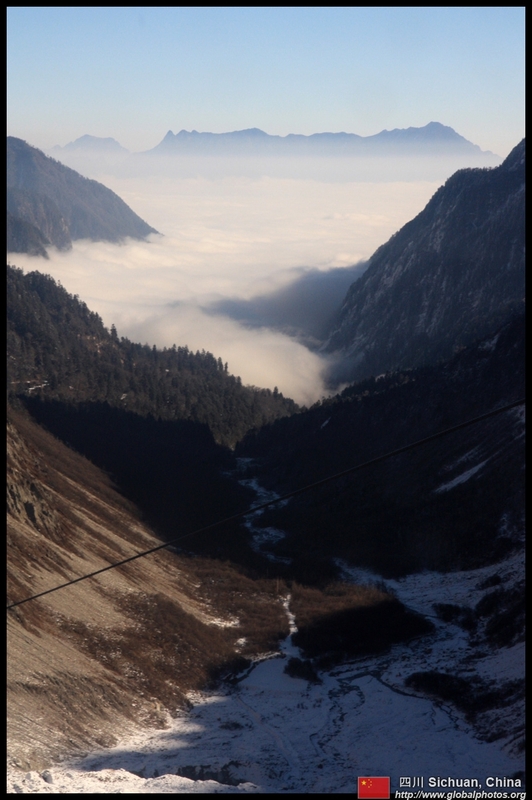 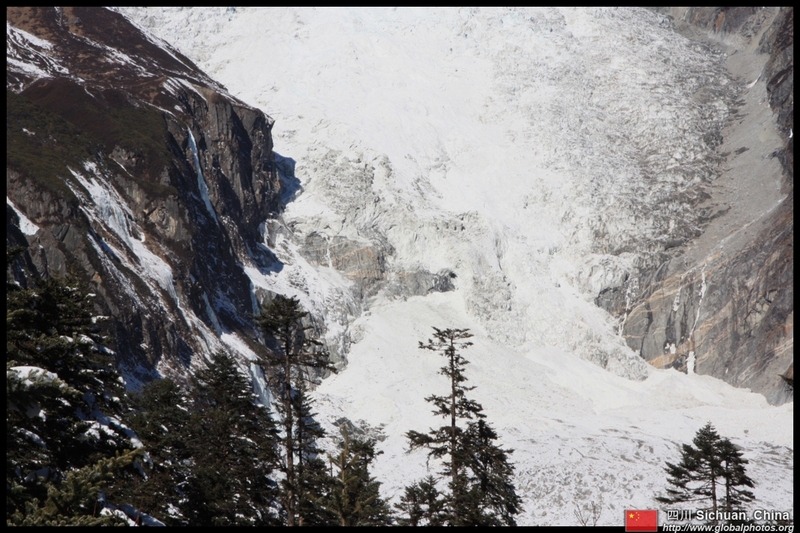 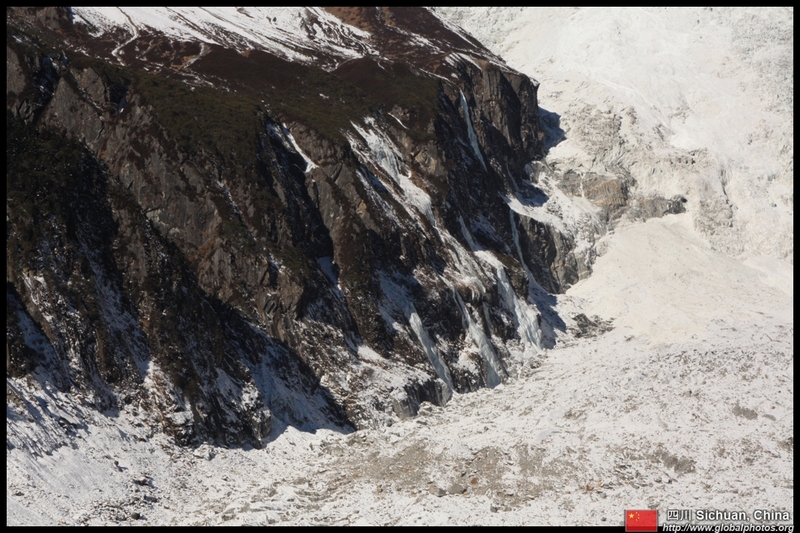 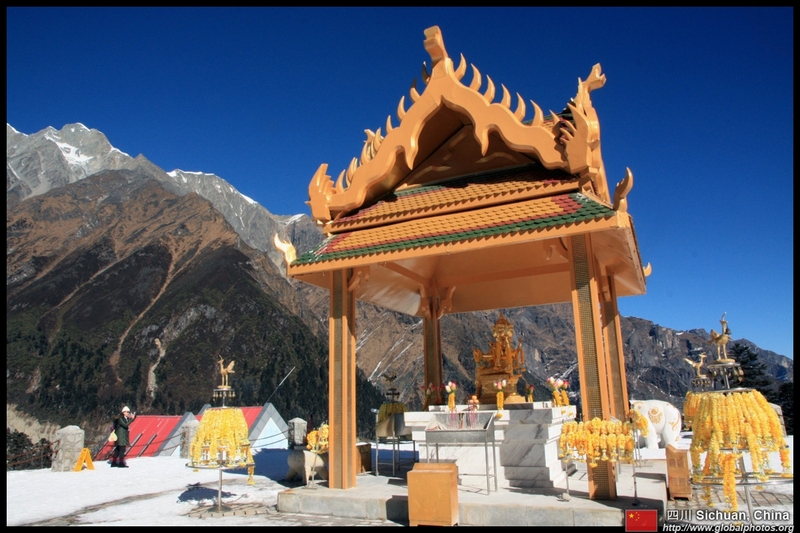 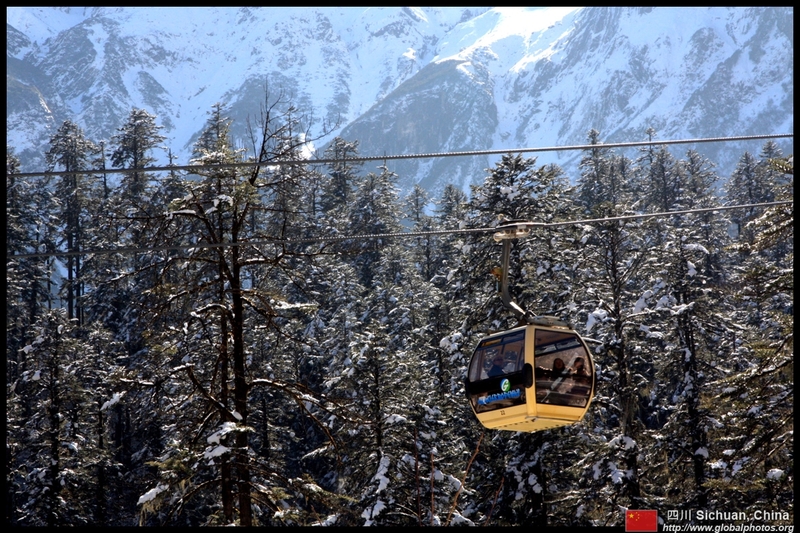 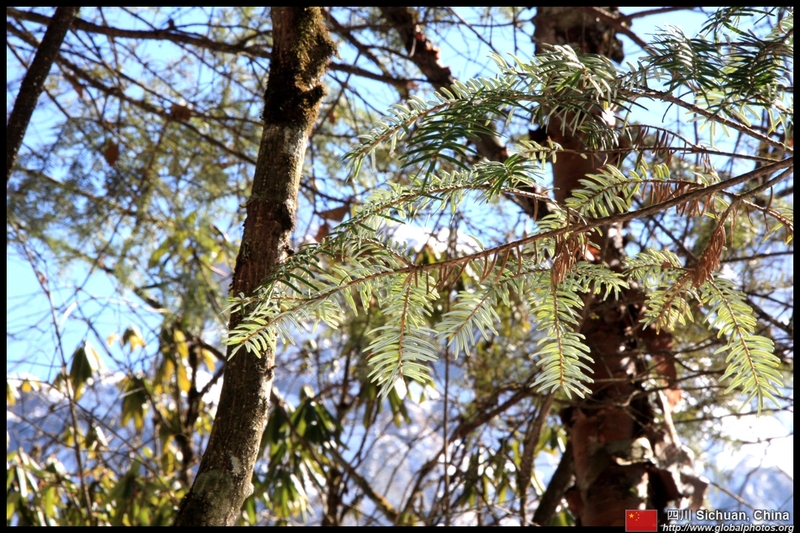 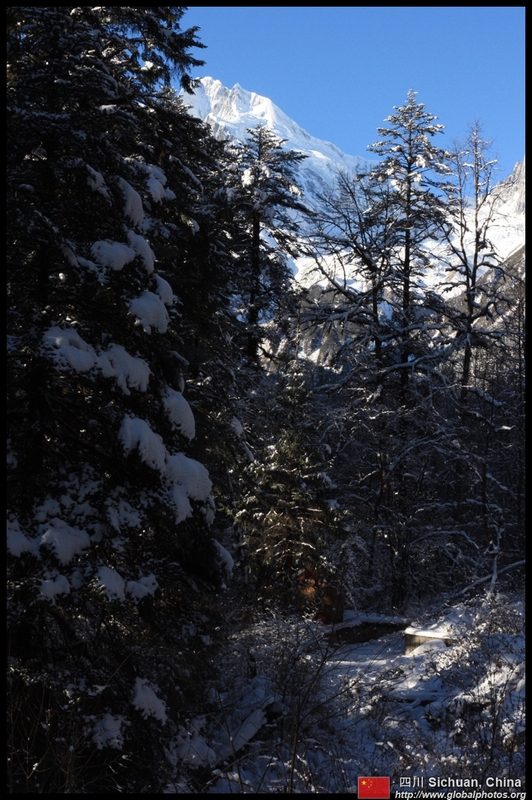 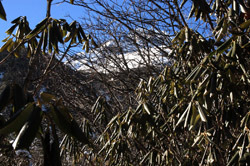 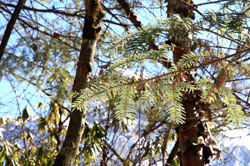 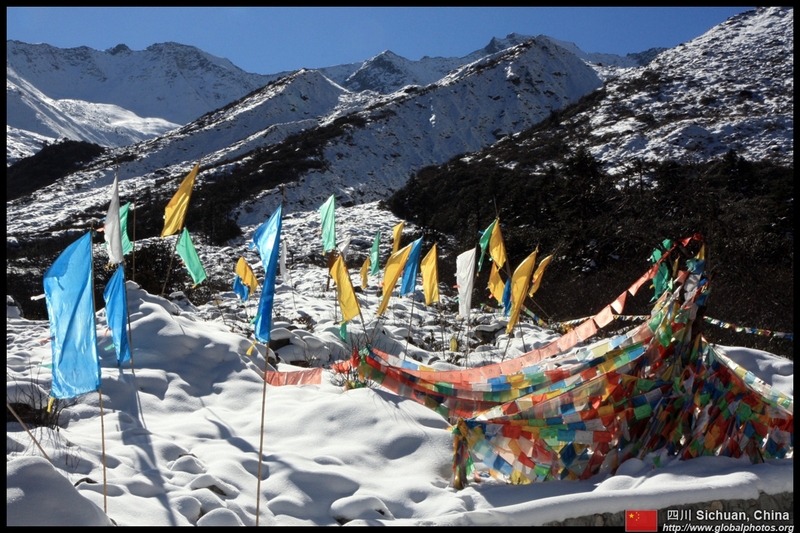 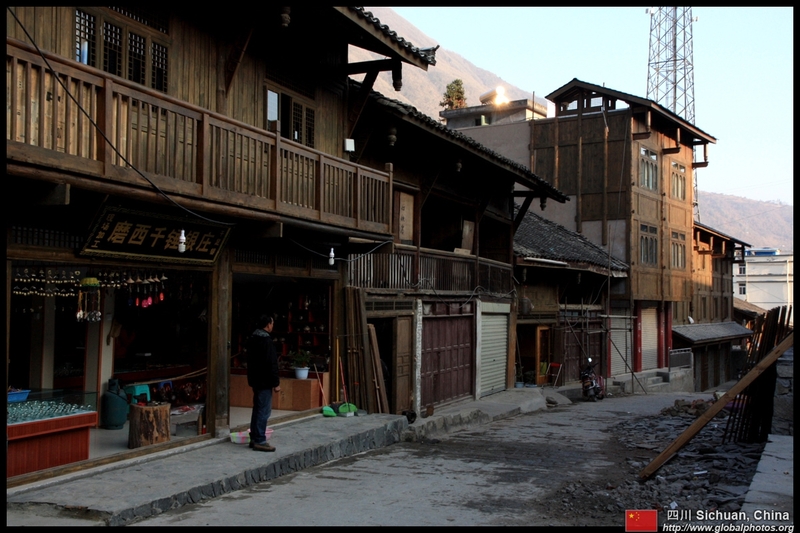 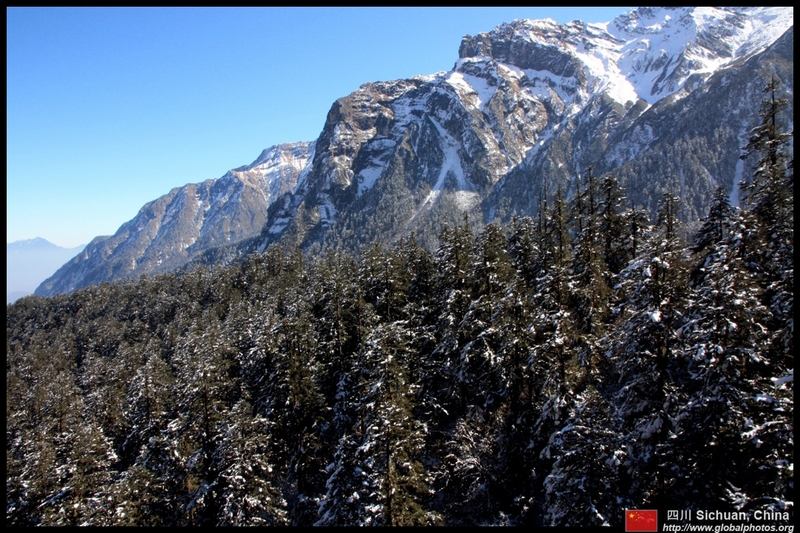 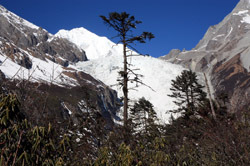 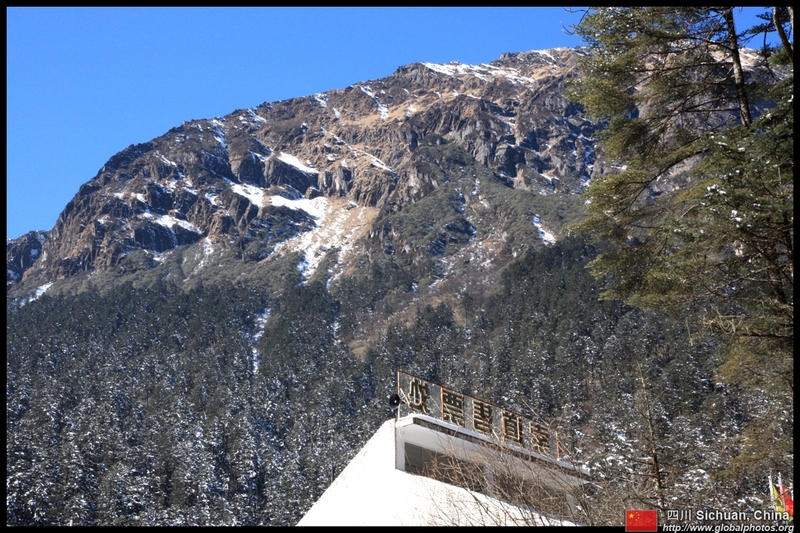 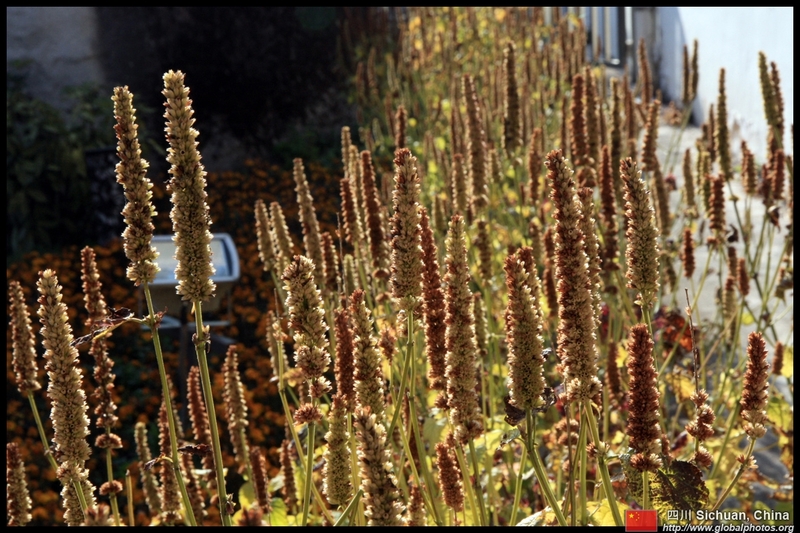 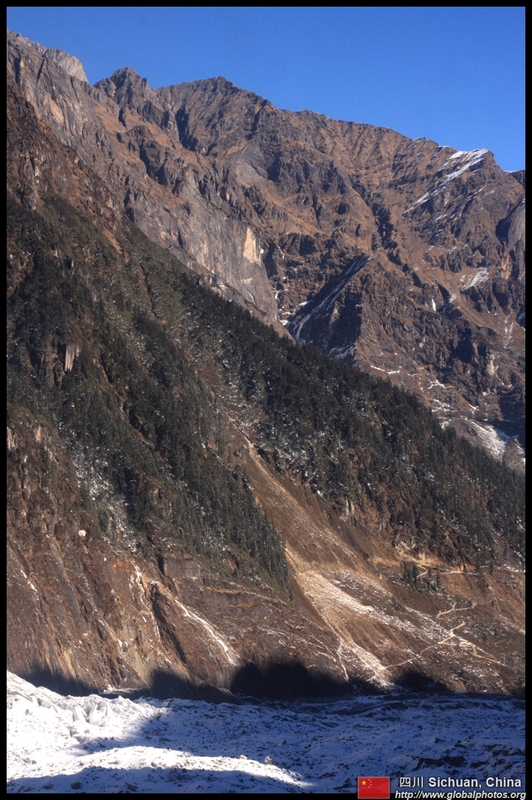 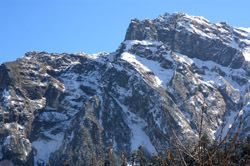 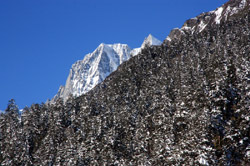 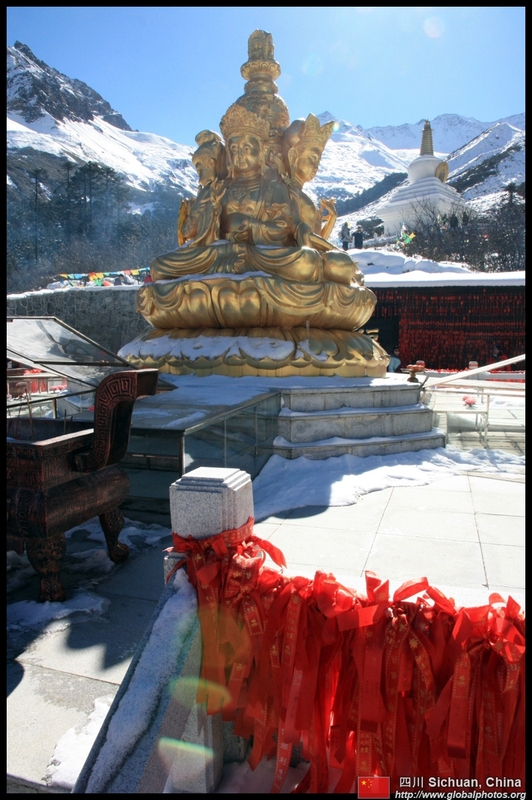 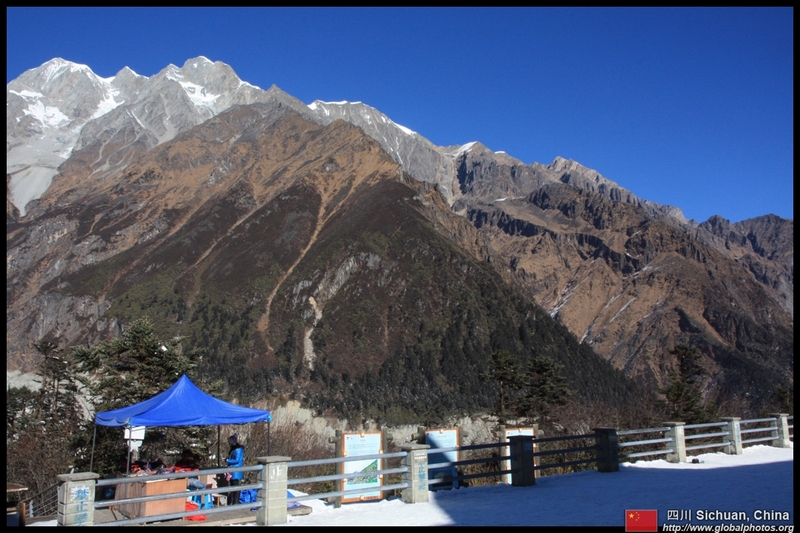 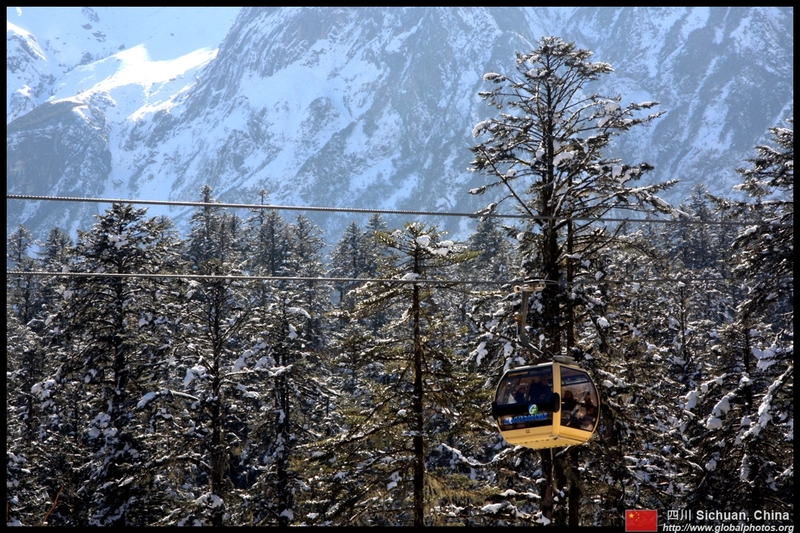 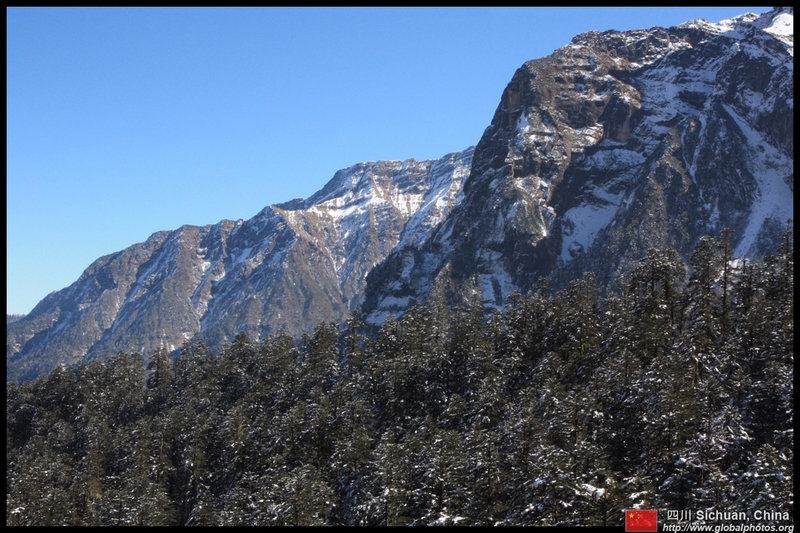 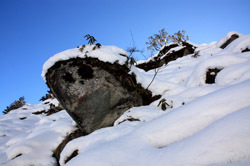 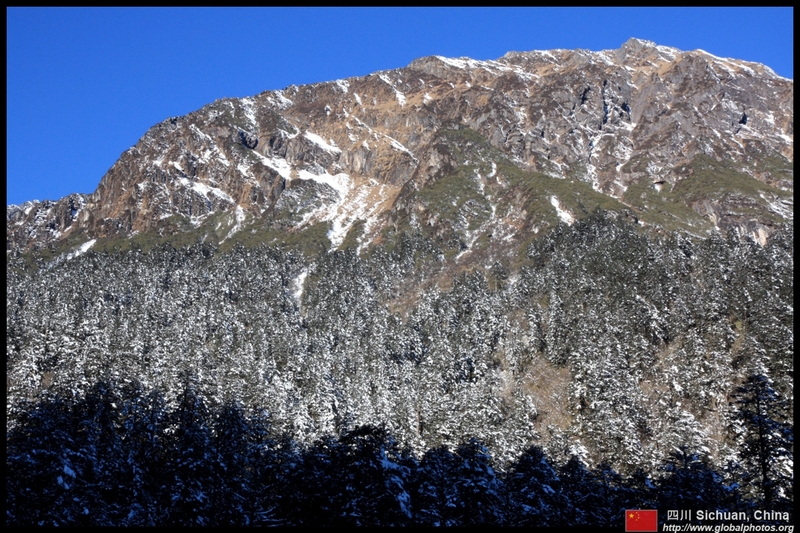 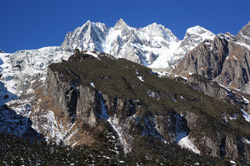 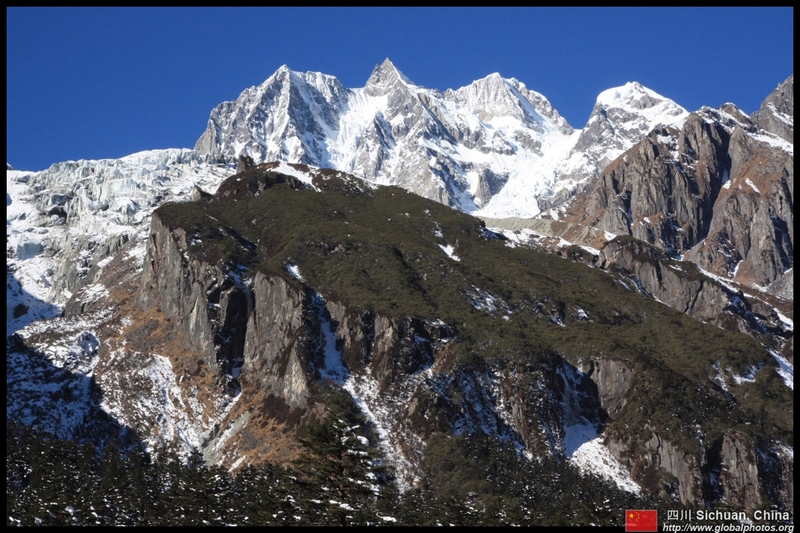 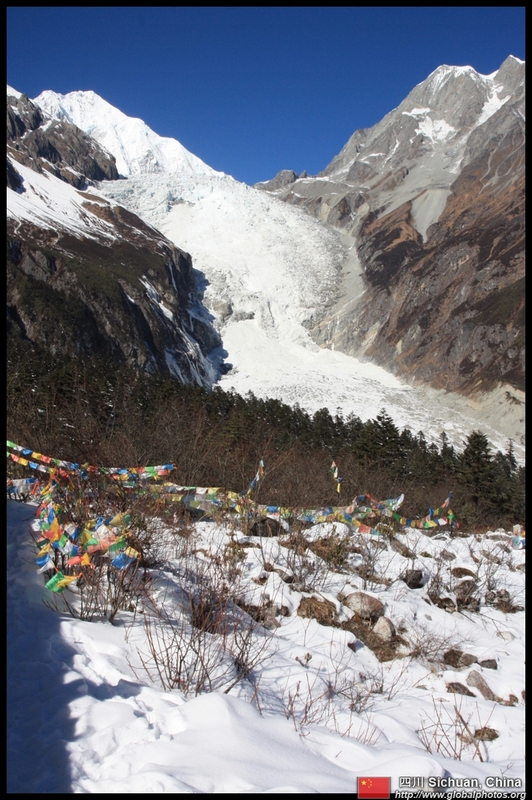 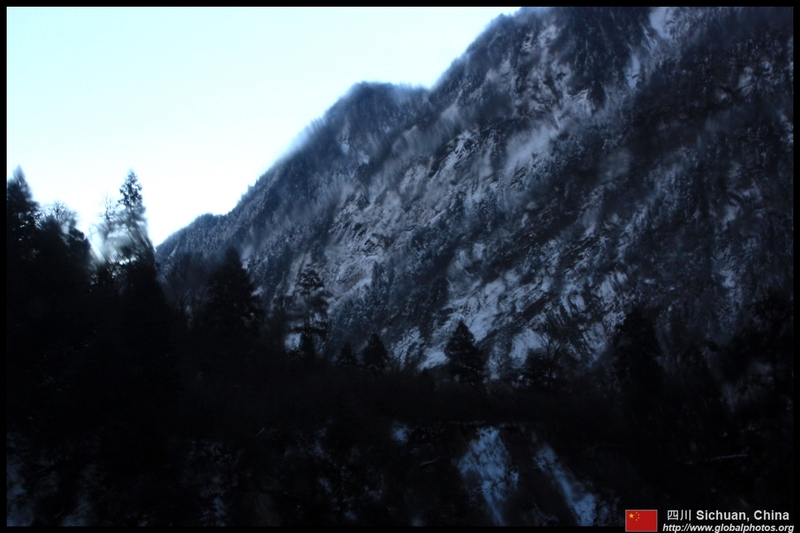 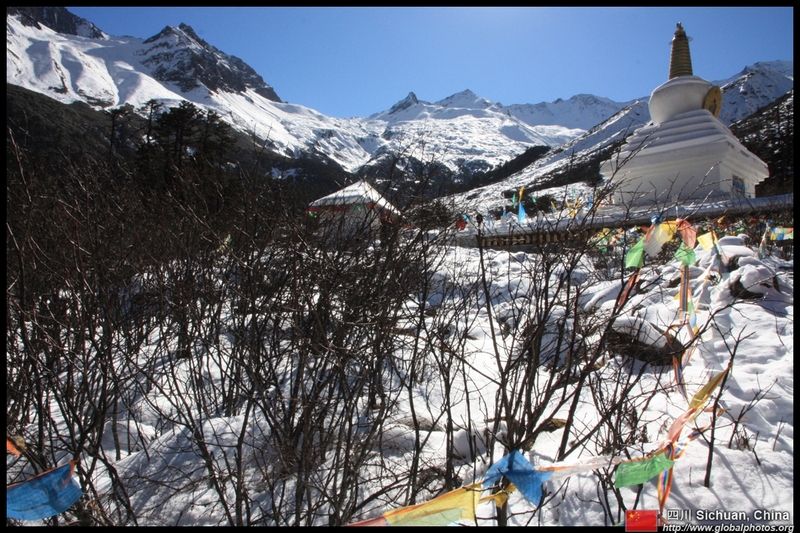 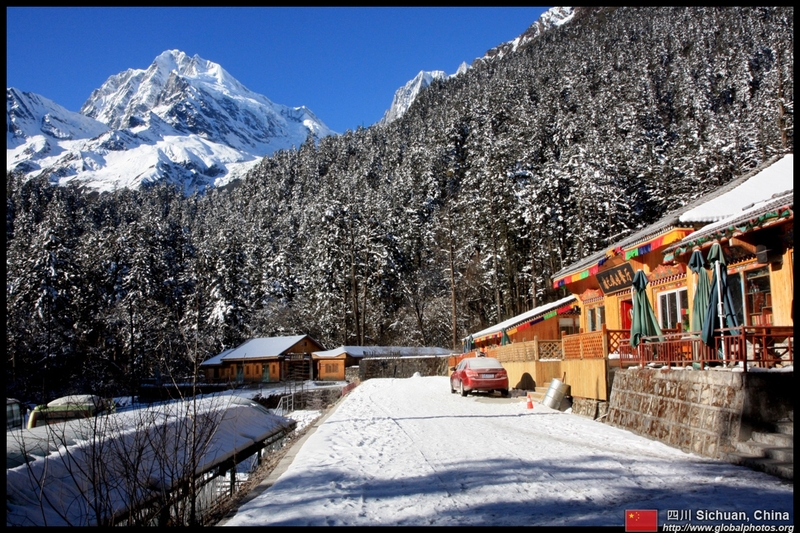 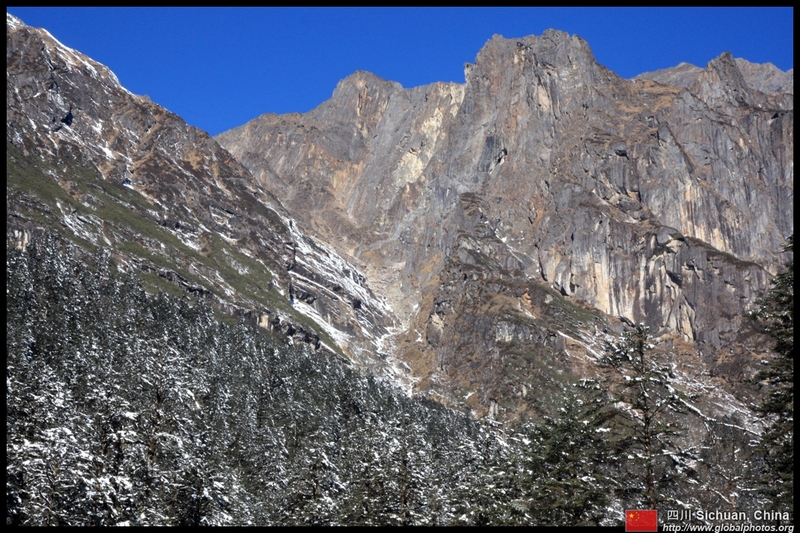 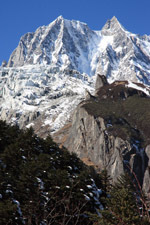 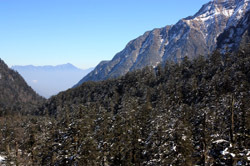 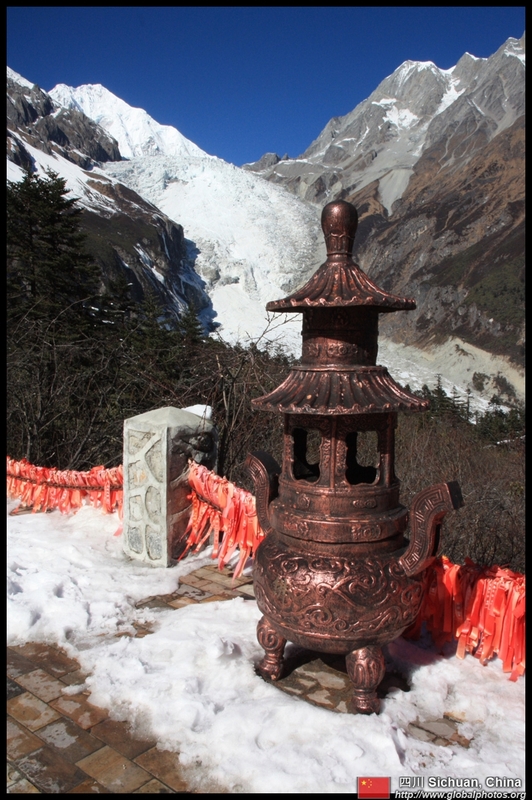 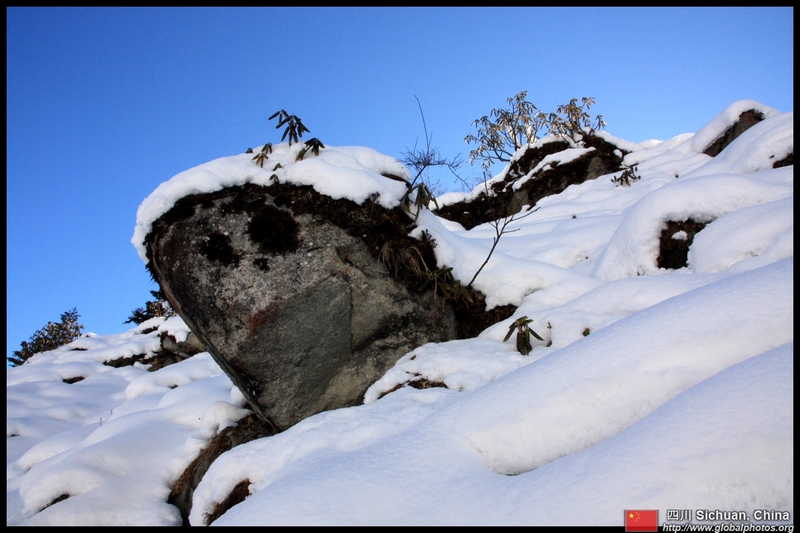 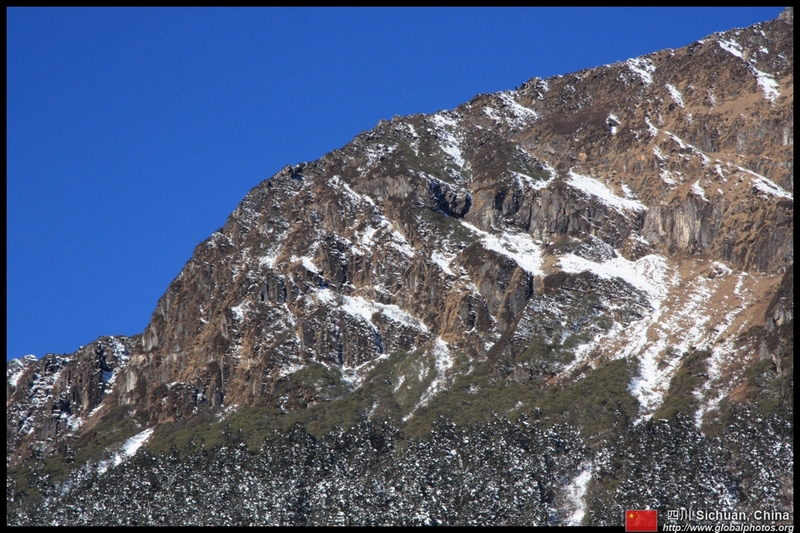 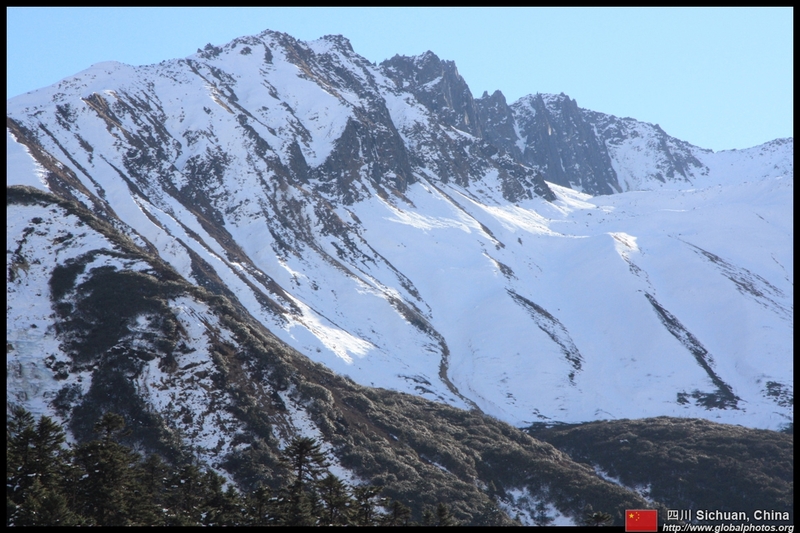 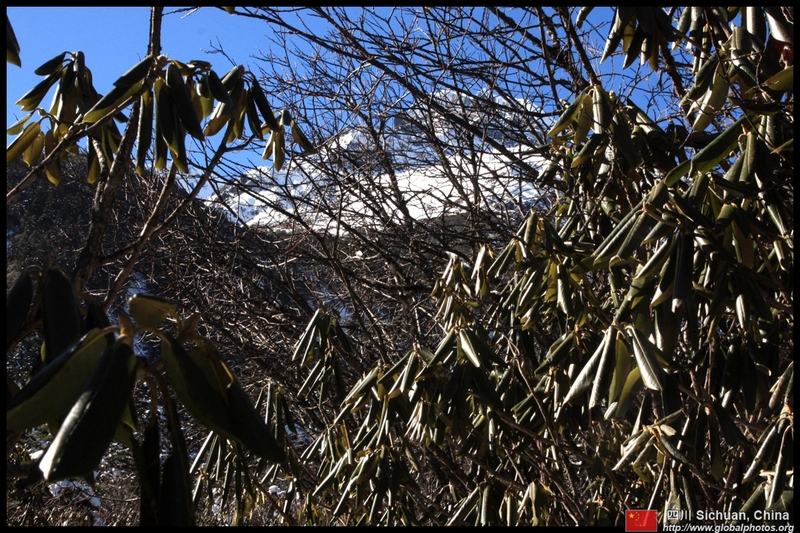 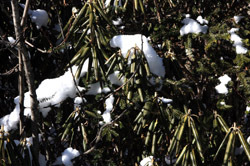 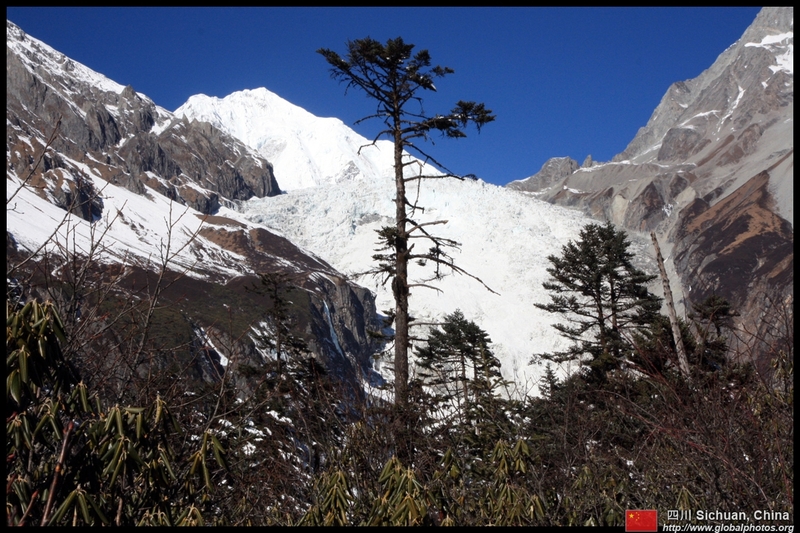 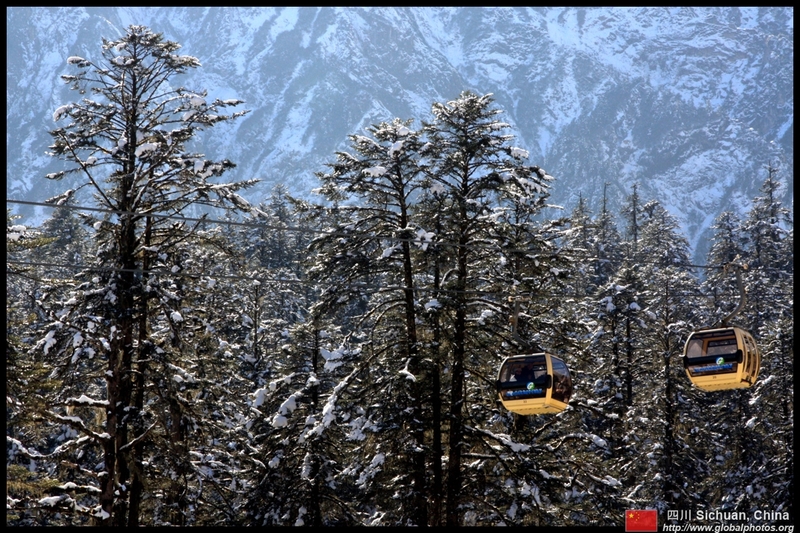 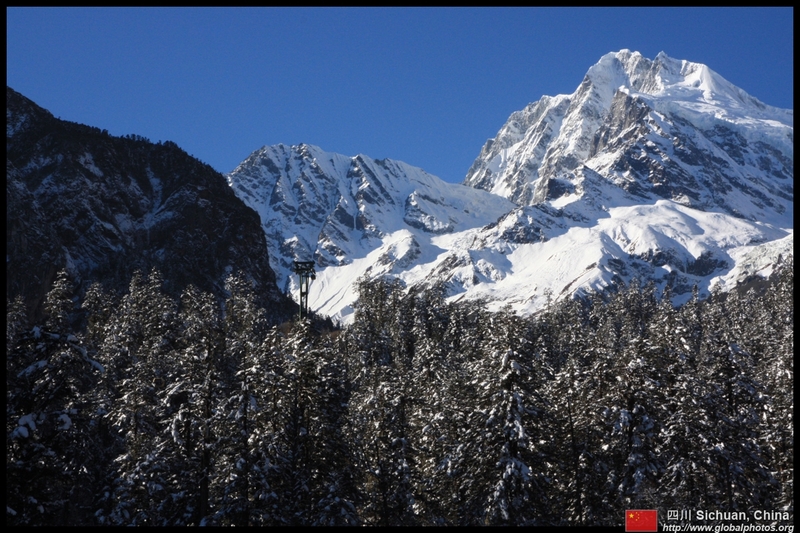 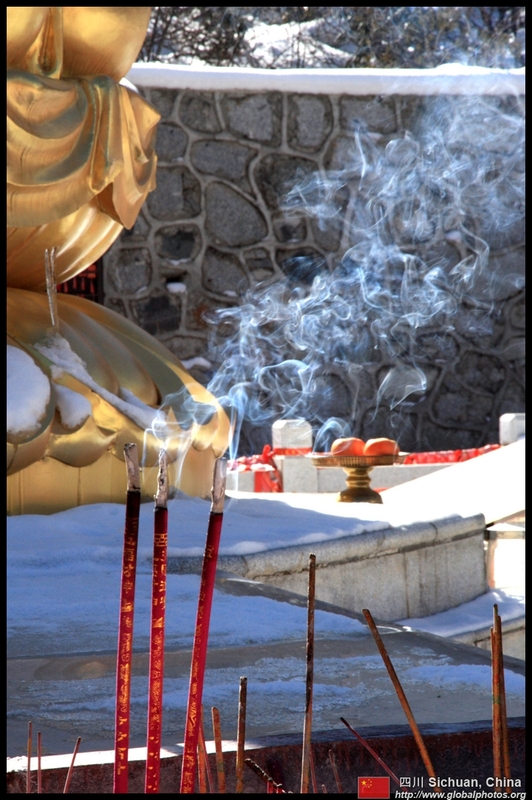 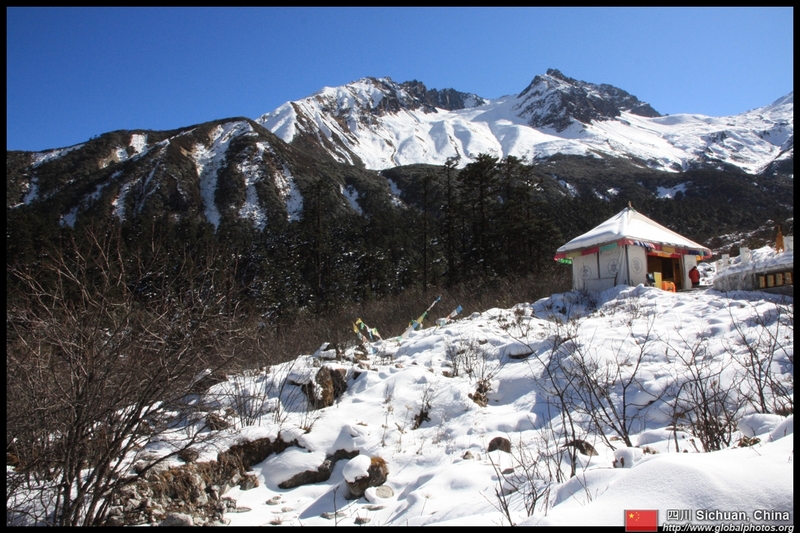 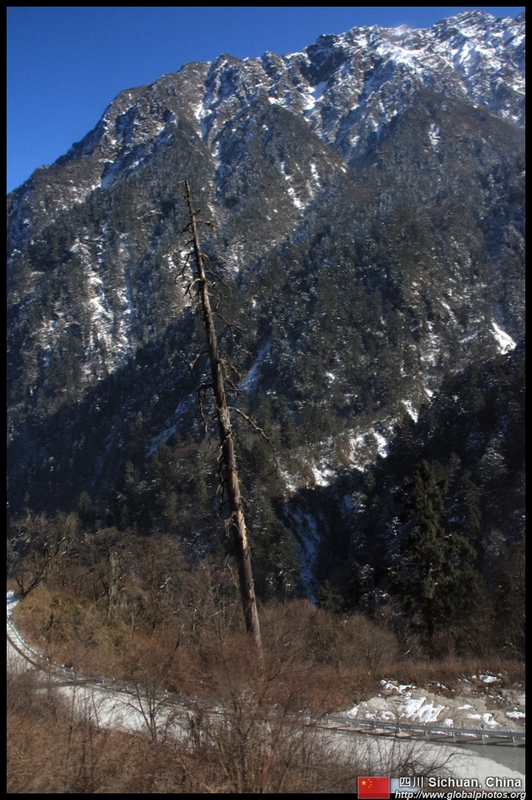 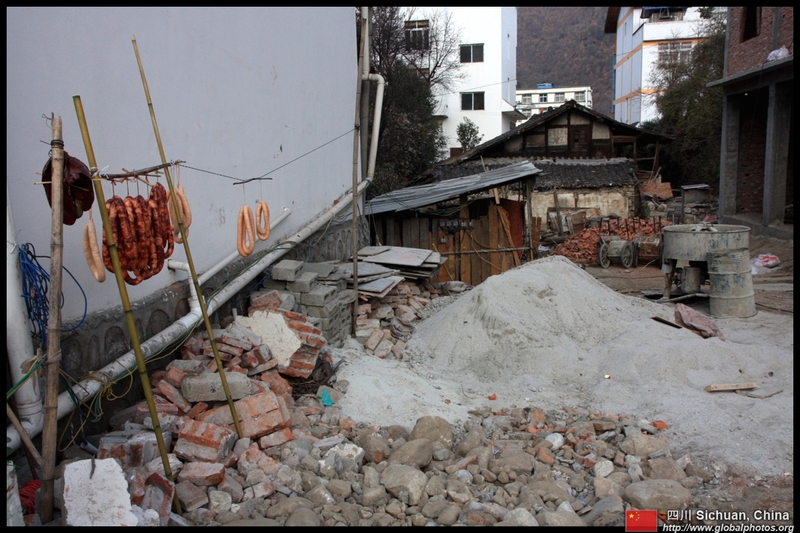 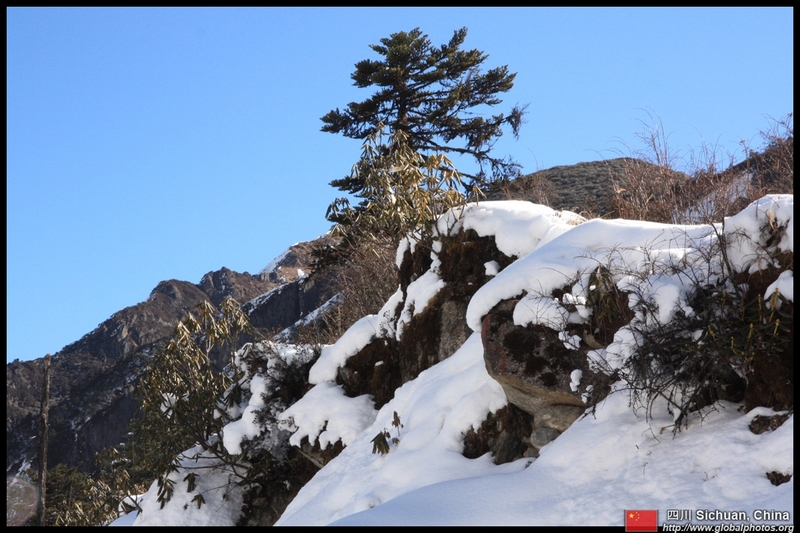 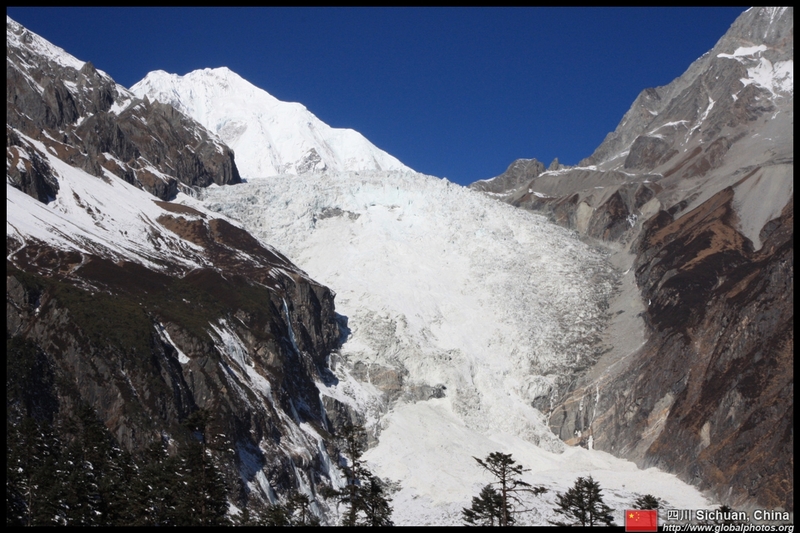 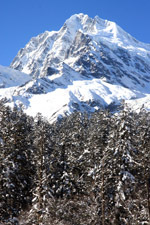 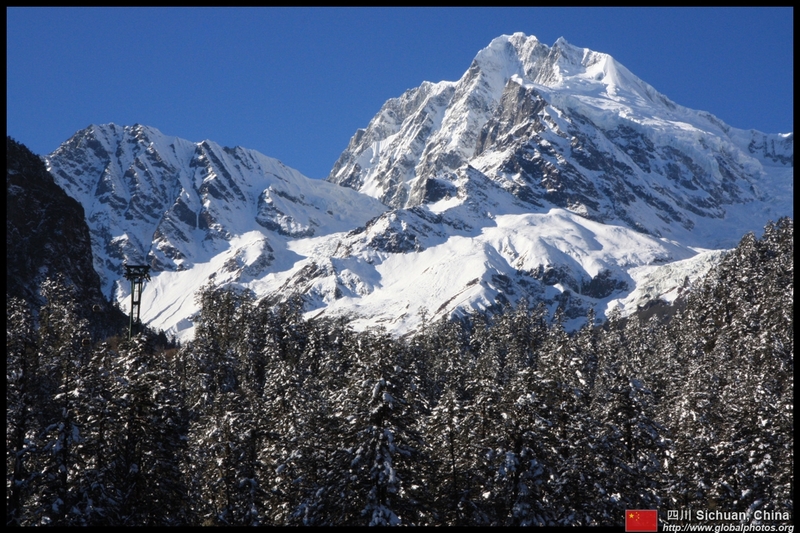 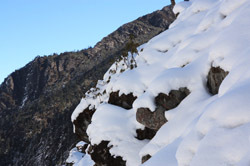 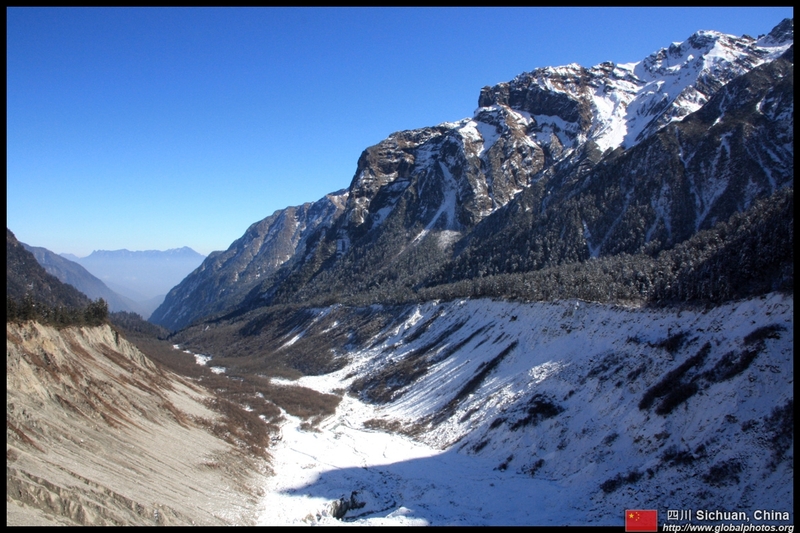 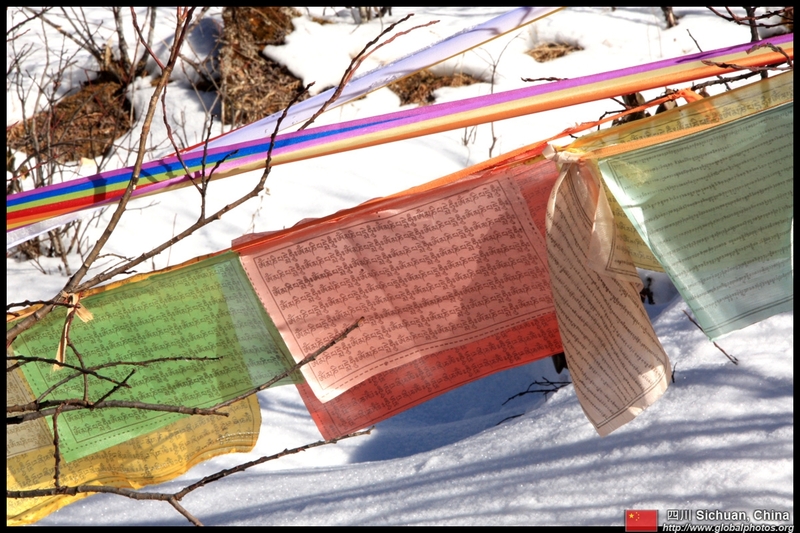 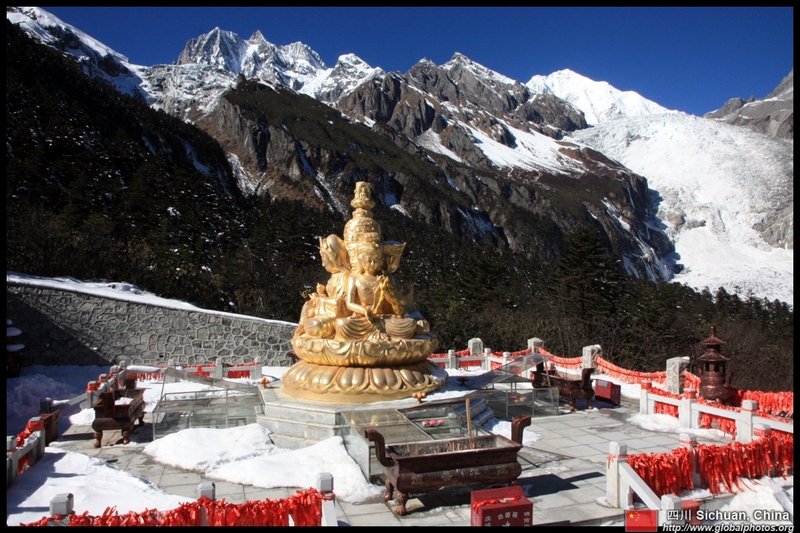 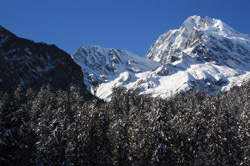 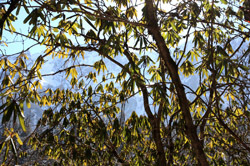 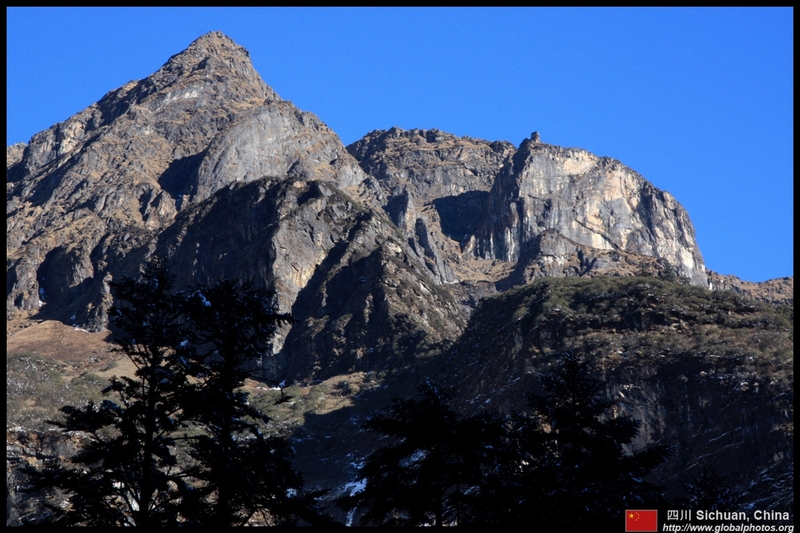 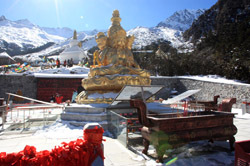 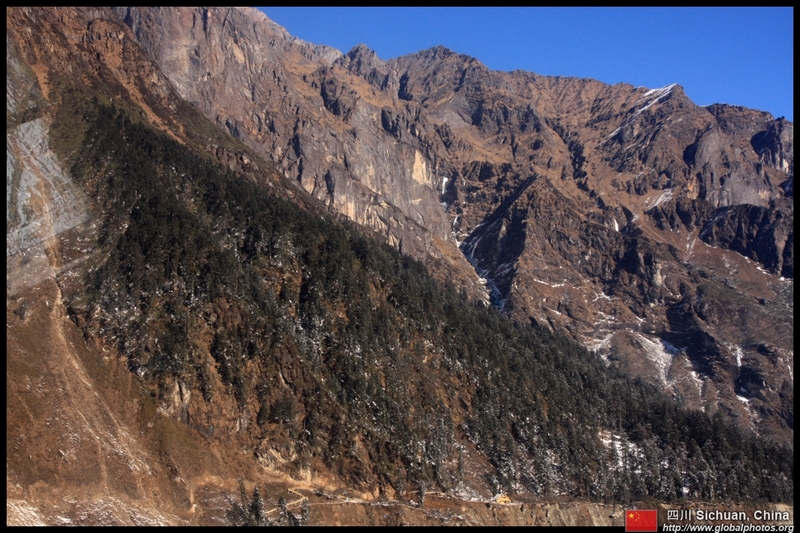 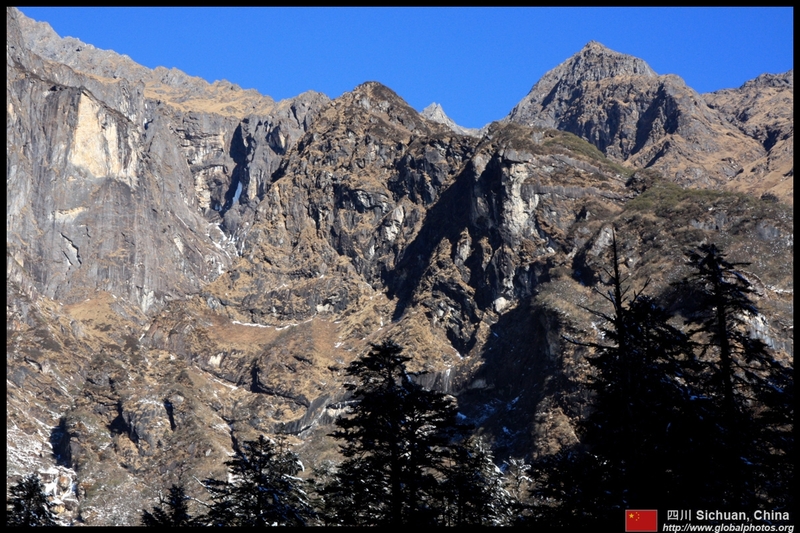 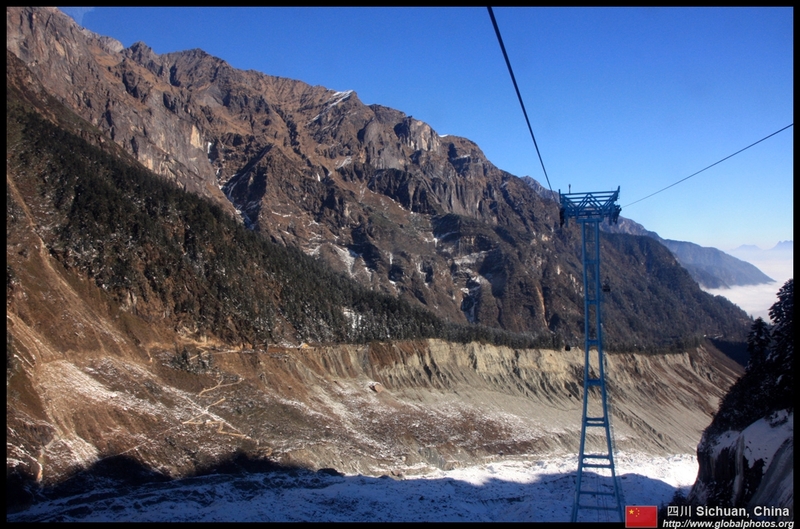 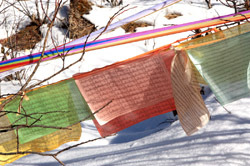 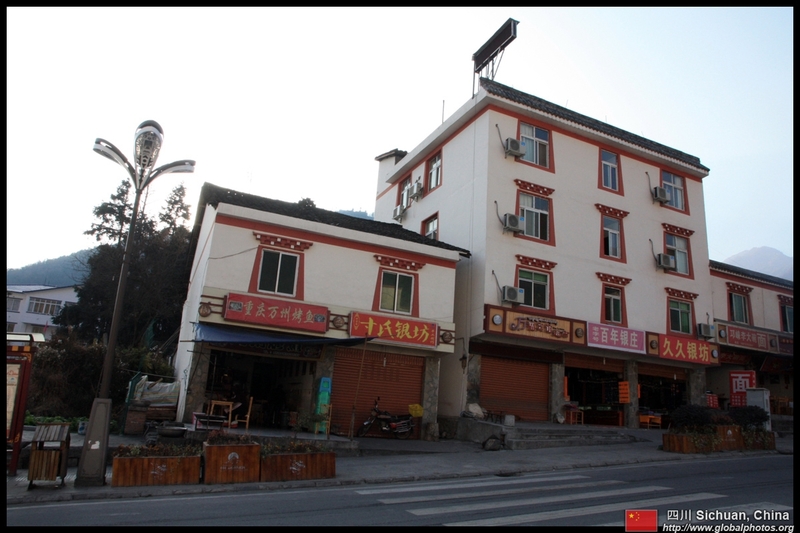 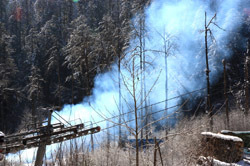 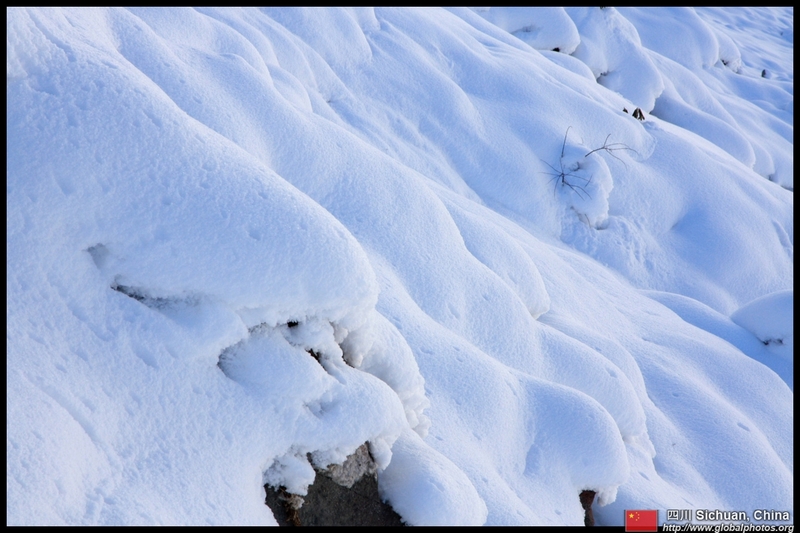 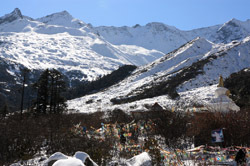 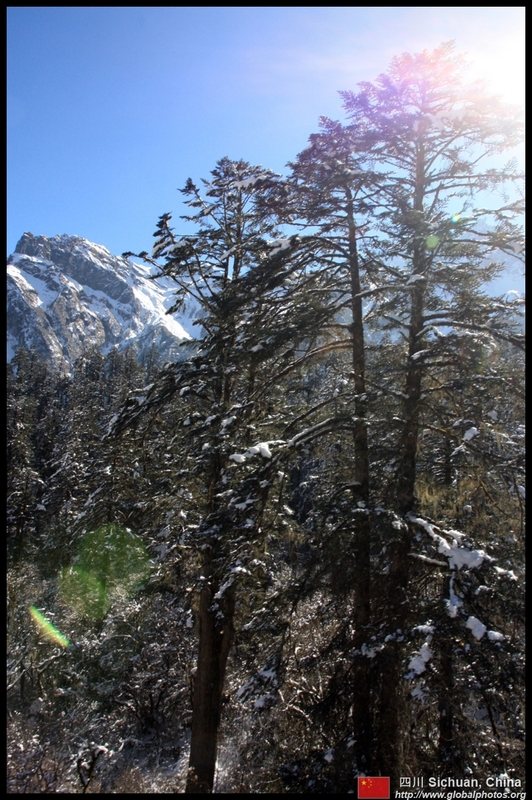 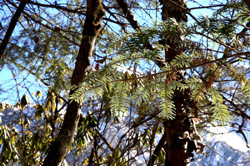 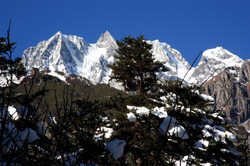 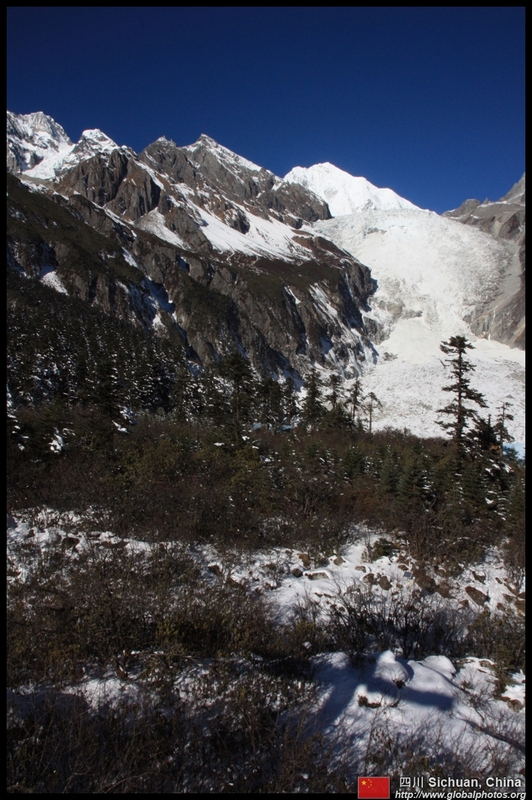 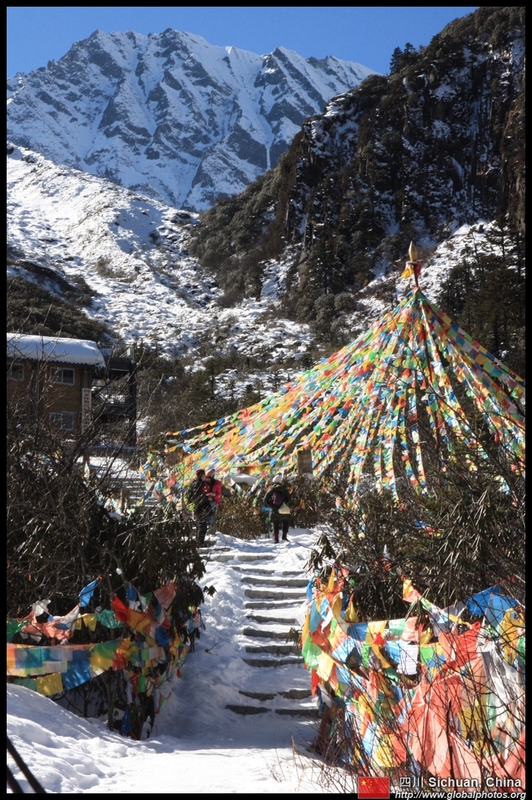 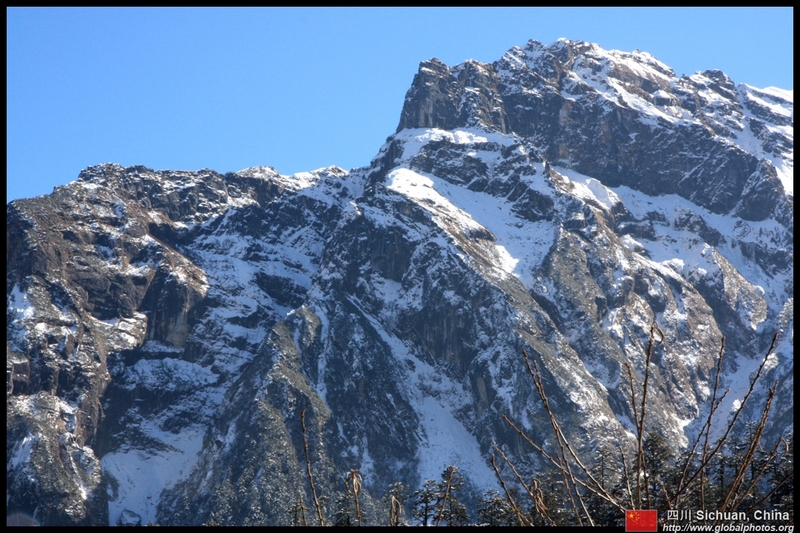 This part of Sichuan province is famous for its mountains and glaciers. 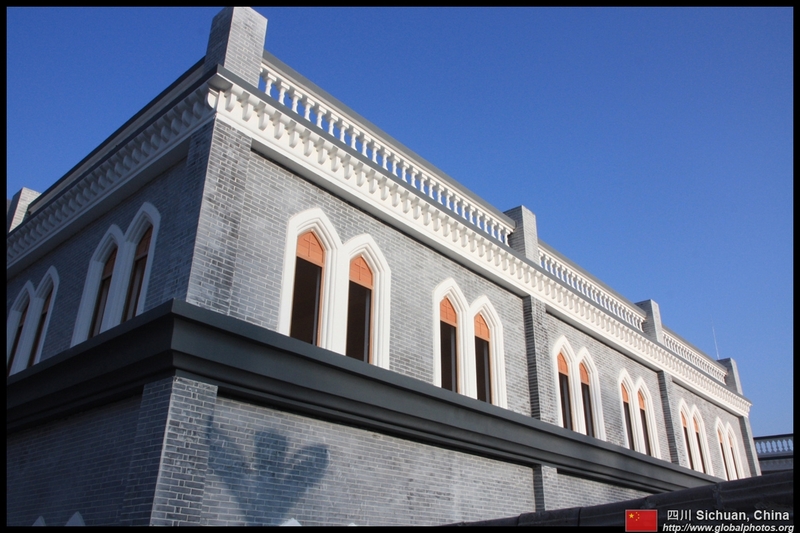 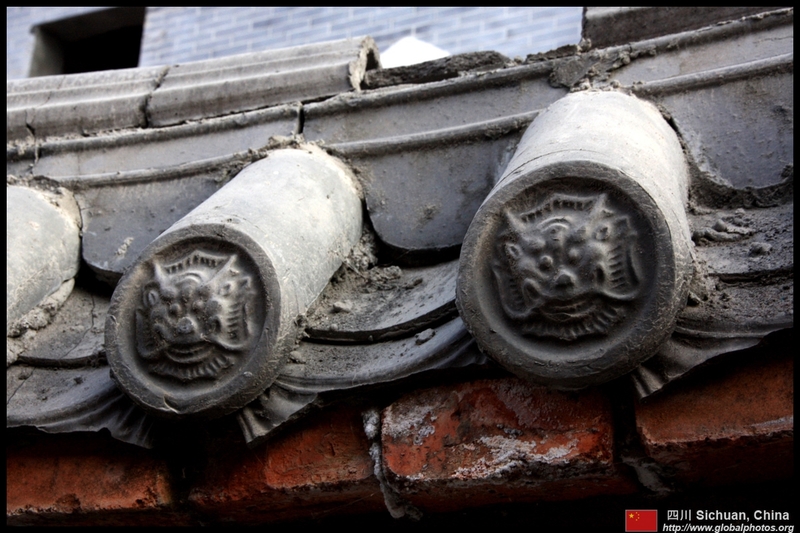 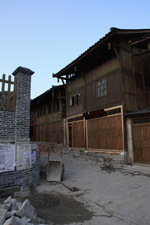 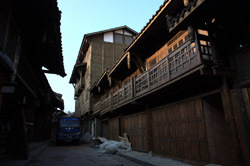 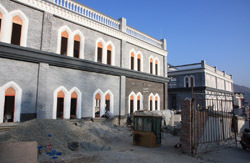 Upon arriving at Moxizhen, visitors need to take a 1-hour bus ride from the ticketing area to the cable car. 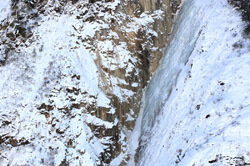 This is not the easiest place to reach. 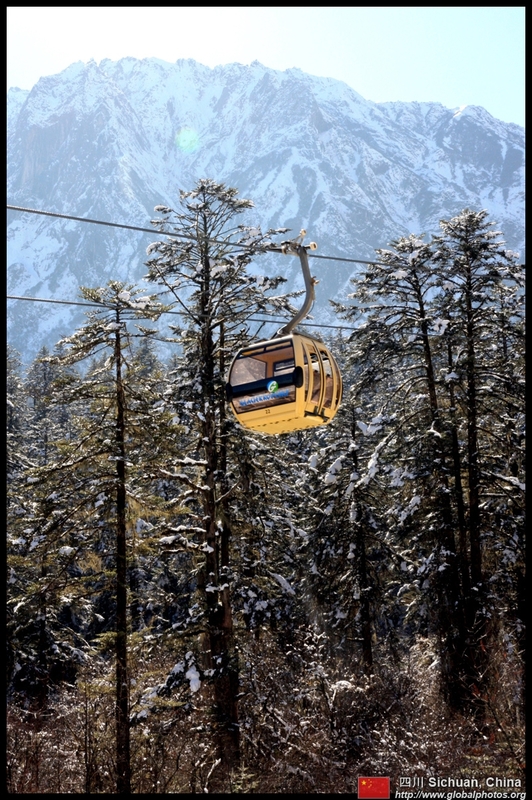 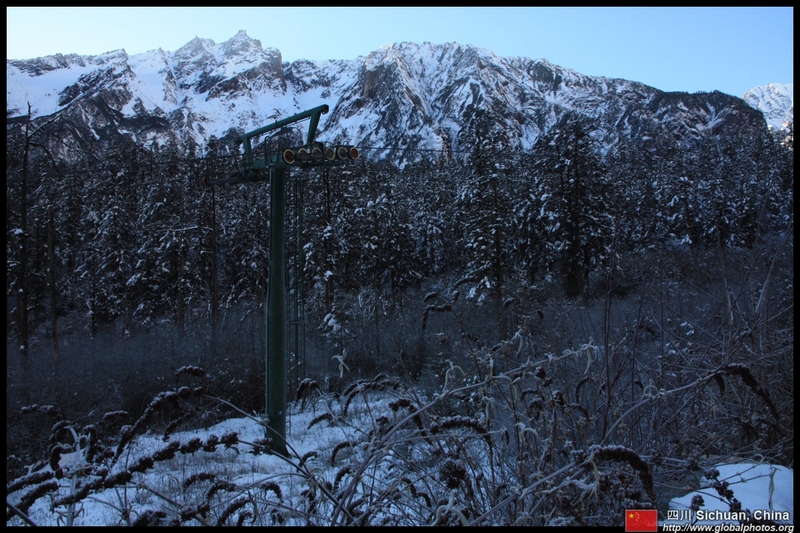 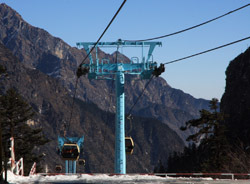 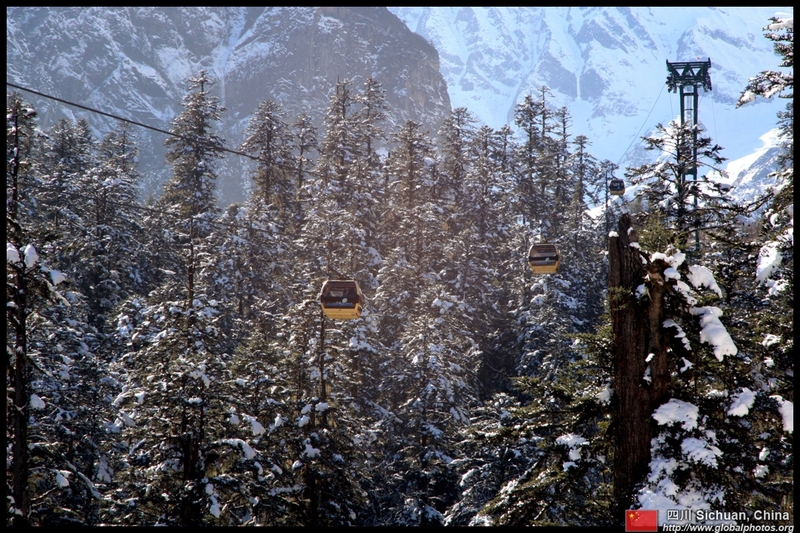 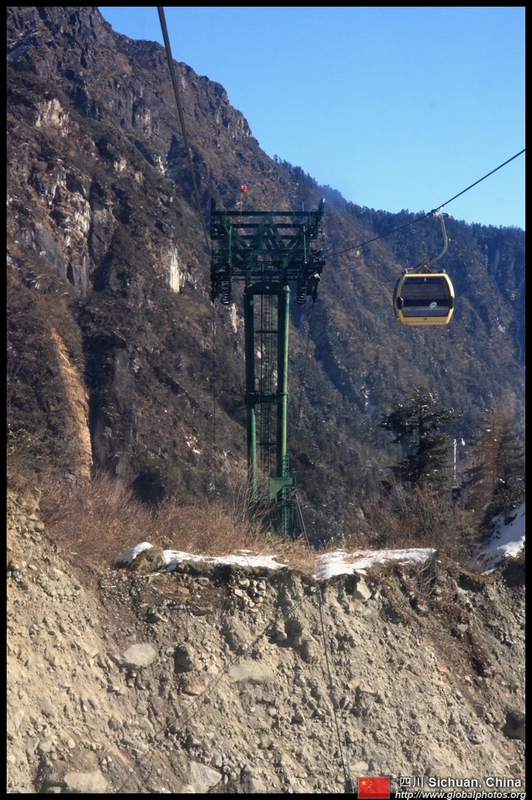 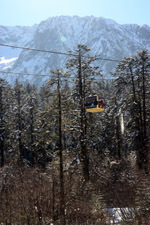 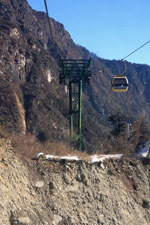 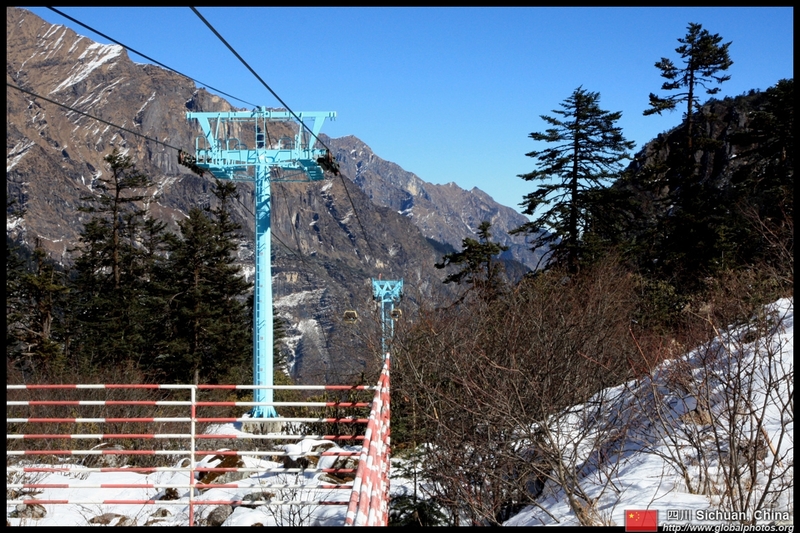 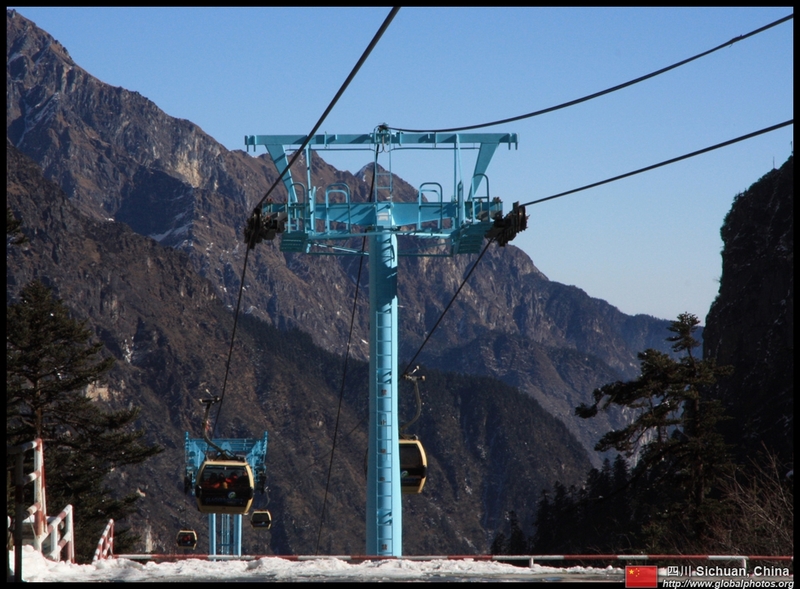 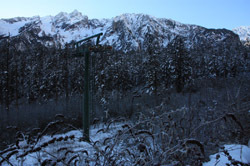 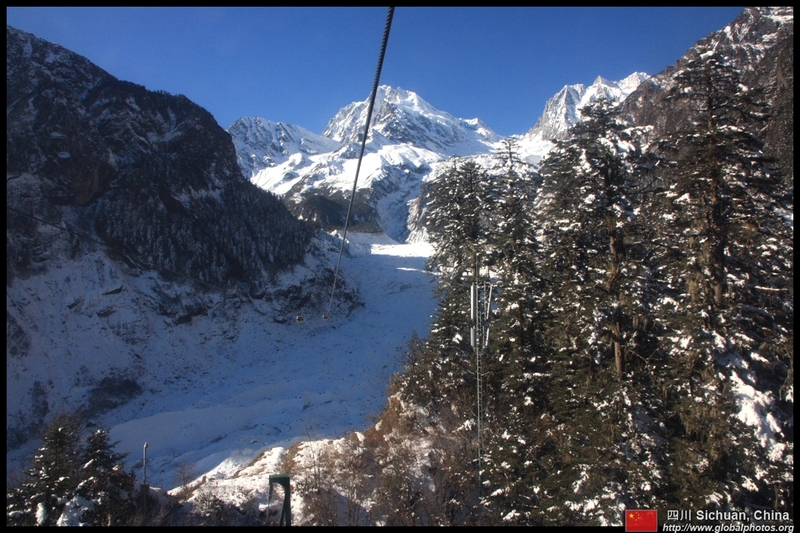 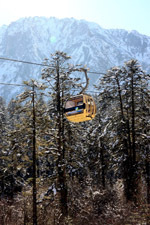 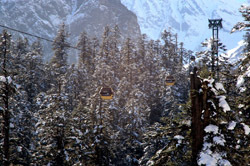 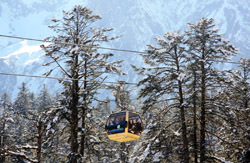 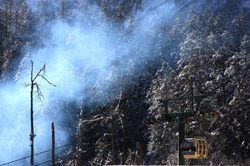 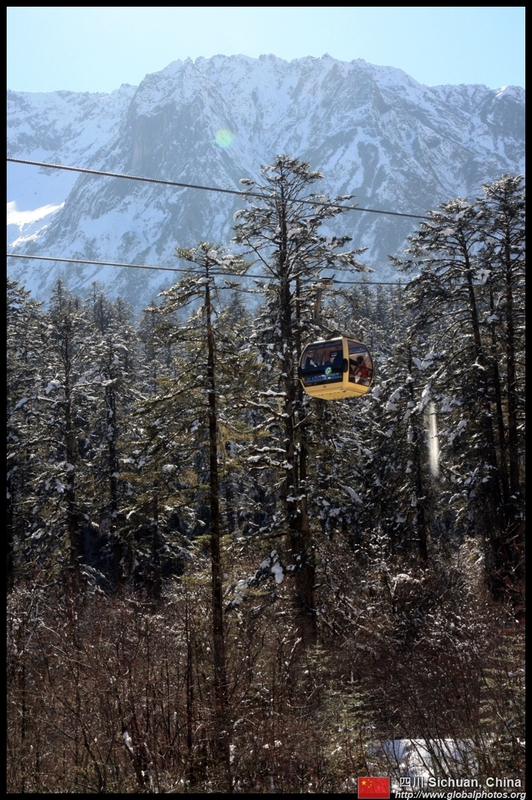 While the ticketing area was under thick clouds, the cable car parking lot was under bright sunshine. 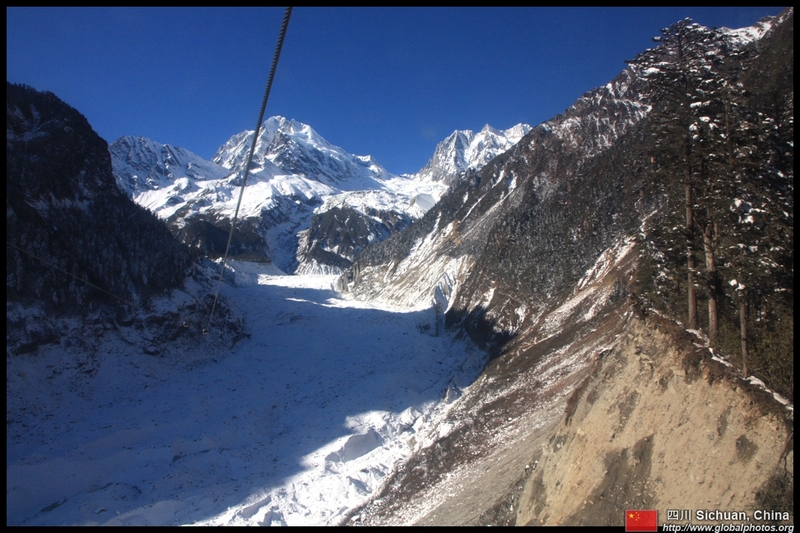 Views from the cable car put the weather difference into perspective. 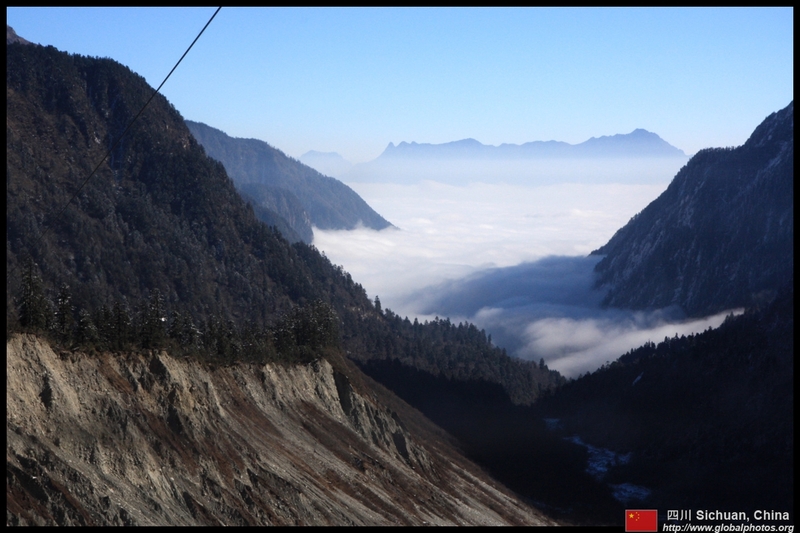 We were already above the cloud cover. 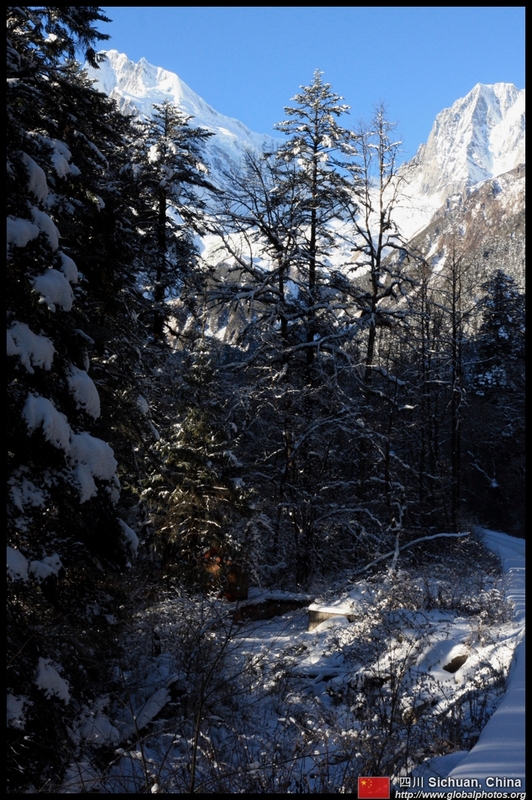 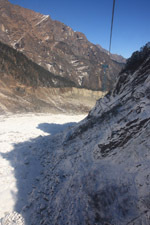 The glacier extends along the valley below. 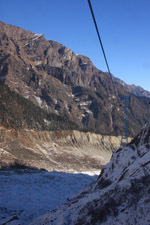 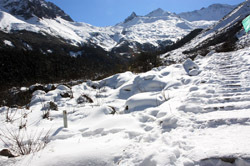 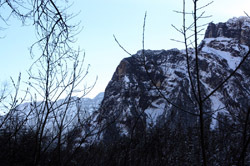 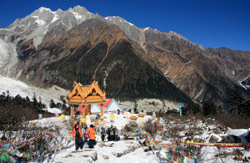 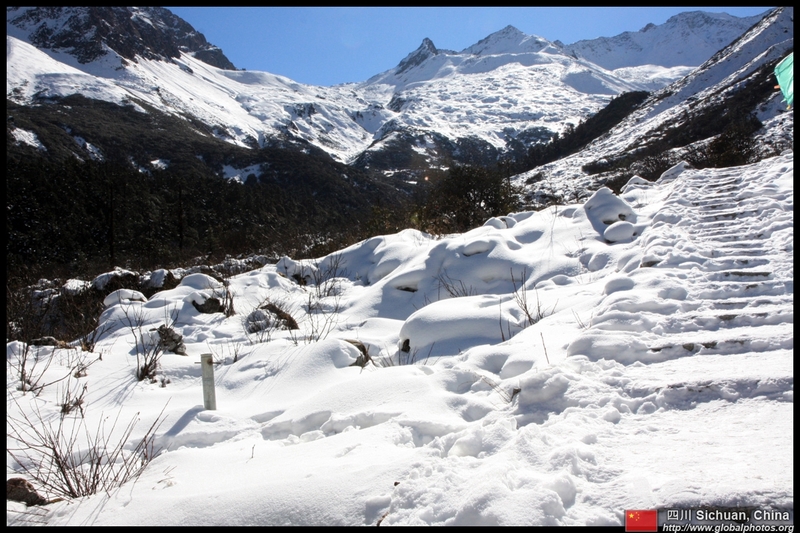 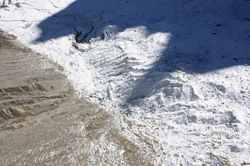 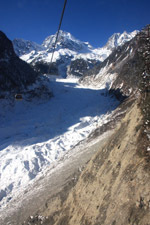 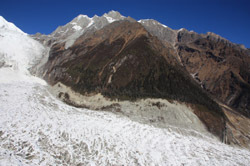 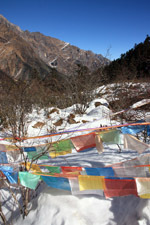 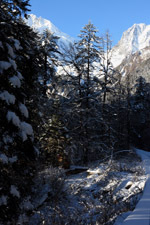 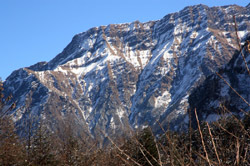 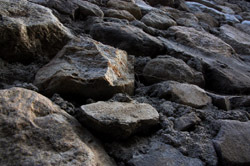 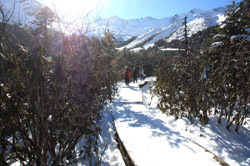 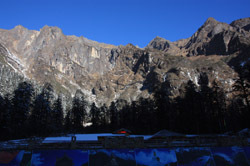 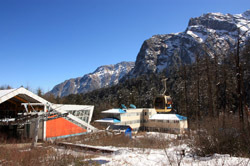 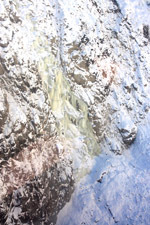 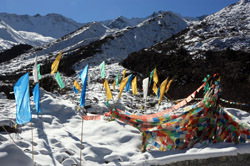 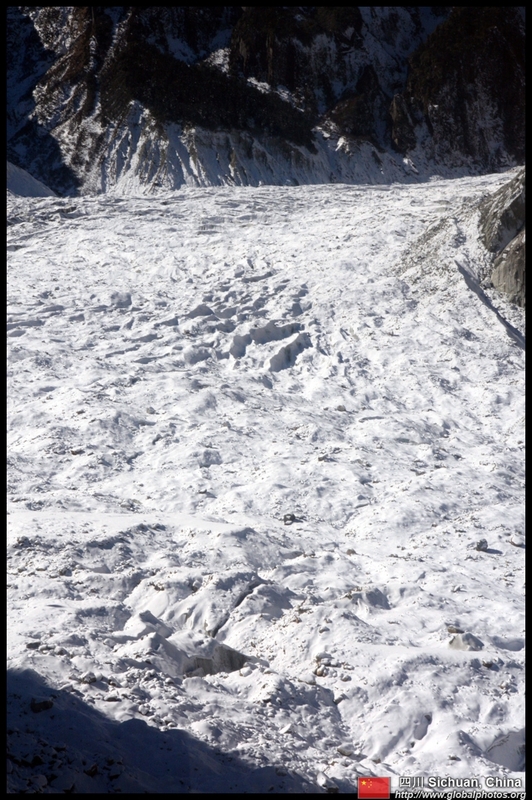 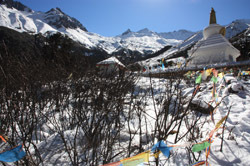 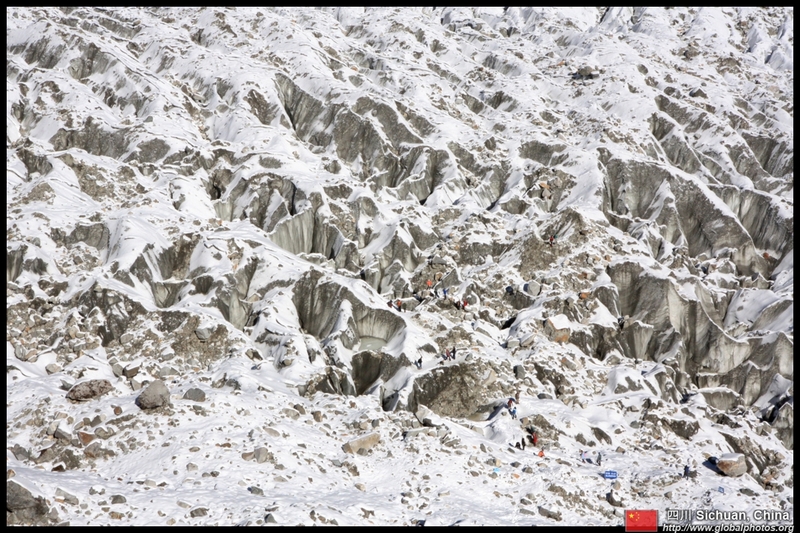 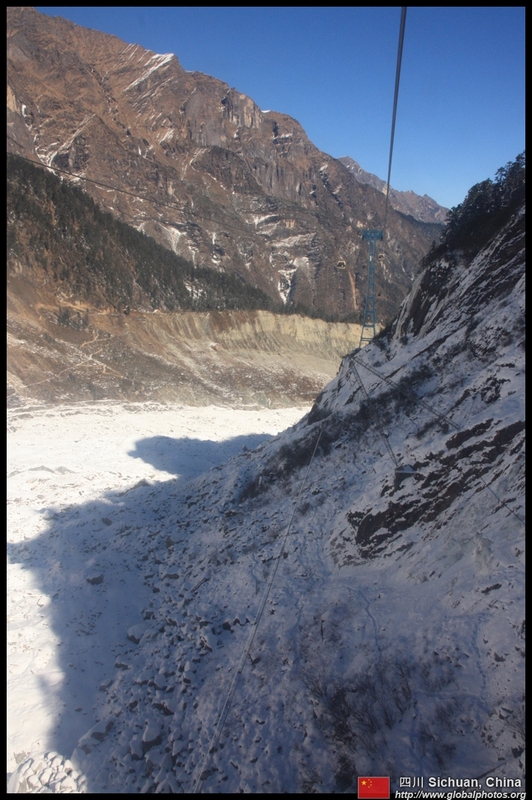 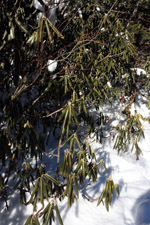 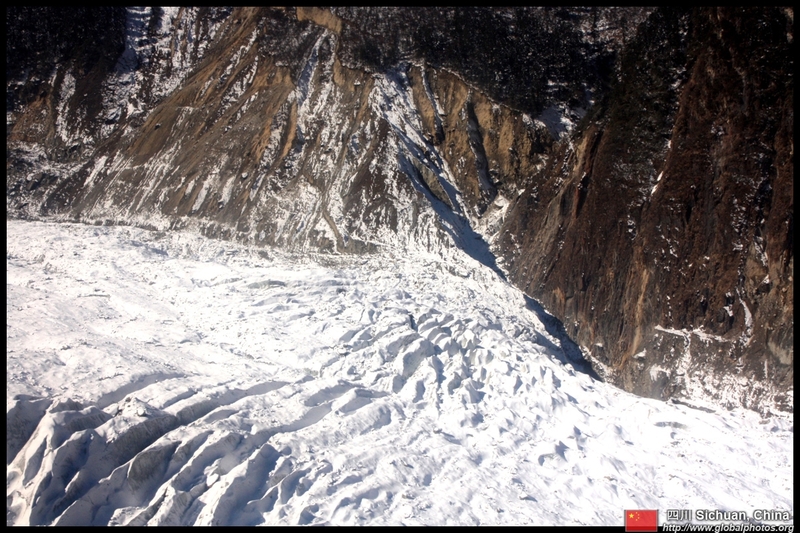 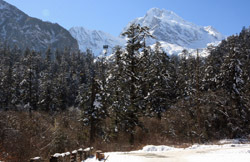 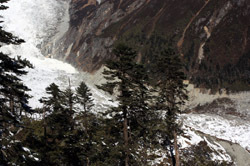 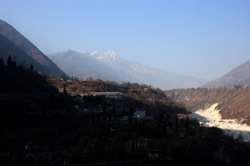 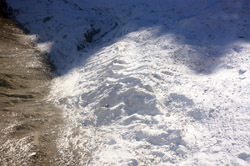 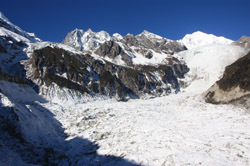 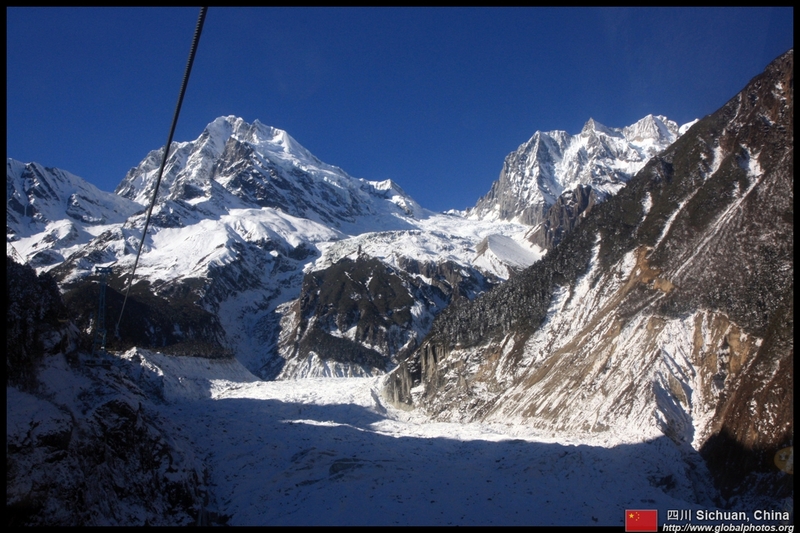 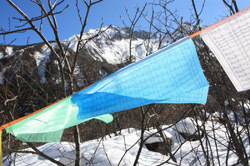 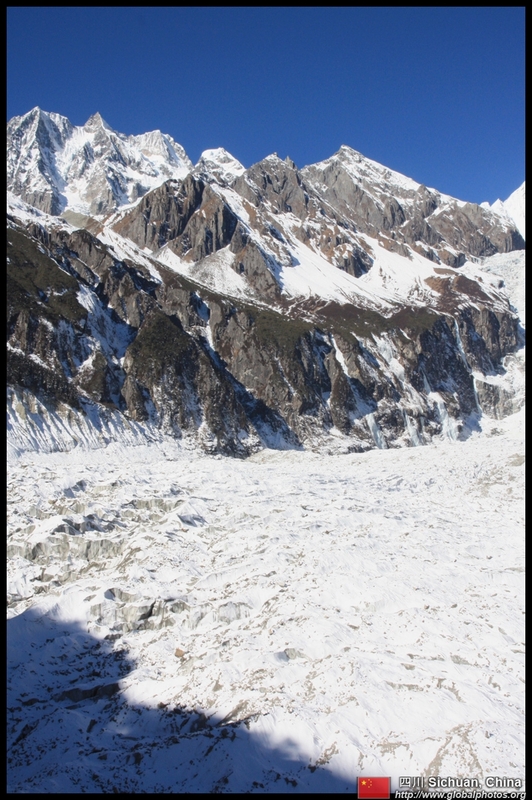 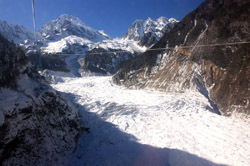 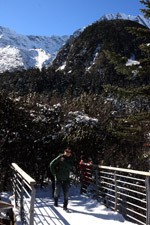 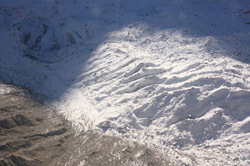 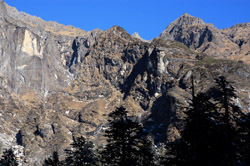 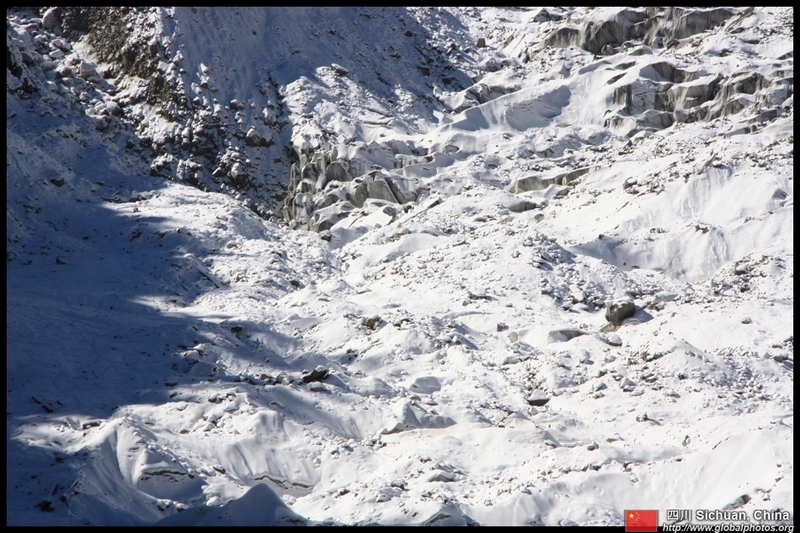 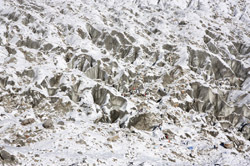 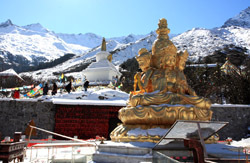 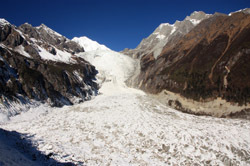 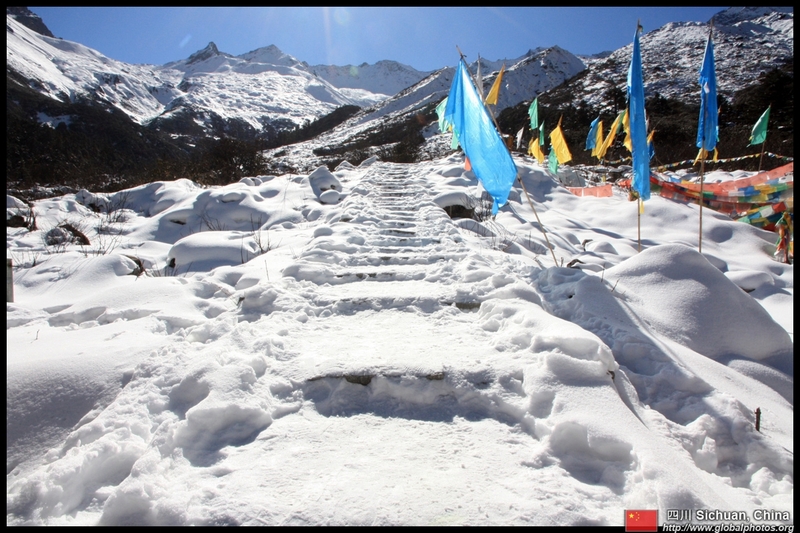 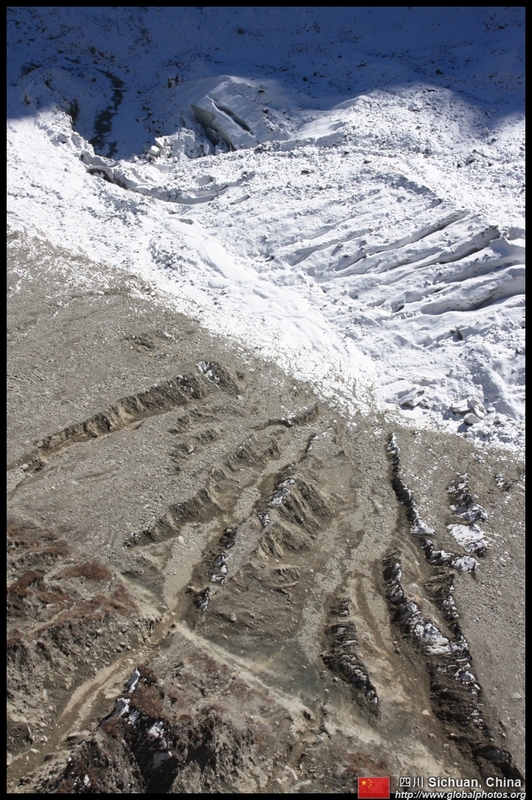 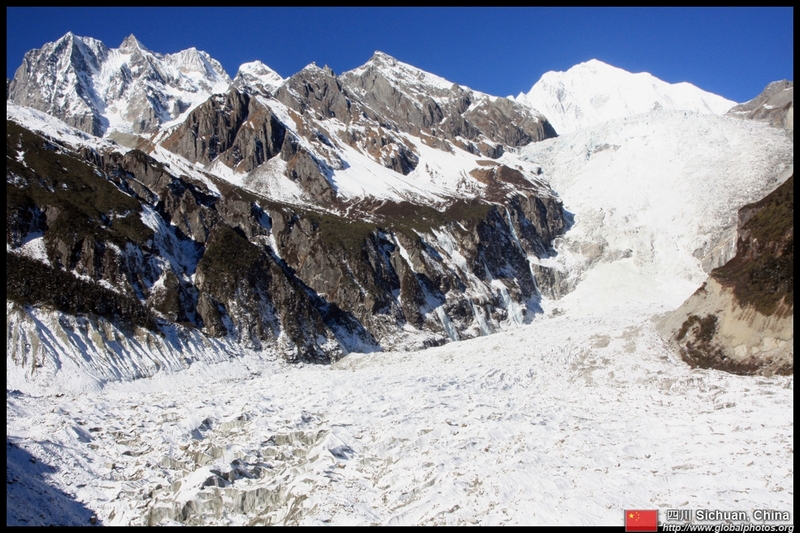 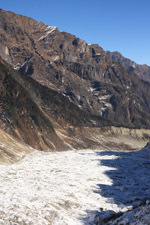 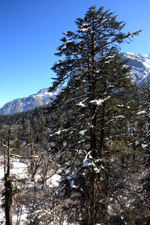 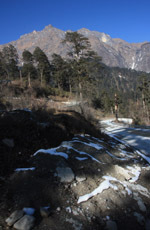 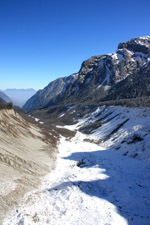 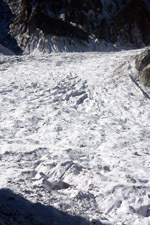 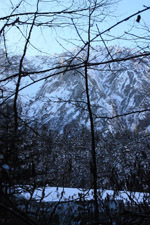 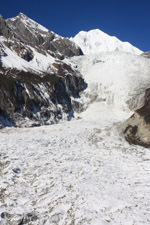 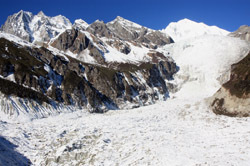 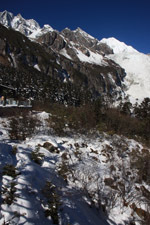 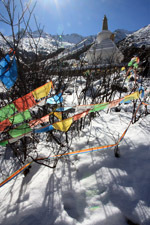 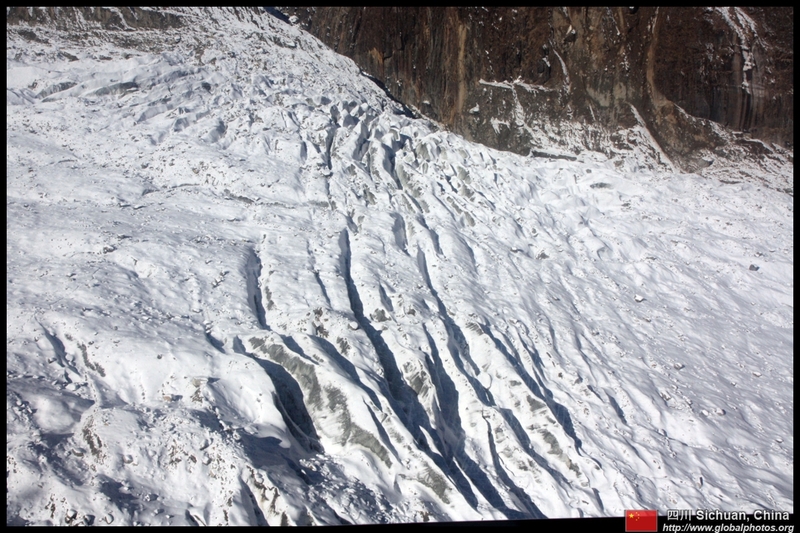 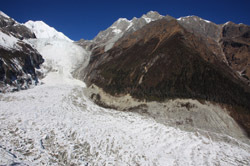 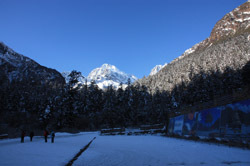 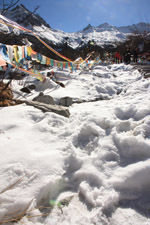 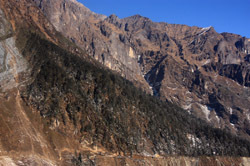 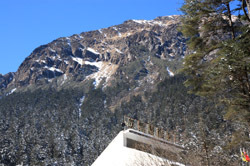 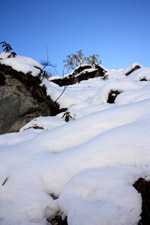 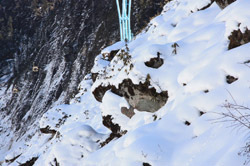 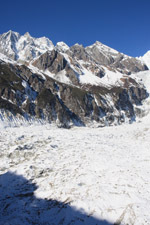 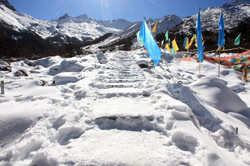 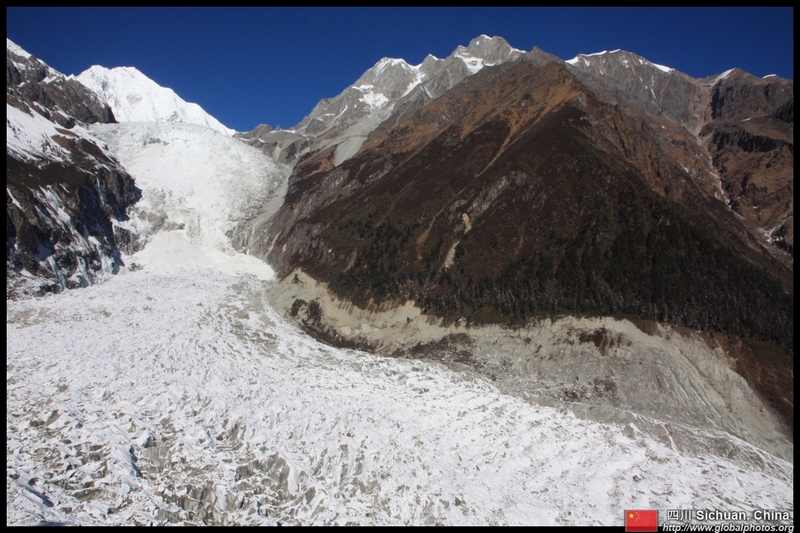 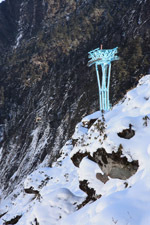 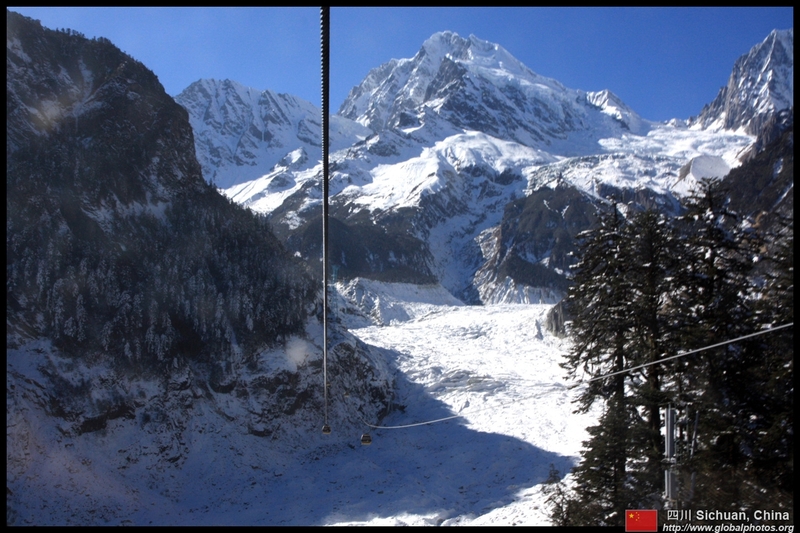 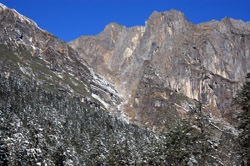 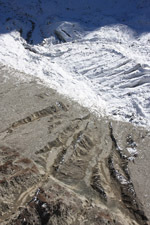 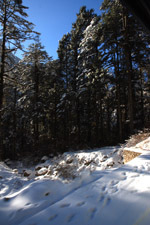 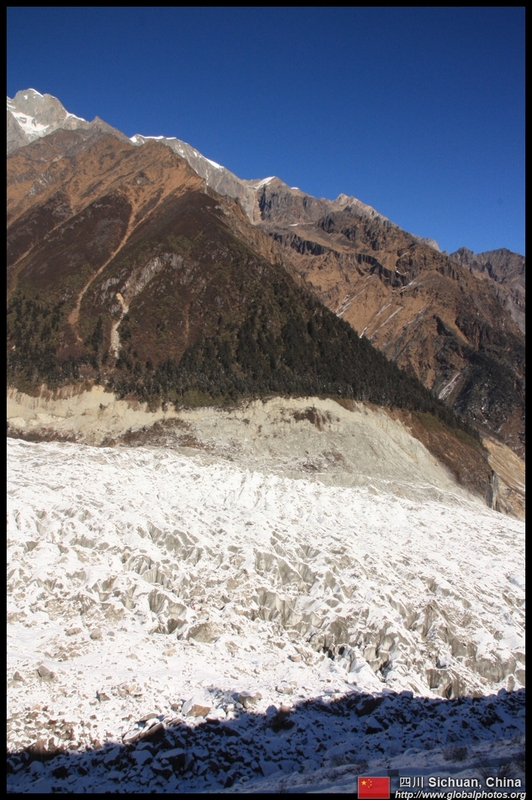 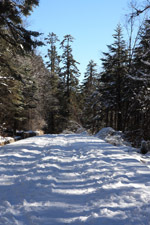 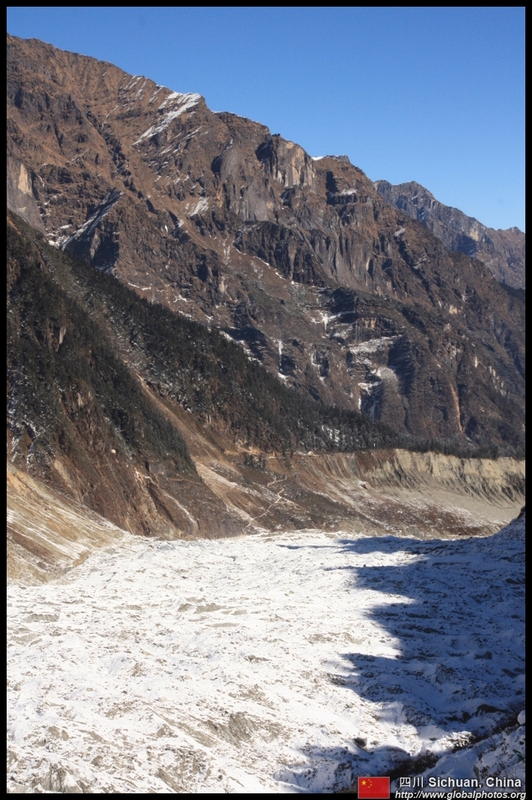 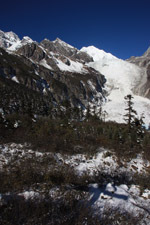 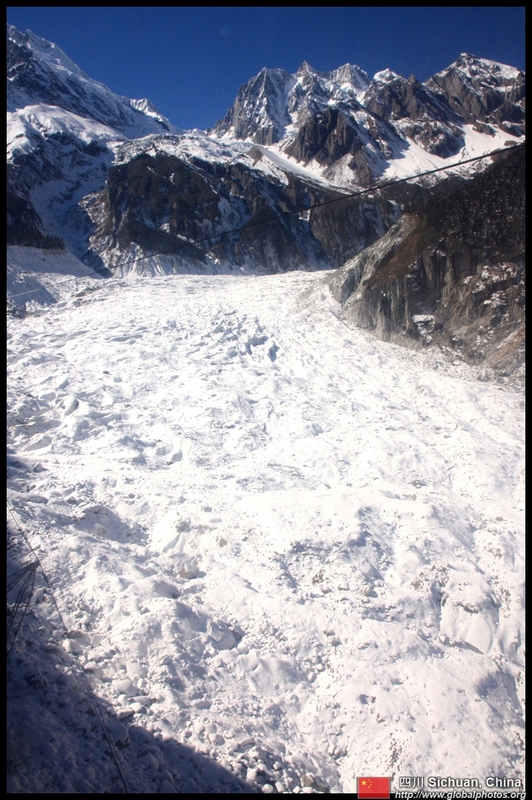 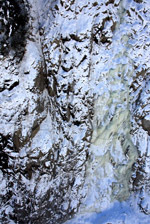 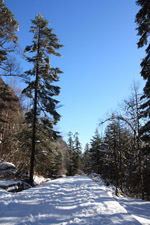 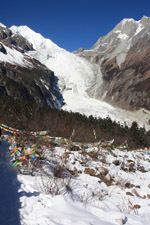 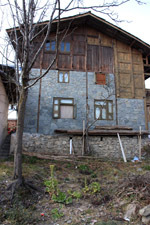 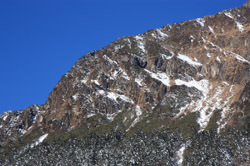 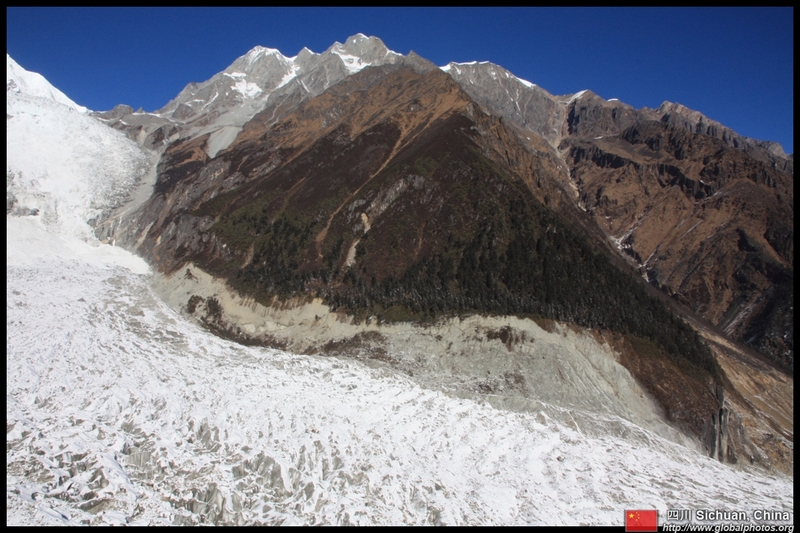 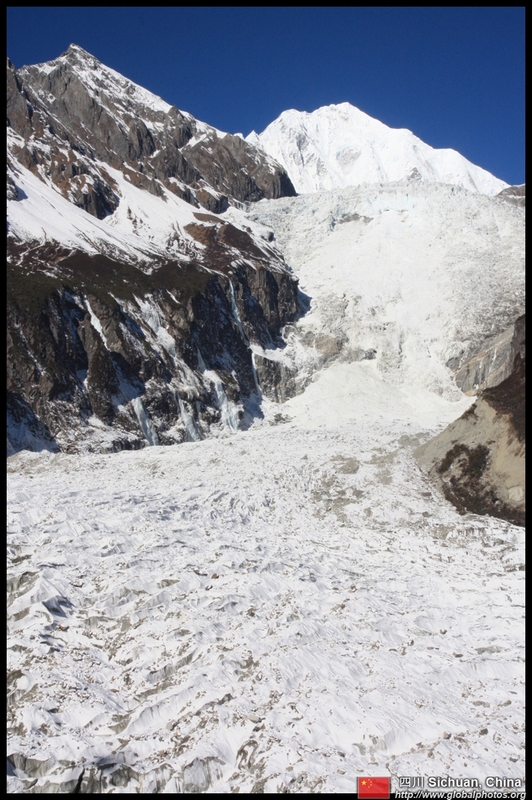 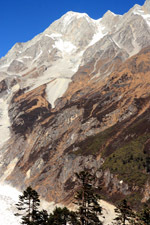 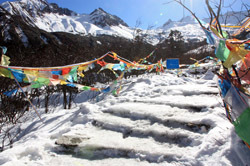 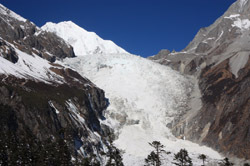 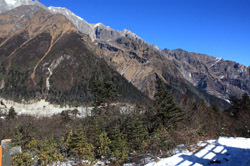 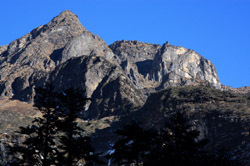 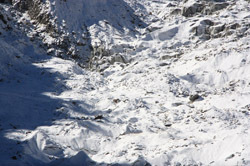 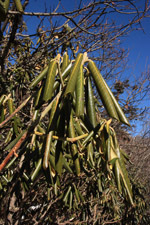 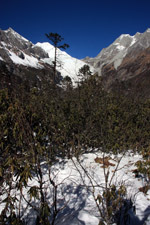 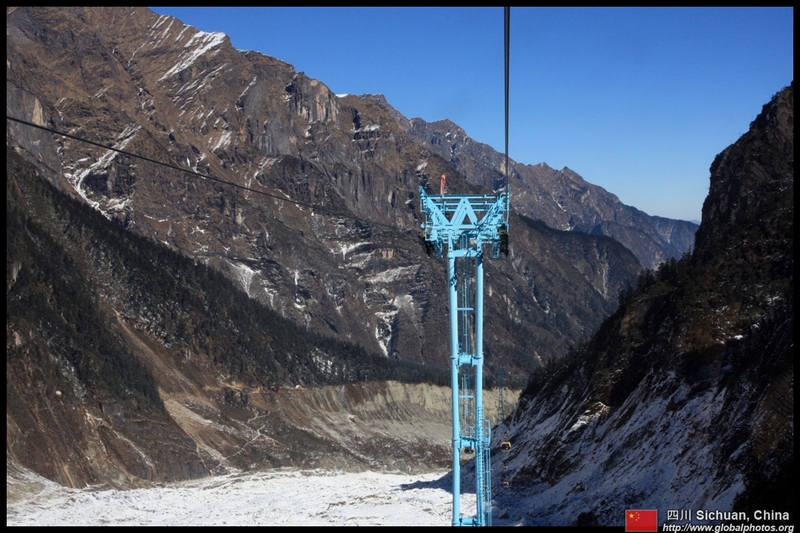 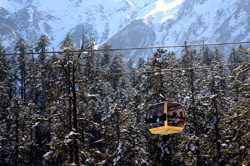 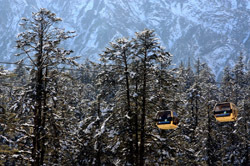 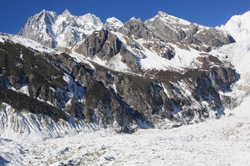 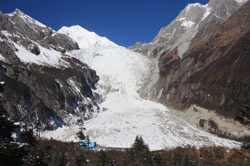 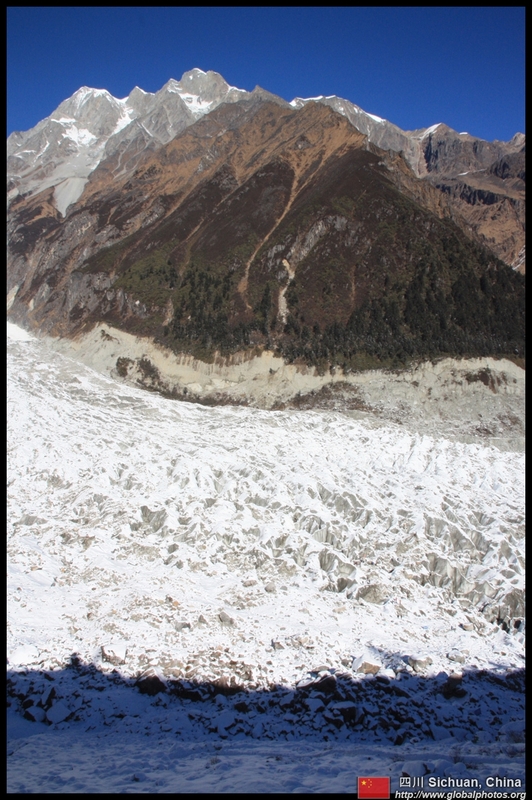 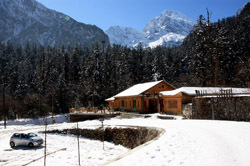 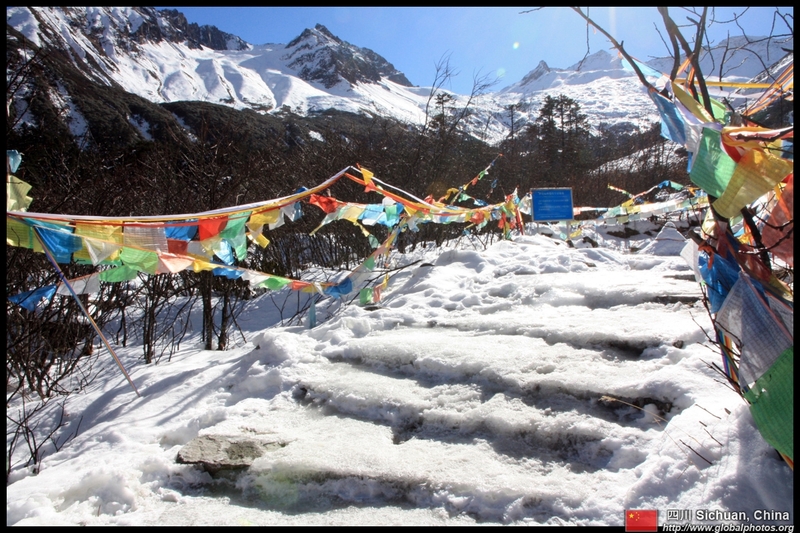 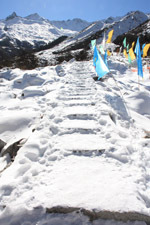 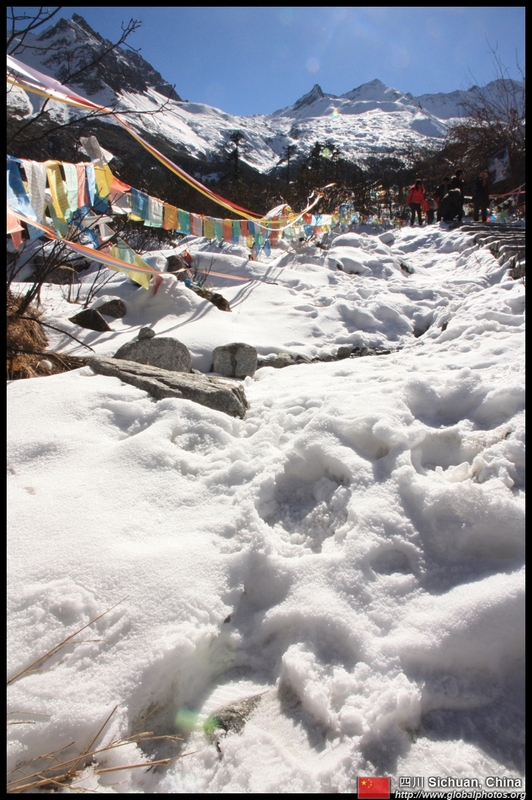 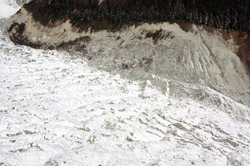 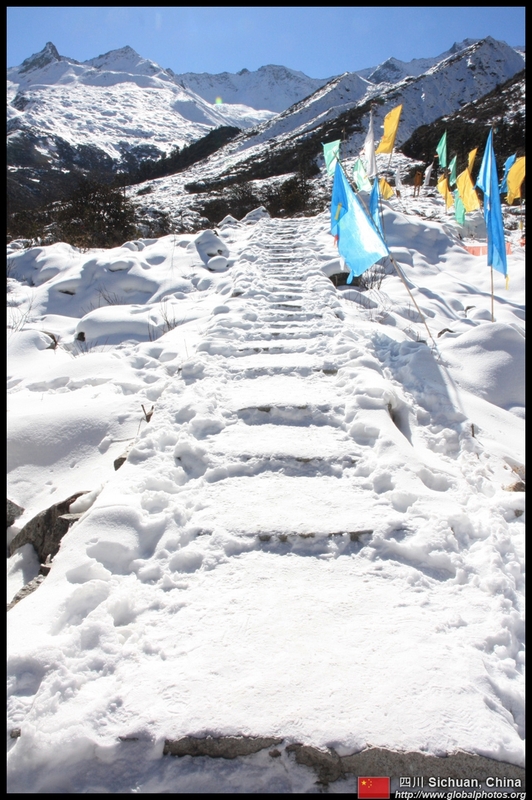 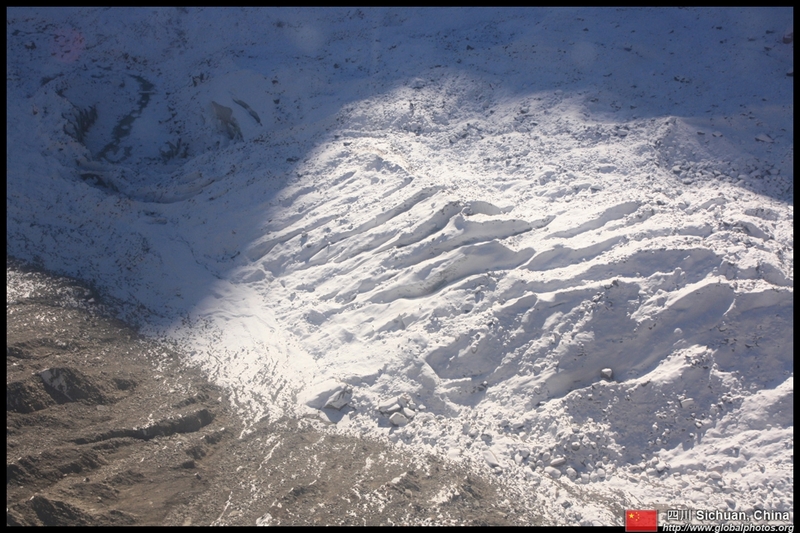 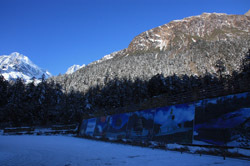 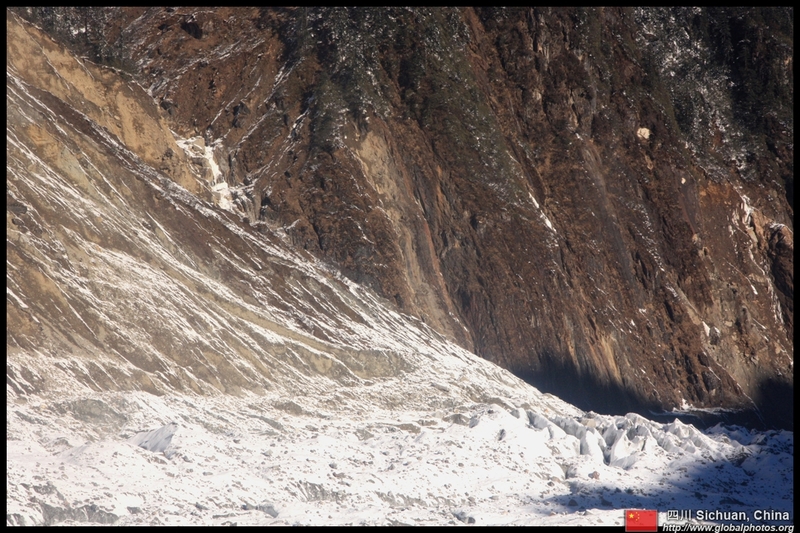 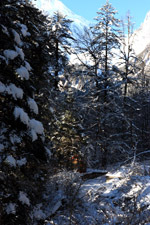 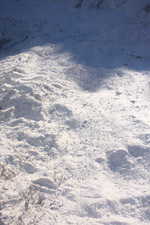 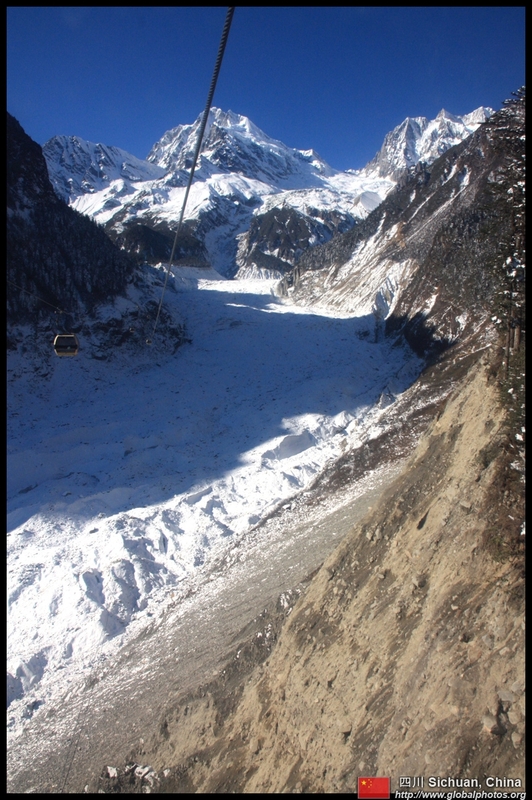 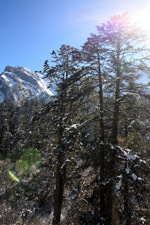 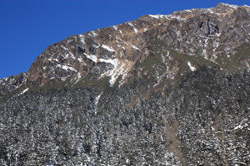 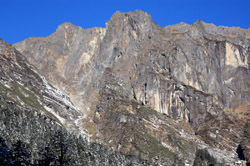 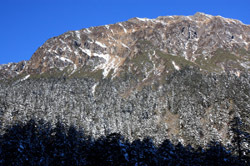 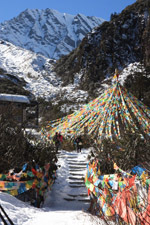 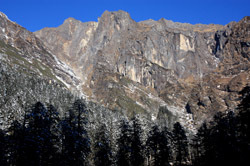 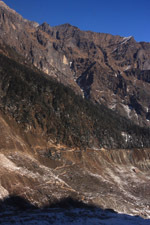 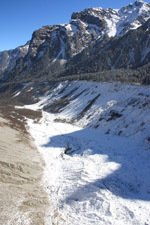 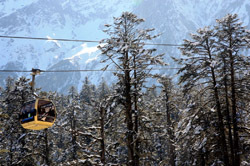 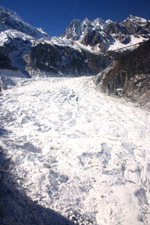 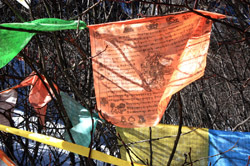 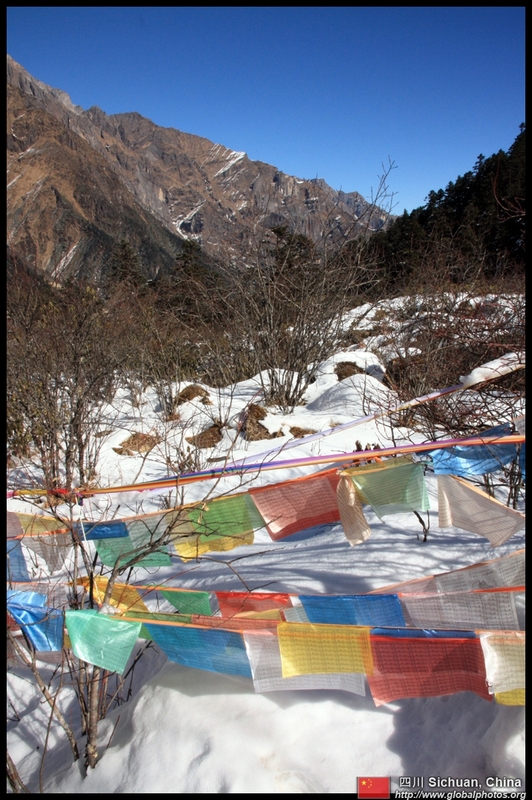 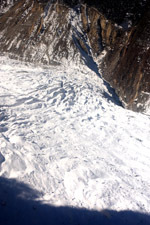 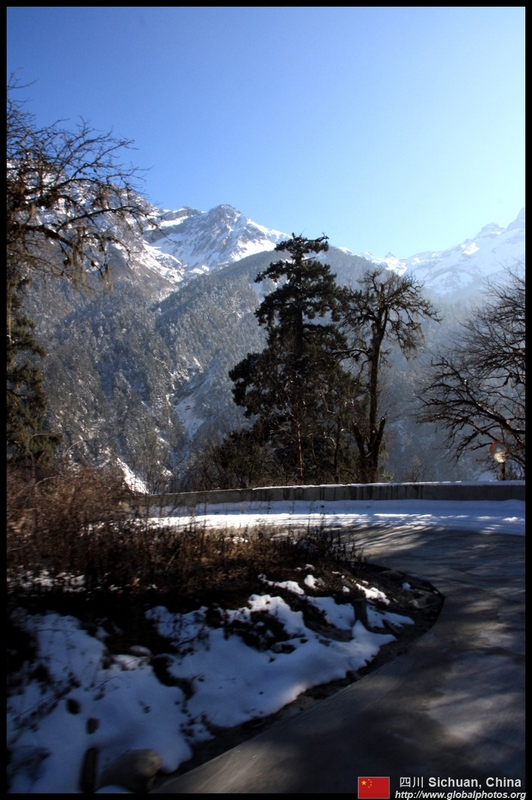 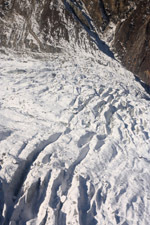 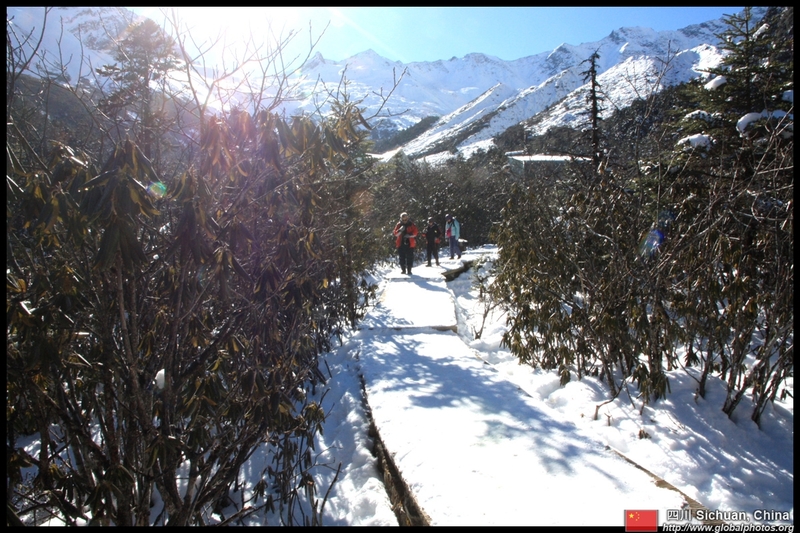 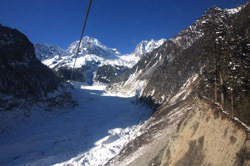 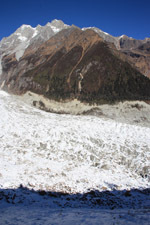 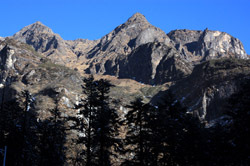 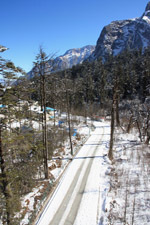 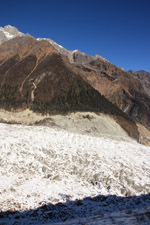 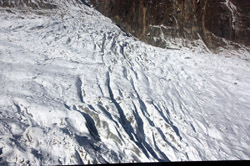 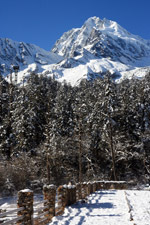 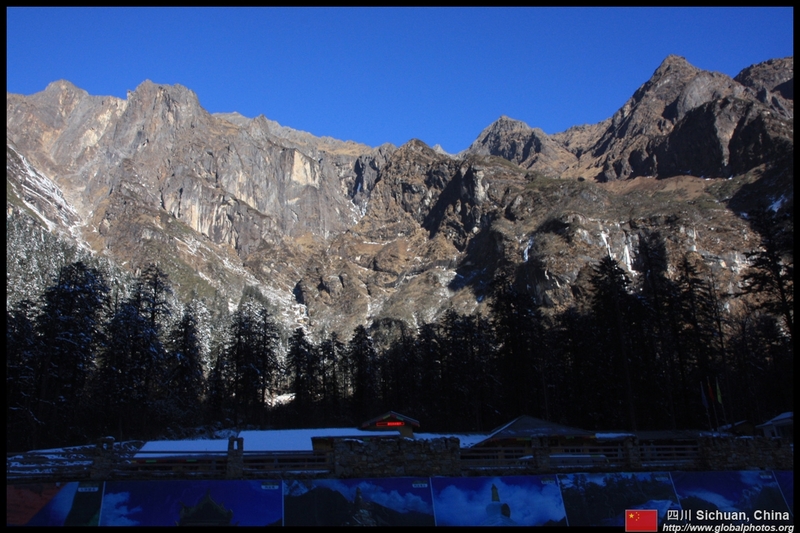 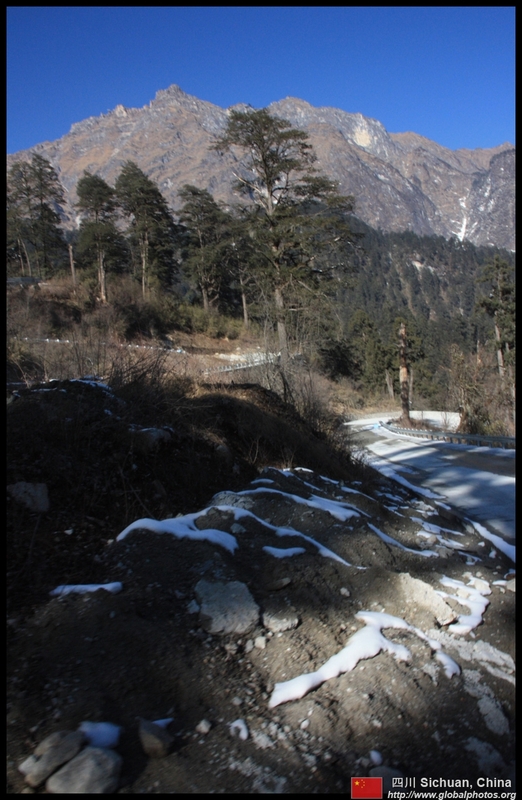 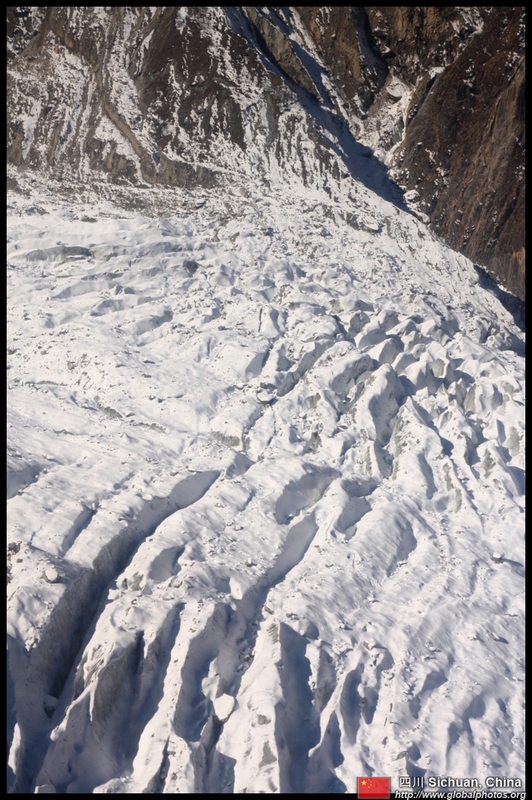 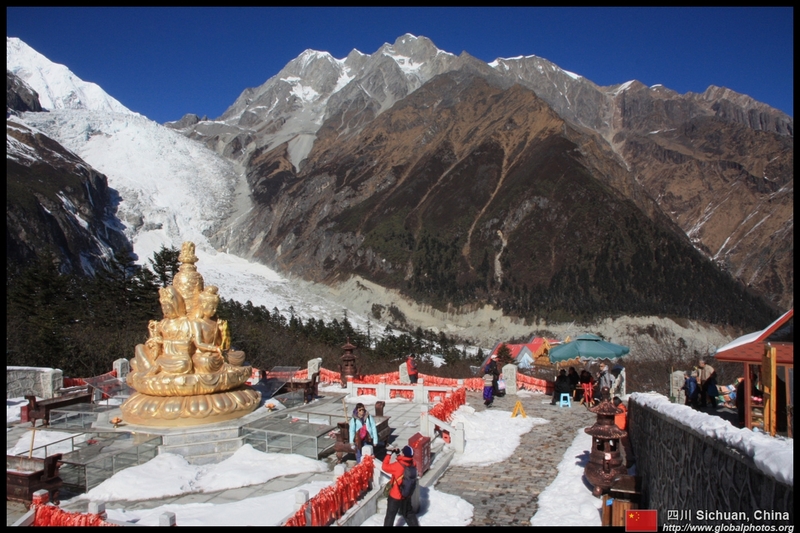 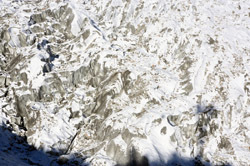 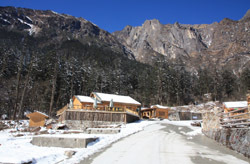 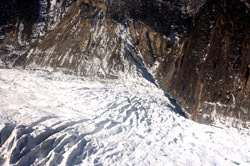 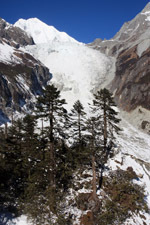 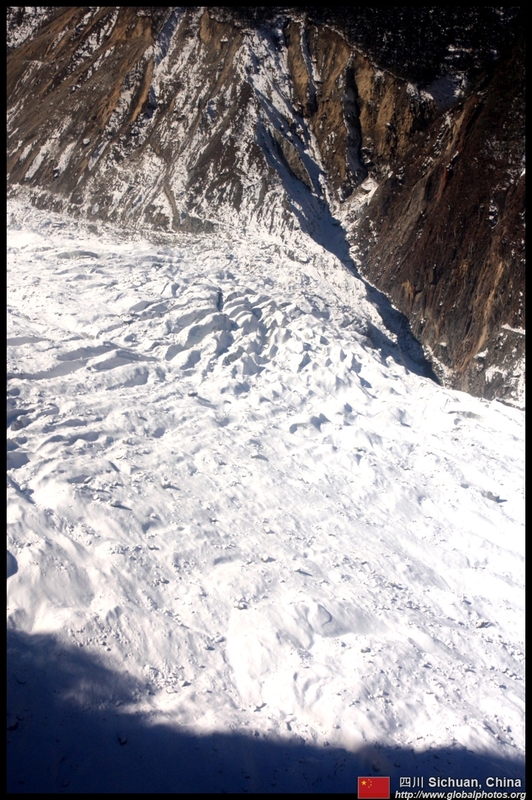 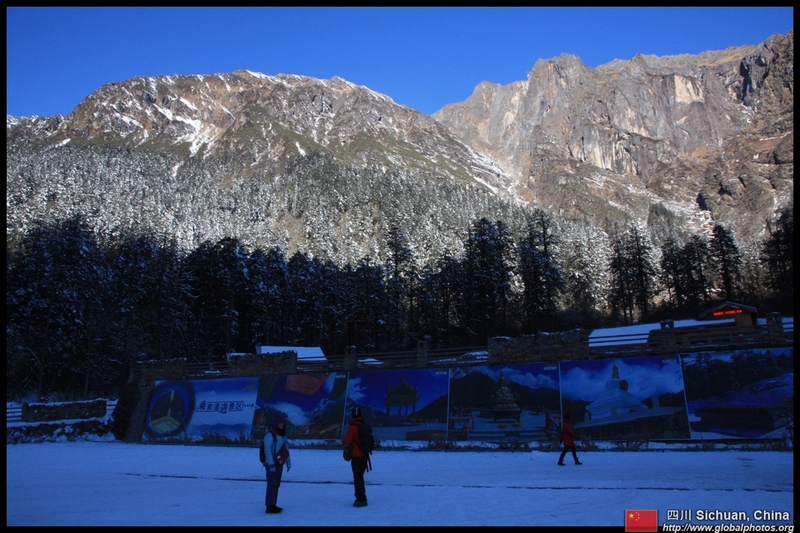 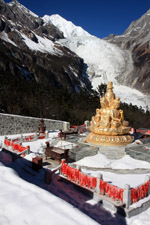 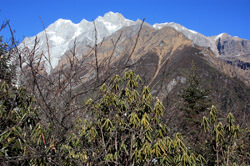 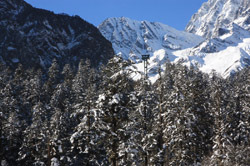 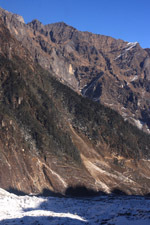 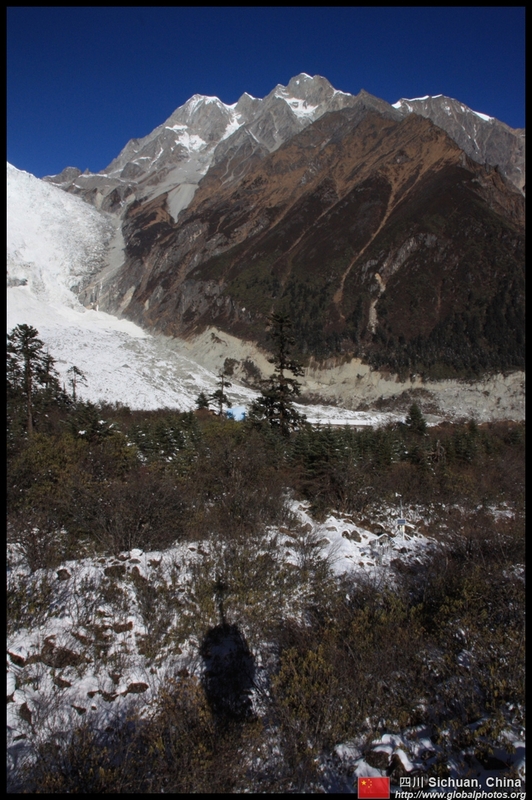 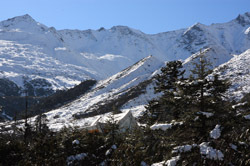 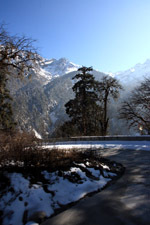 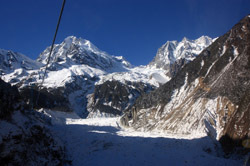 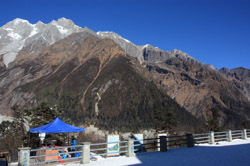 Visitors can opt to descend into the glacier for a walk. 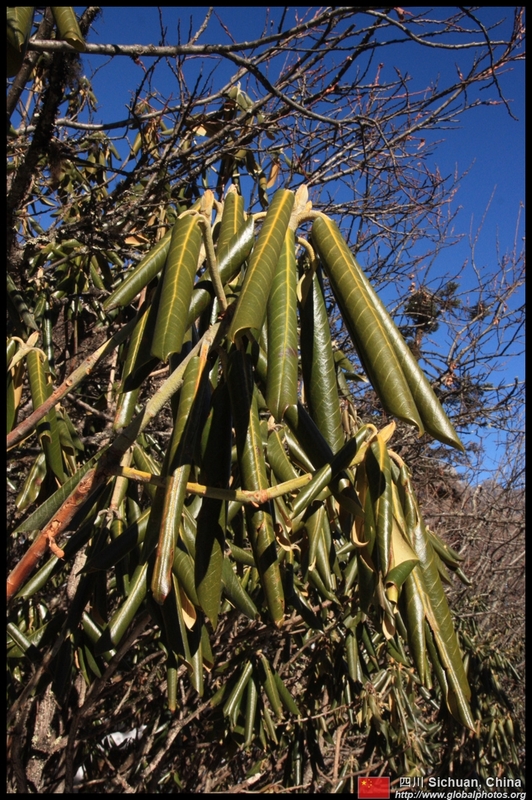 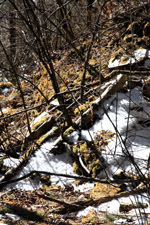 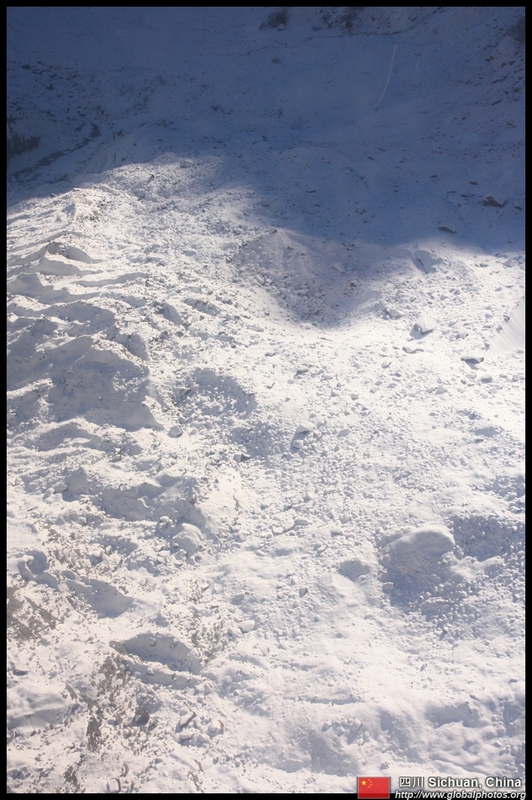 Having learned about the dangers of hidden crevices and noticing no particular cordoned-off areas, I decided to admire the natural beauty from the observation platform above. 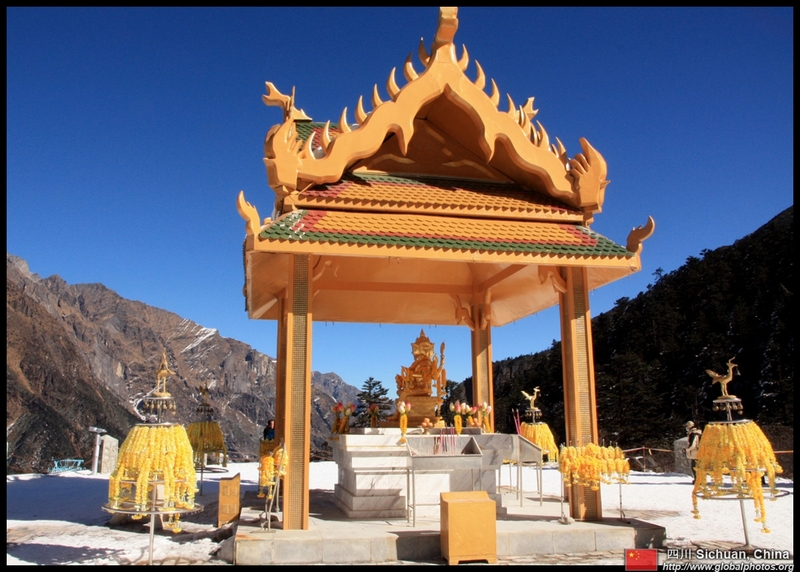 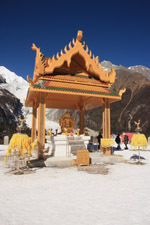 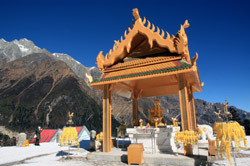 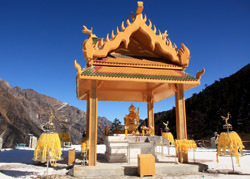 Strangely, a Thai temple adorns the visitor's area at the top of the cable car. 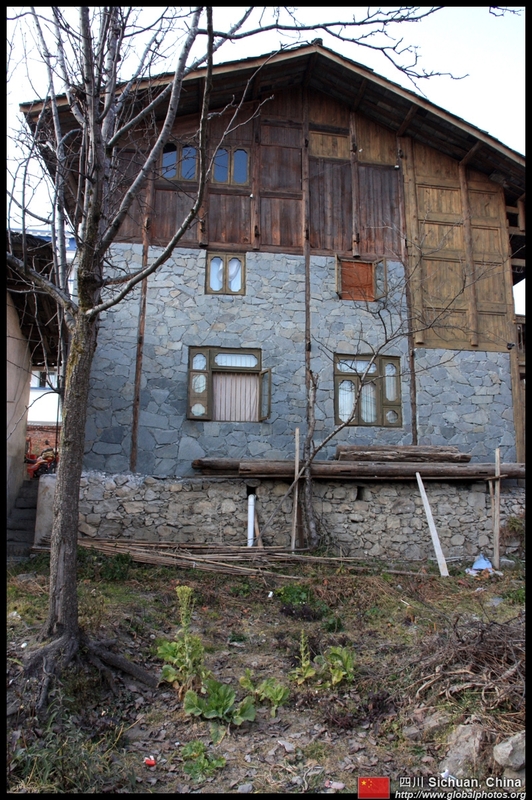 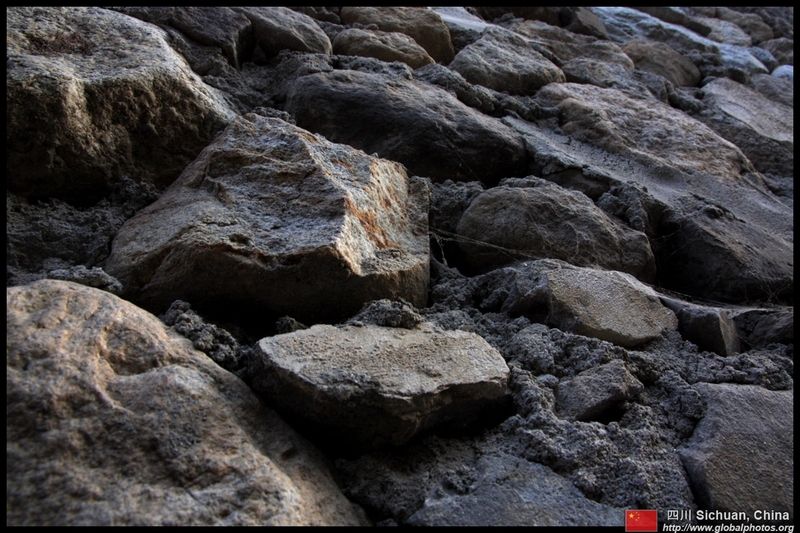 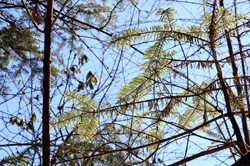 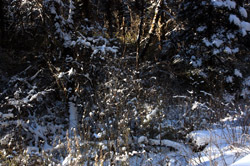 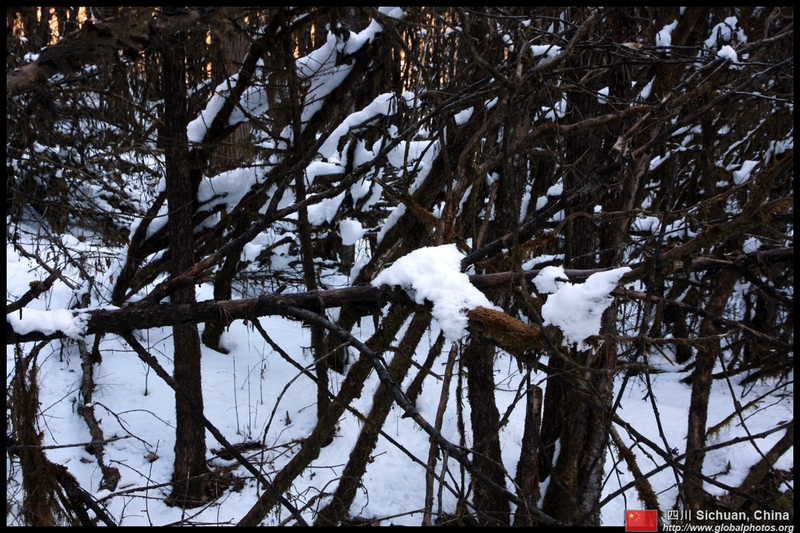 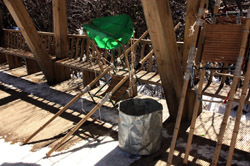 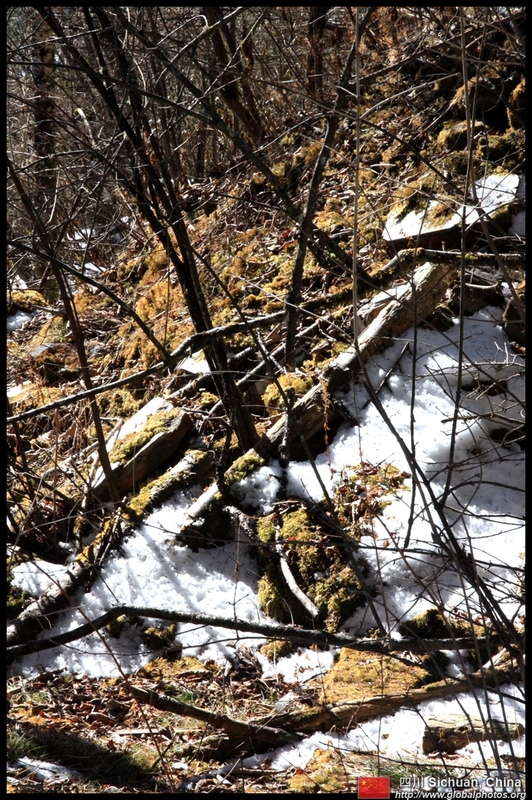 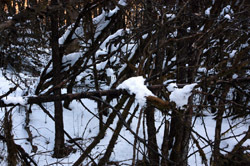 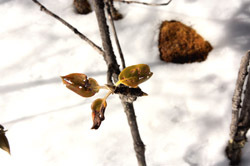 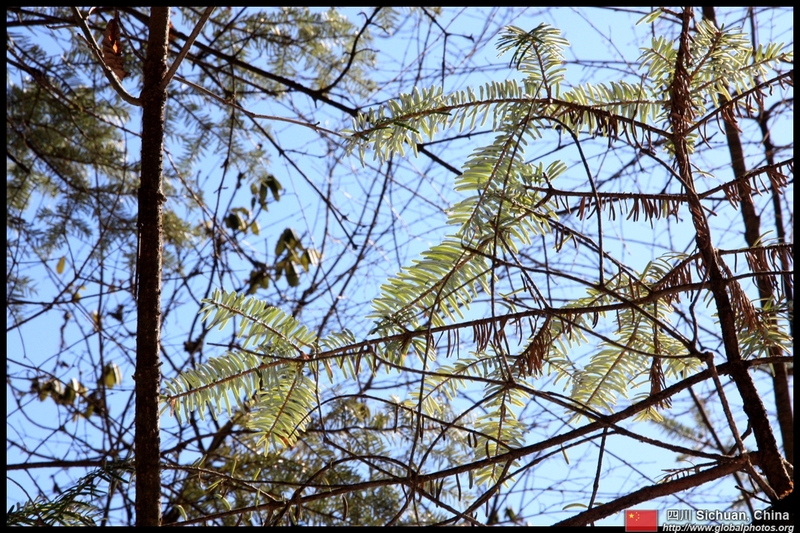 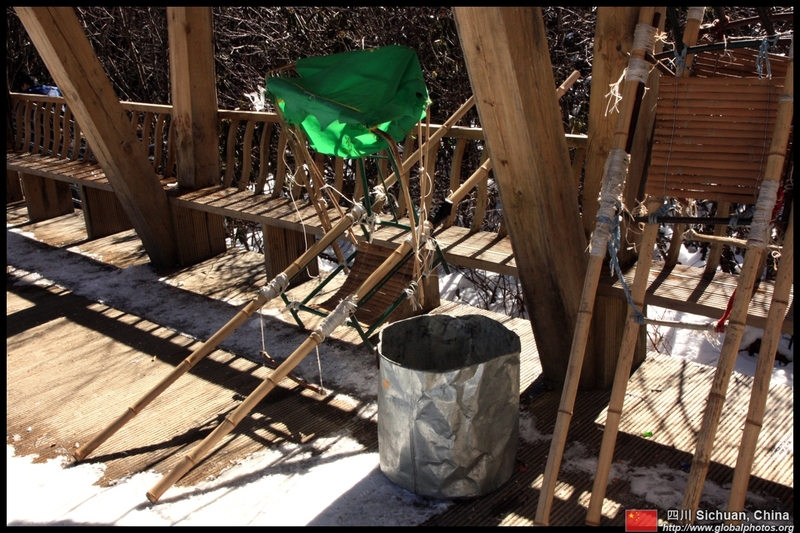 Altitude sickness kicks in, and all movements must slow down to prevent collapse. 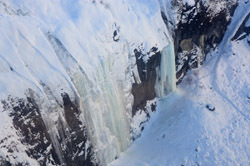 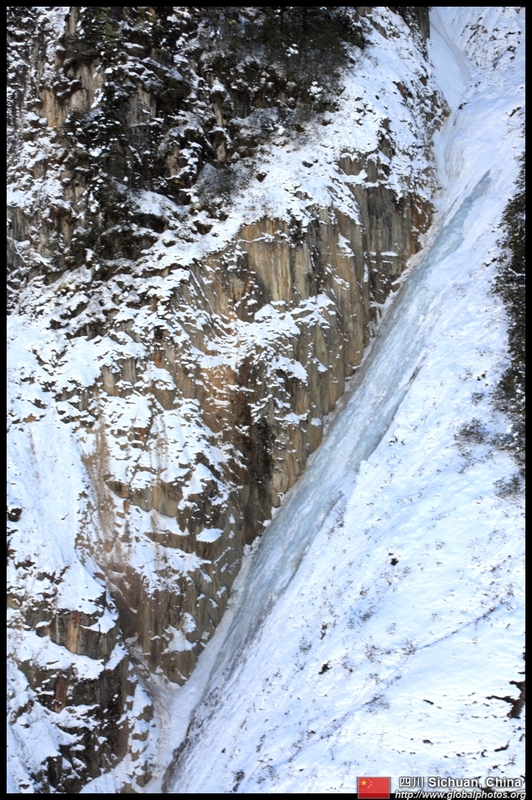 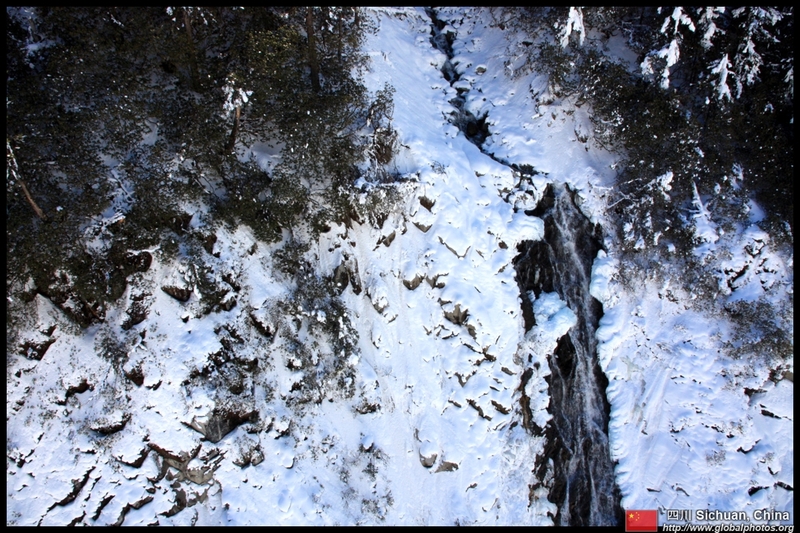 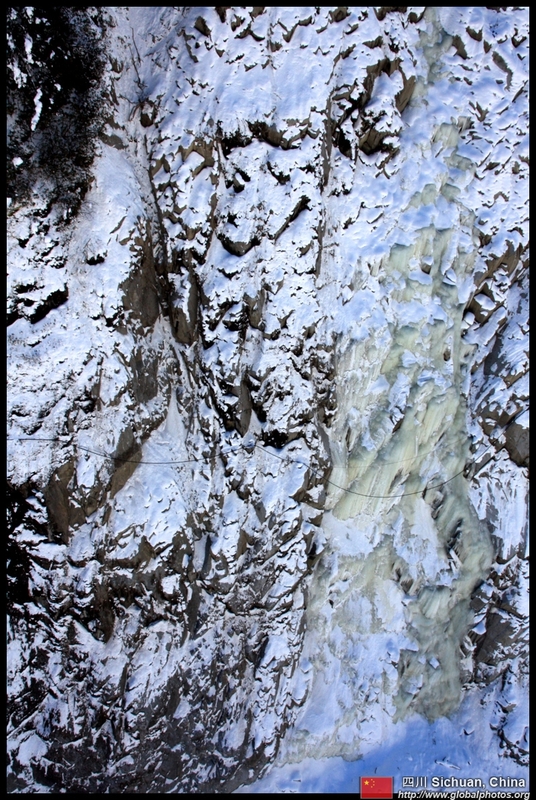 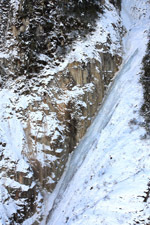 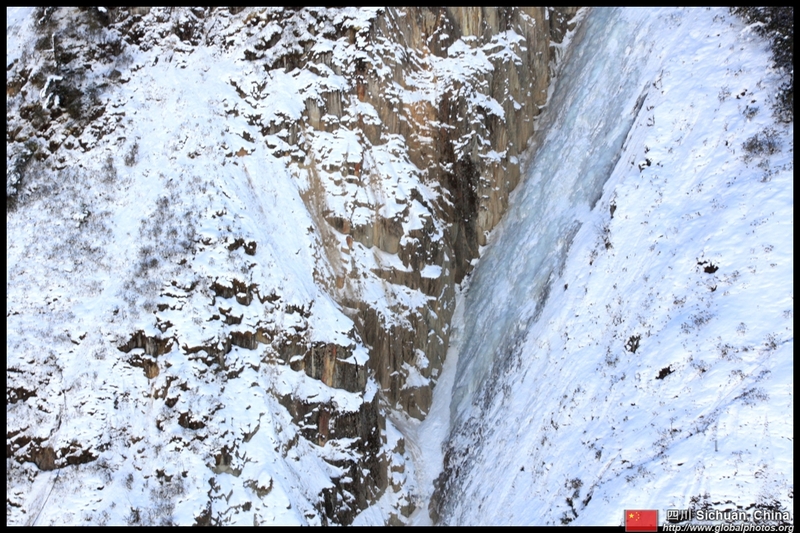 This waterfall freezes during the winter. 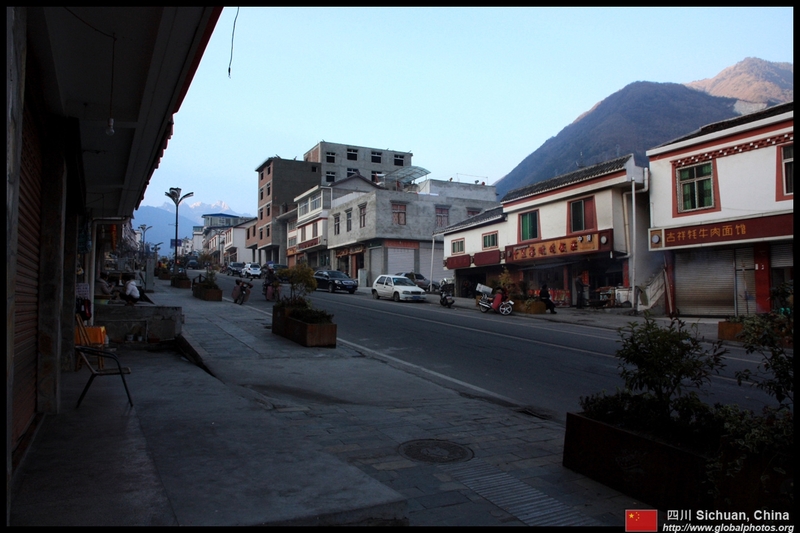 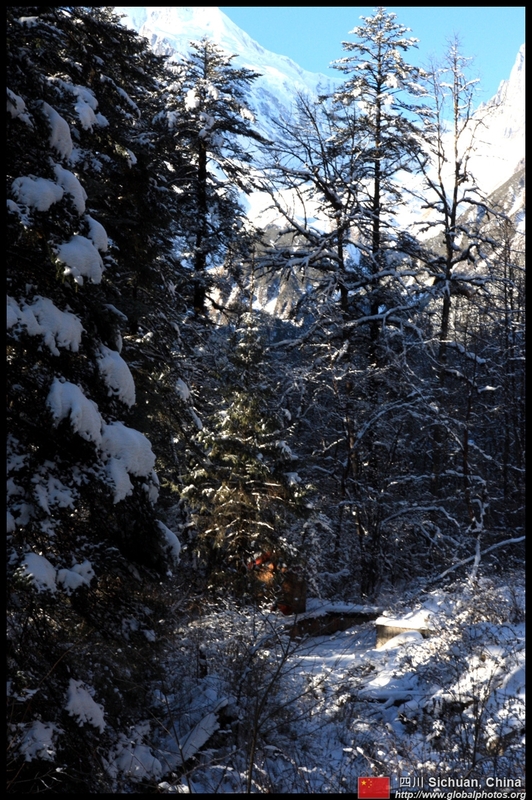 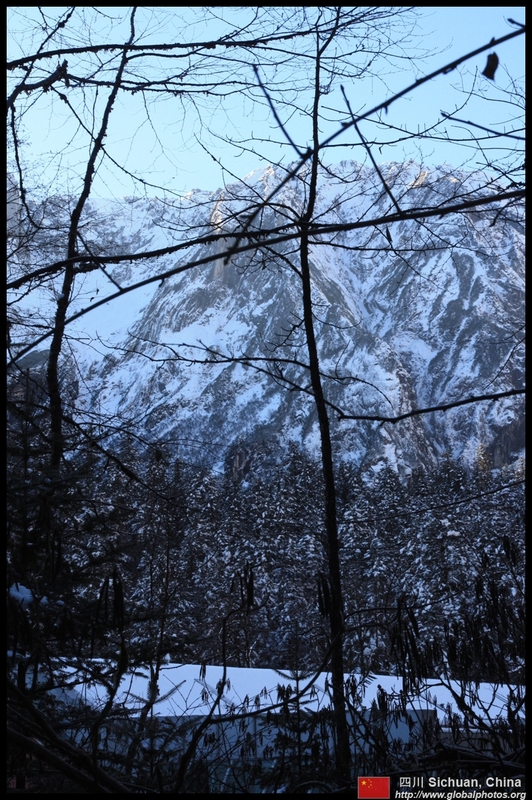 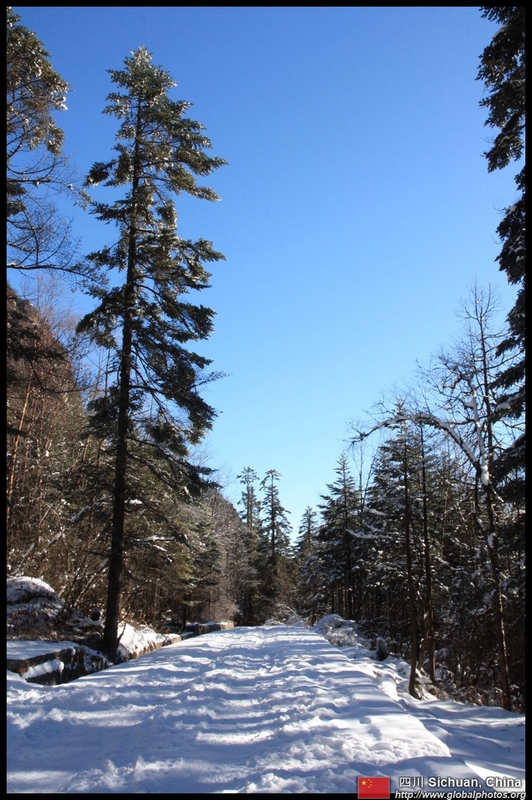 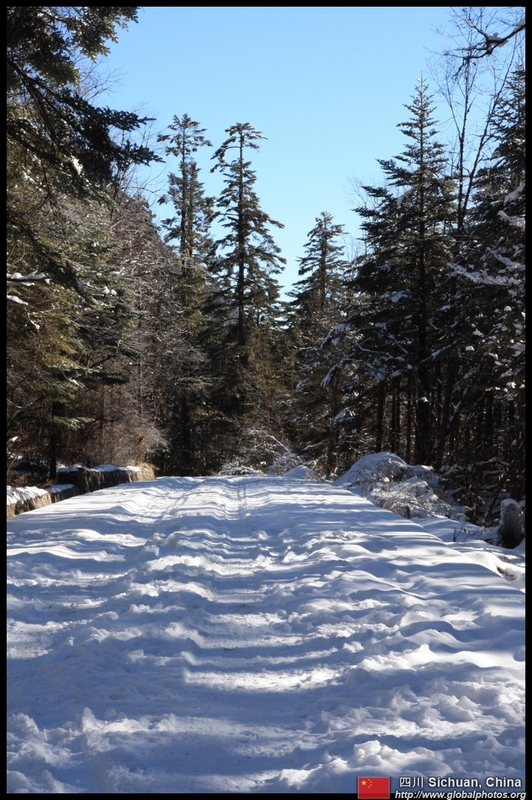 While pretty, Hailougou was not so busy on this New Year's day. 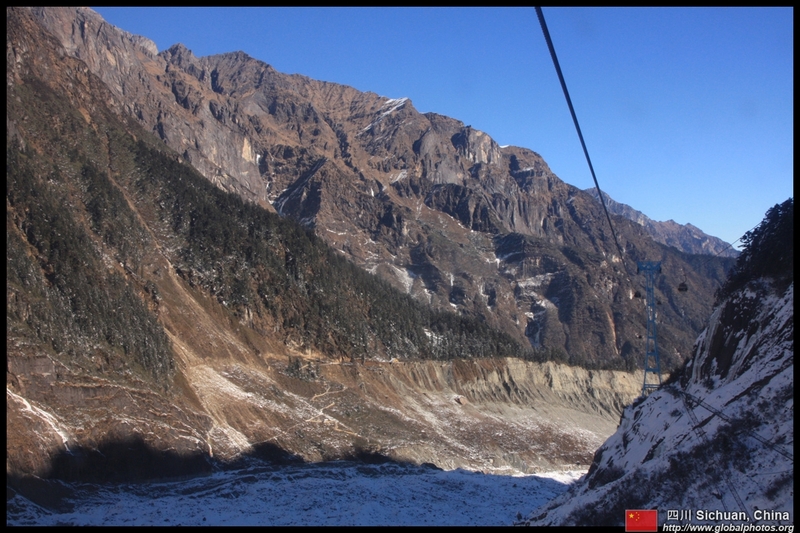 I got a cable car all to myself for the ride down. 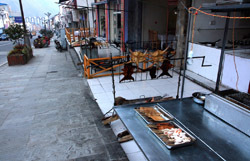 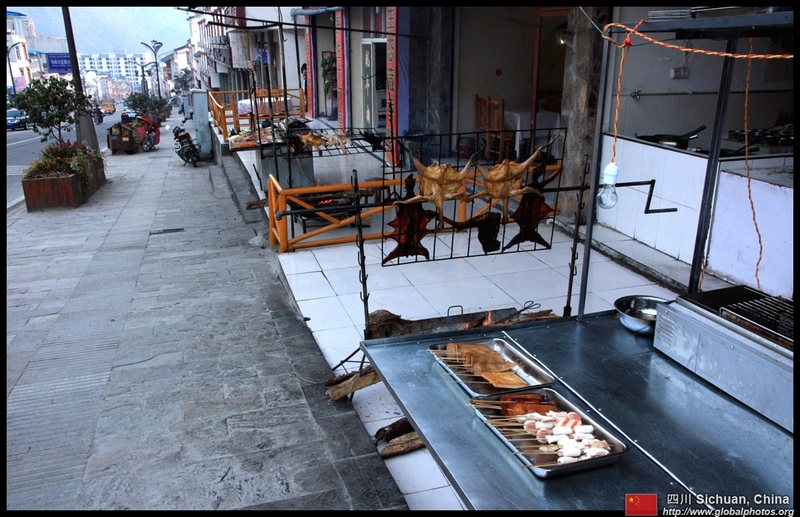 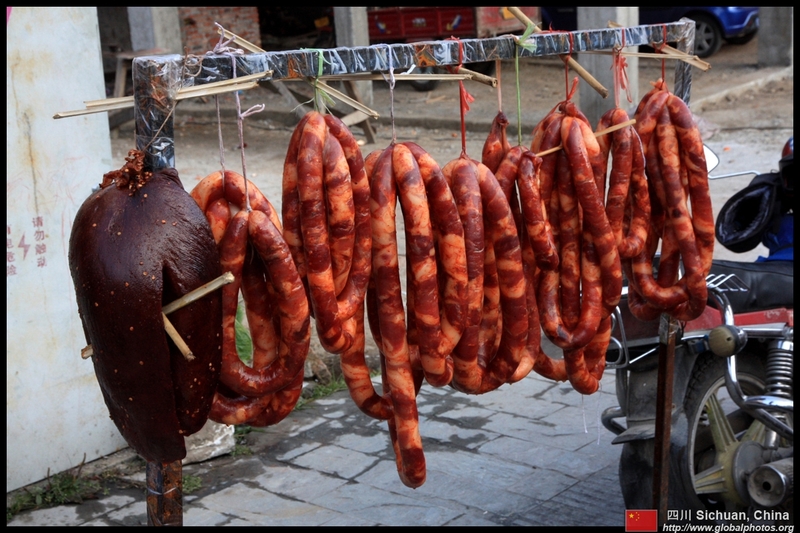 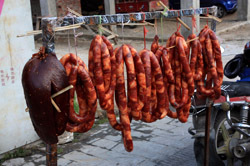 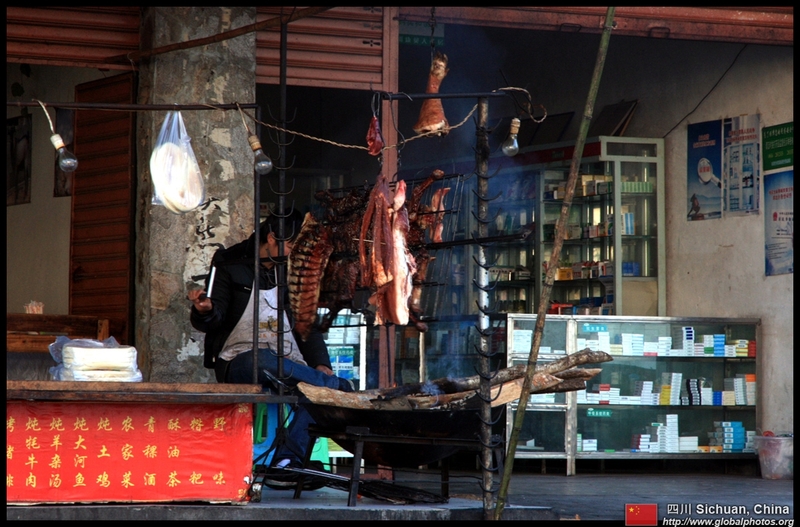 Heading into town, I noticed the aroma of delicious BBQ's all along the main street.